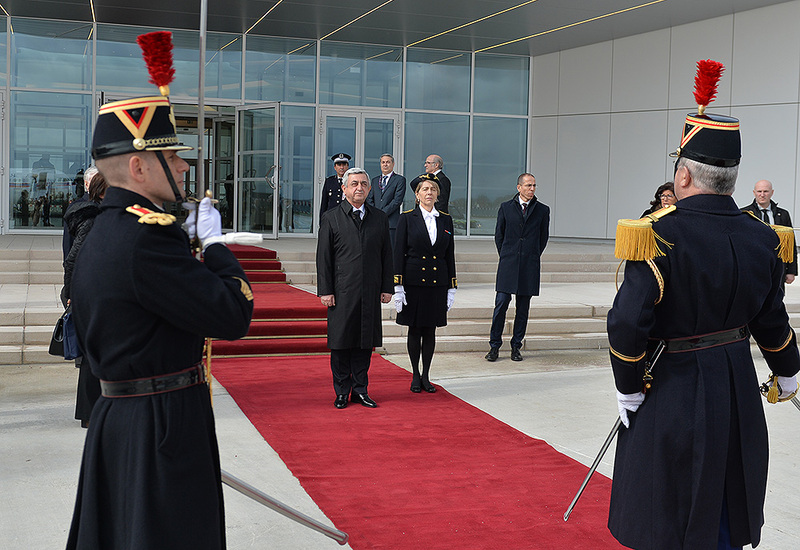 President Serzh Sargsyan has arrived to France on official visit by the invitation of the President of France François Hollande. 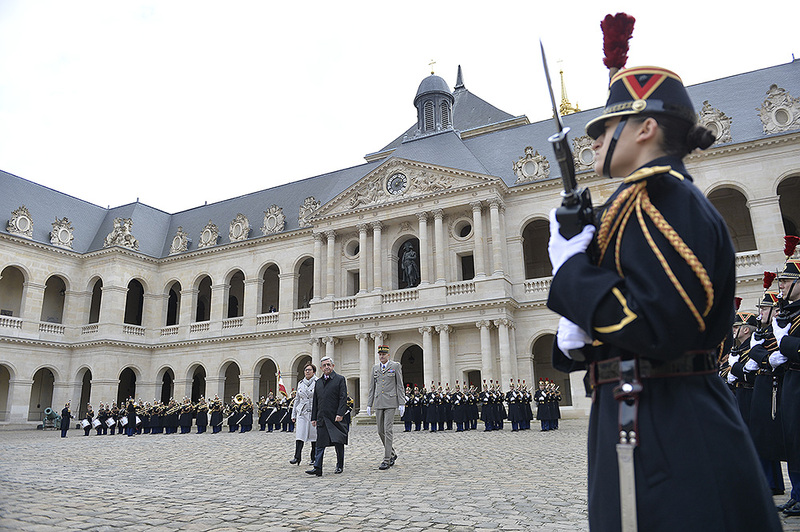 At the Court of Honor of Les Invalides Palace in Paris there took place the official ceremony of welcoming the President of Armenia. 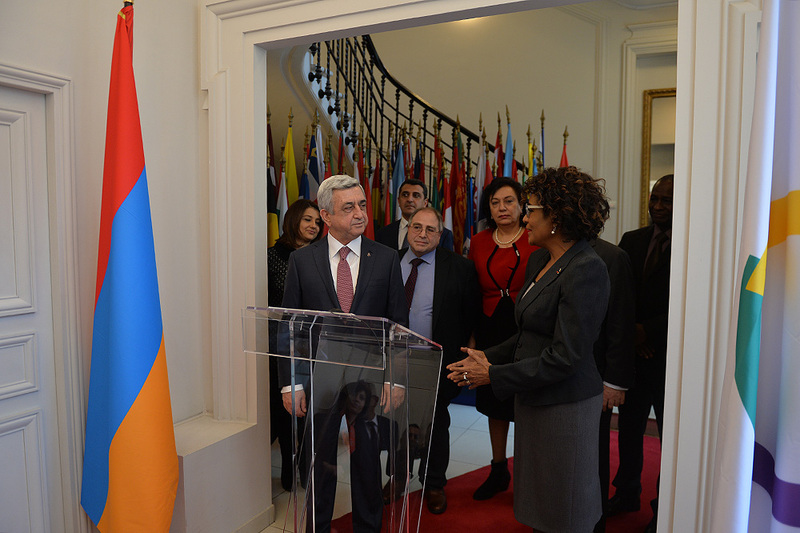 After the welcoming ceremony, President Sargsyan and his delegation left for the headquarters of the International Organization of Francophonie, where he will meet with the Secretary General of the Organization Michaëlle Jean. 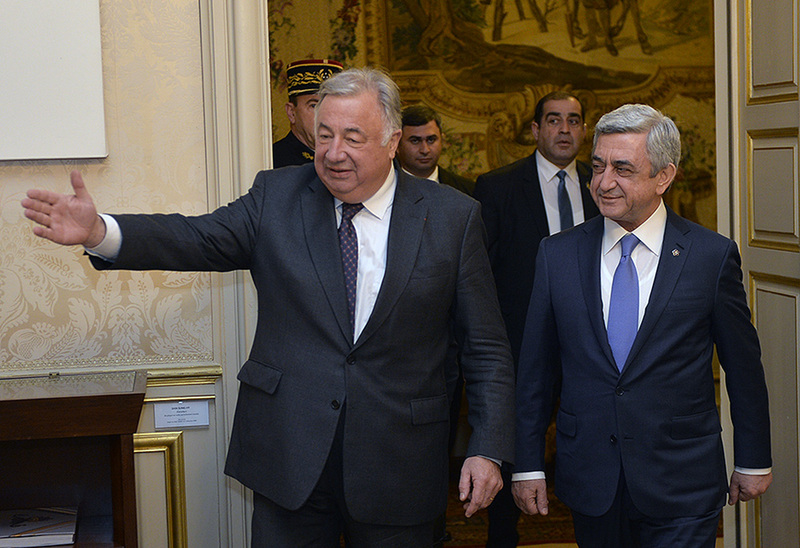 This meeting will give a start to the program of President Sargsyan’s official visit. 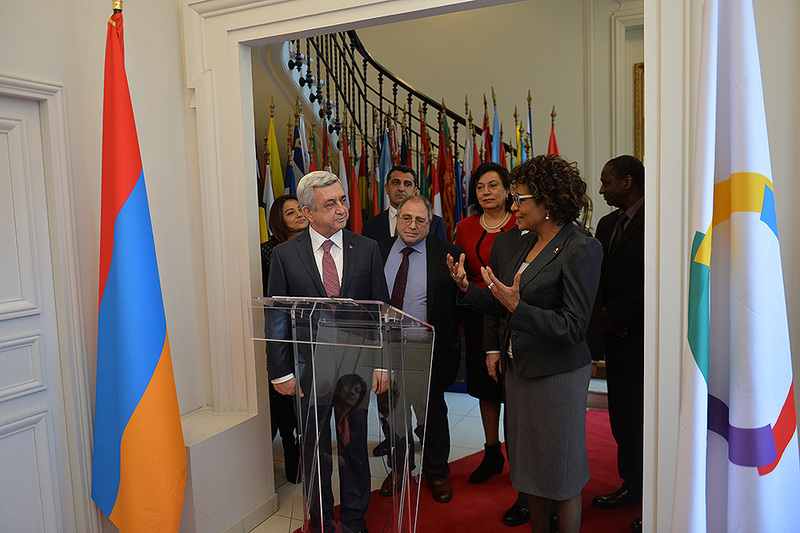 President Serzh Sargsyan, who is in France on official visit, at the headquarters of the International Organization of Francophonie met with the Secretary General Michaelle Jean. The President underscored that the meeting is first of all a good opportunity to recap the accomplishments of previous years and pre-set following steps, considering the fact that next year marks the 10th anniversary of Armenia’s membership to the Organization of Francophonie. 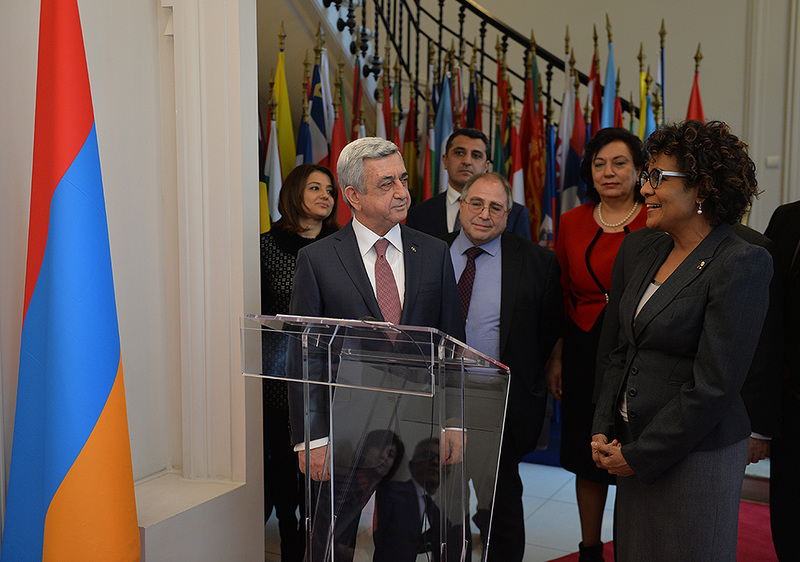 Serzh Sargsyan noted that through the course of her cooperation with the Organization, Armenia has never stopped her efforts aimed at promoting the values of the Organization and dissemination of French language. With the assistance of the Organization of Francophonie in Armenia was established a full cycle of education in French - from kindergarten to university which is functioning now. According to the President, cooperation with the Organization has not only promoted French language and Francophone culture in Armenia, but also became a platform for the strengthening of the bilateral relations with the member and observer states and expansion of international cooperation. 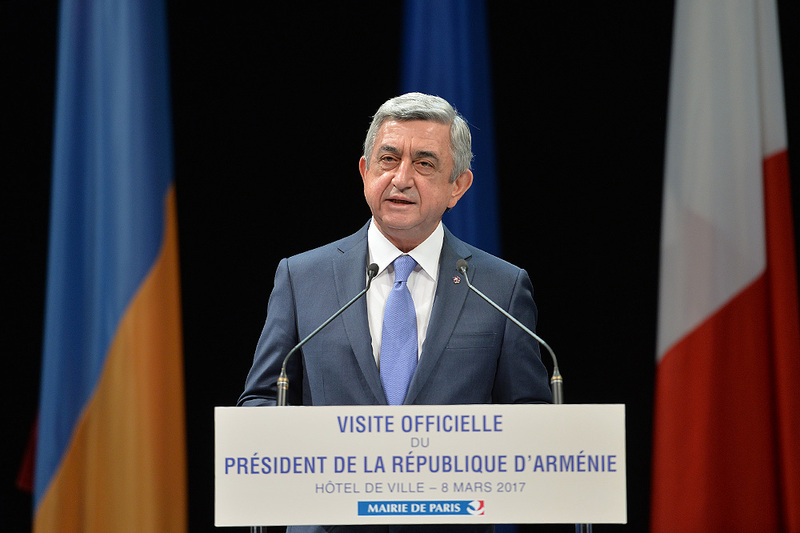 With this regard, in the President’s words, the organization of the 31st Ministerial Conference of Francophonie in Yerevan in 2015 was of critical importance. 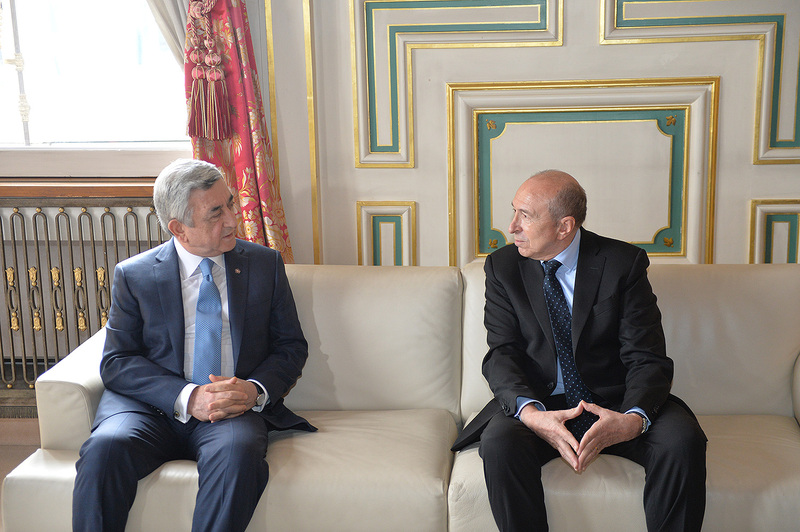 The President of Armenia and the Secretary General of the International Organization of Francophonie stressed the importance of a close cooperation established between Armenia and partner structures of the Organization. 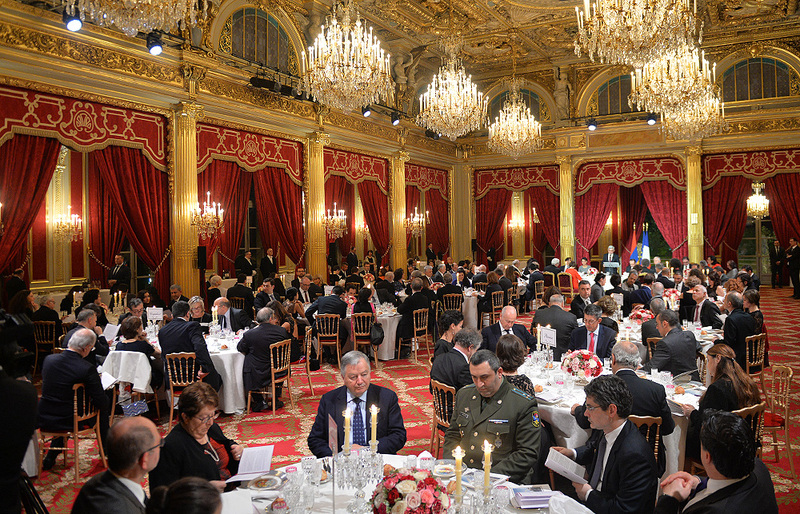 In this context, underlined was the cooperation with the International Association of Francophone Mayors. As a result, conditions have been created in a number of Yerevan schools for the enhanced study of French language, renovated were musical and art school, and libraries. 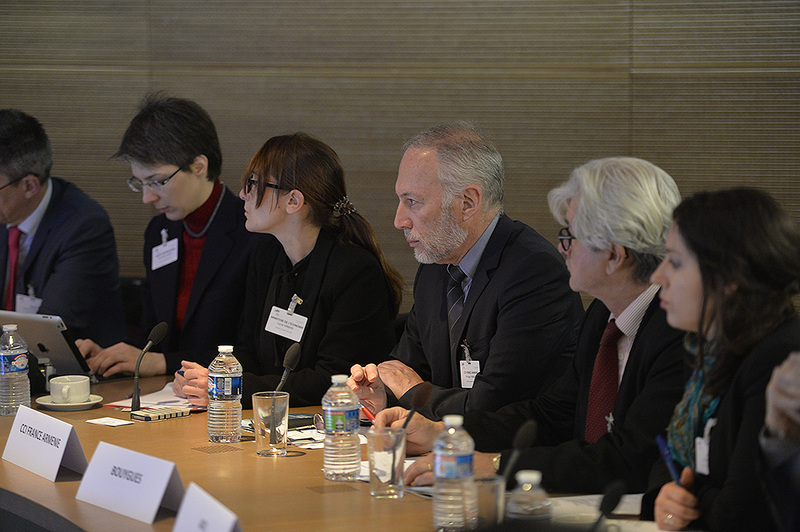 The parties discussed also the current problems existing in the family of Francophonie. The interlocutors exchanged views on Armenia’s participation at the peace-keeping missions carried out in the countries – members and observer states of the International Organization of Francophonie. 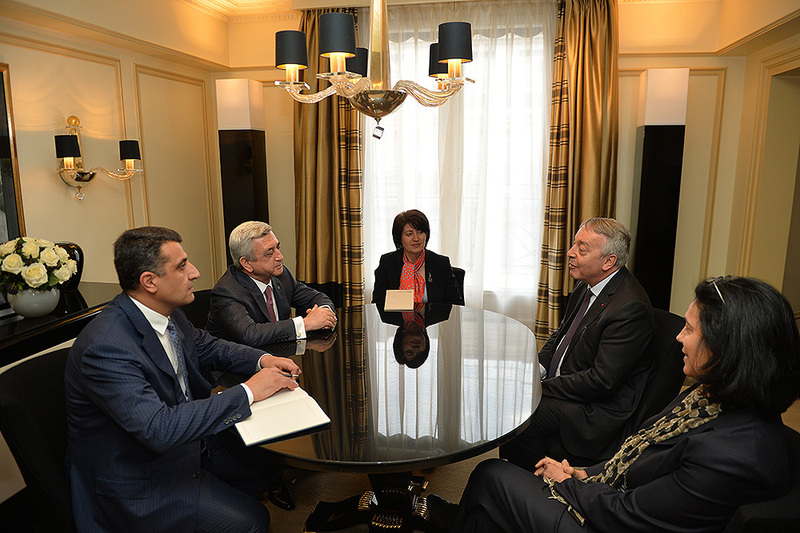 President Sargsyan expressed gratitude for the Organization’s and Madam Jean’s personal balanced position on the Nagorno Karabakh conflict. According to Serzh Sargsyan, support to the efforts of the Co-Chairs of the OSCE Minsk Group, which is the only specialized format dealing with the issue, is also support to the establishment of peace and stability in the region. 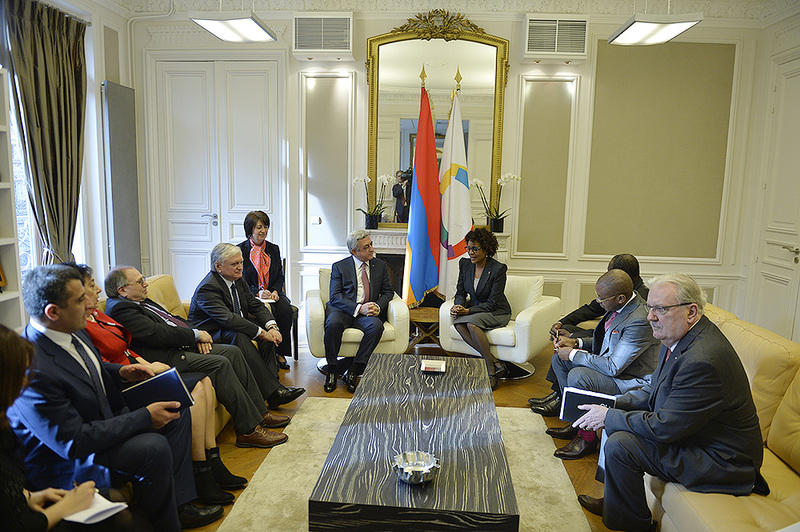 The parties spoke also in detail about the works related to the Summit of the International Organization of Francophonie to be held in Armenia in 2018. The decision to hold such a prestigious Summit in our country, according to the President, testifies not only to Armenia’s commitment to the values of the Organization, but also to a great trust towards our country. 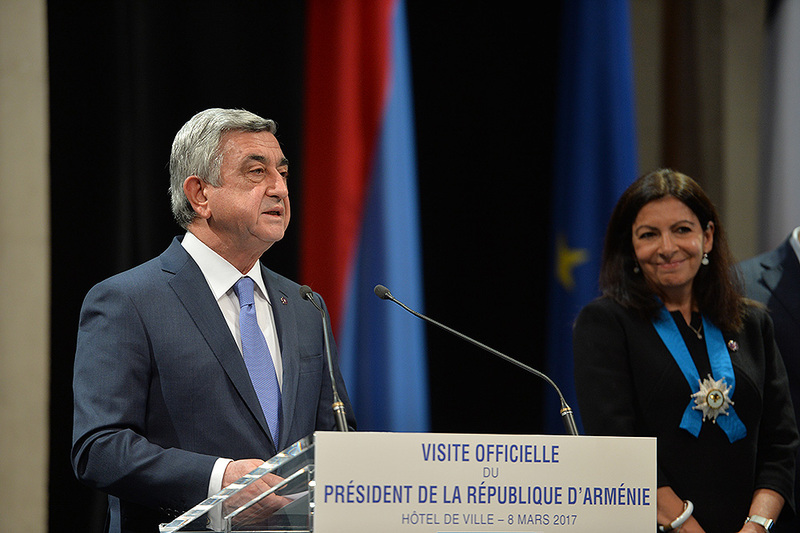 Serzh Sargsyan underscored that it is a very responsible task, and Armenia pledges to make that important event a success. The President of Armenia informed the Secretary General on the preparatory works for the Summit going on now and noted that there was established an interagency commission, headed by the Prime Minister of Armenia, while the RA Minister of Foreign Affair, together with the Organization, is developing the program of events. The President proposed to focus on sustainable development, innovation, information technologies, and youth related issues. 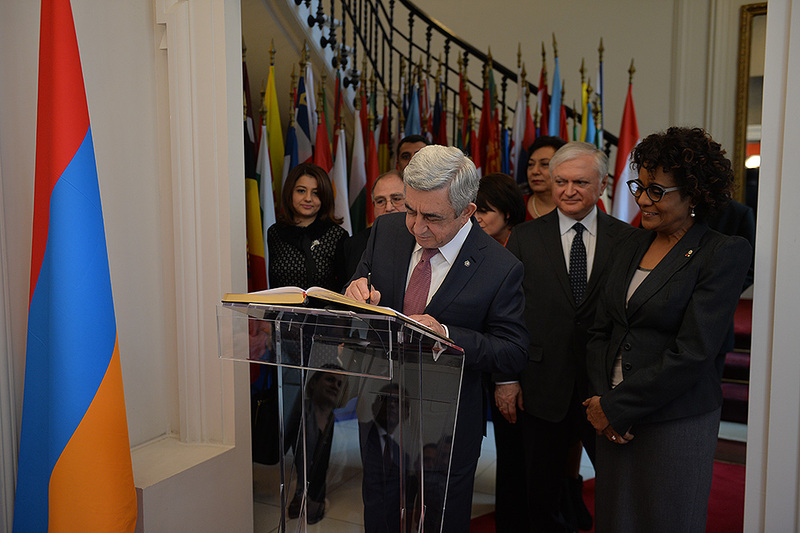 At the headquarters of the International Organization of Francophonie, President Sargsyan made an inscription at the Book of Honorary Guests. “I am glad to visit for the first time the Headquarters of the International Organization of Francophonie – a great family of diversity, solidarity, dialogue, and cooperation. 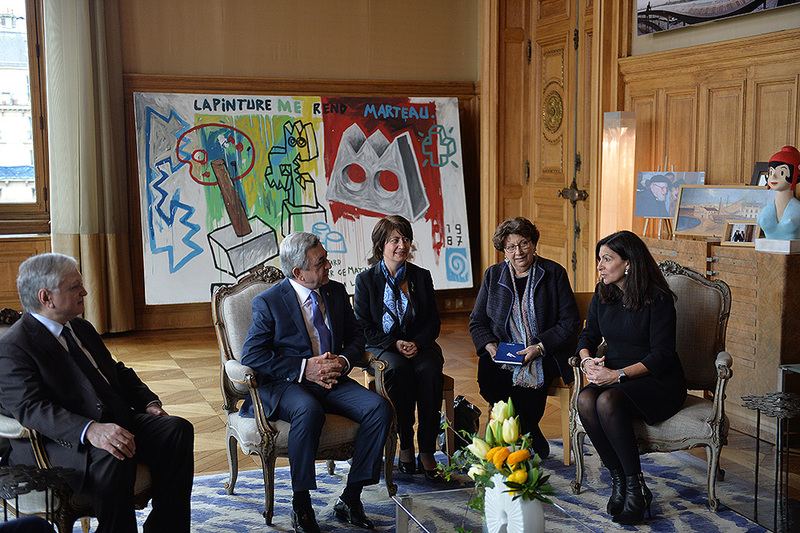 Armenia, which during ten years of her involvement has deserved the right to be called an active member-state, is committed to promoting the values of Francophonie which are universal. This is manifested in the confidence the member-states have demonstrated towards Armenia, deciding to hold the 17th Summit of the Organization in Armenia. We will certainly fulfill the mission entrusted to us with a great honor,” wrote the President. 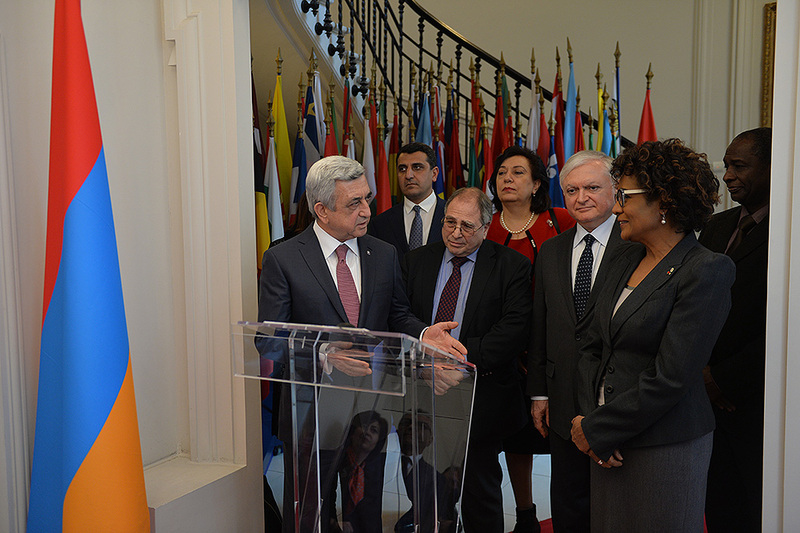 At the conclusion of the meeting, President of Armenia and Secretary General of the International Organization of Francophonie made statements for the press on the results of the meeting. 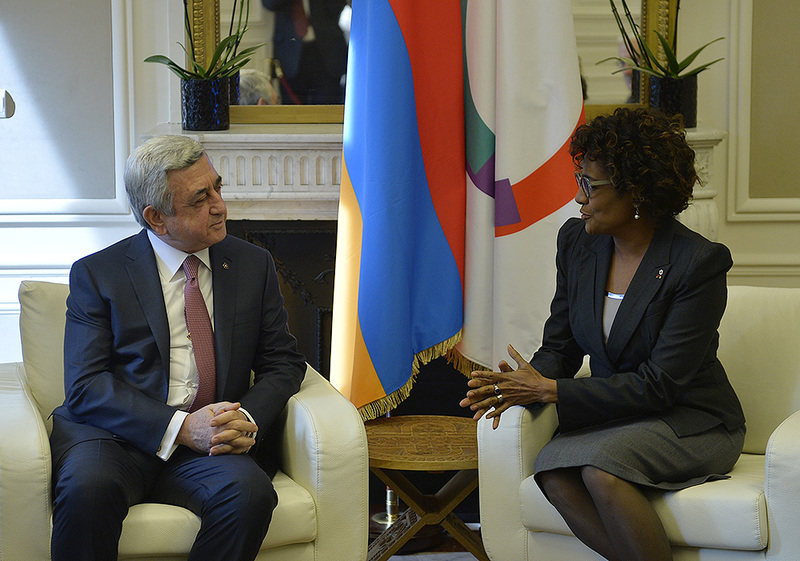 The President of Armenia thanked for the meeting and warm reception and invited Madam Jean to visit Armenia also before the Summit. Secretary General Michaelle Jean underscored that Francophonie is rich with its diversity and the heritage possessed by its members as well as with the message and vision for future which it is able to pass on to other members of Francophonie. She assured that the Organization is looking forward to the Summit in Armenia with a great anticipation and said that the Summit will be a good opportunity for the Armenian people to manifest their great will and resolve to survive and to live. 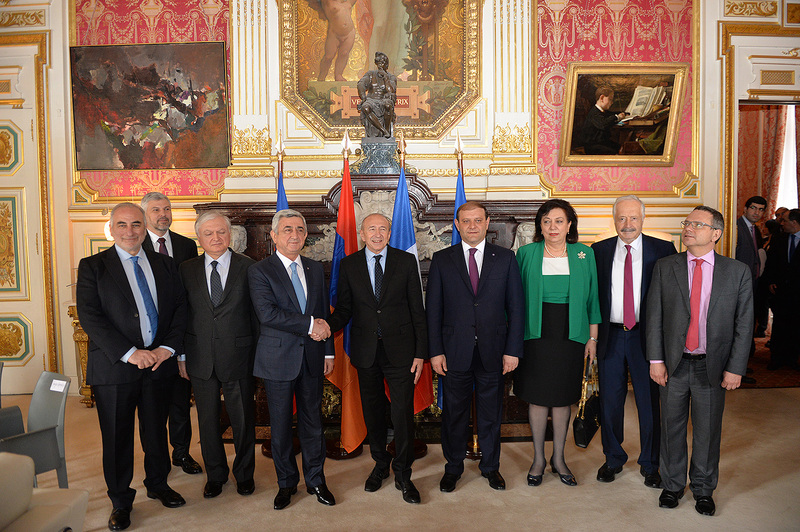 President Serzh Sargsyan concluded the first day of his official visit to France with the meeting with the representatives of the Armenian communities of Europe. 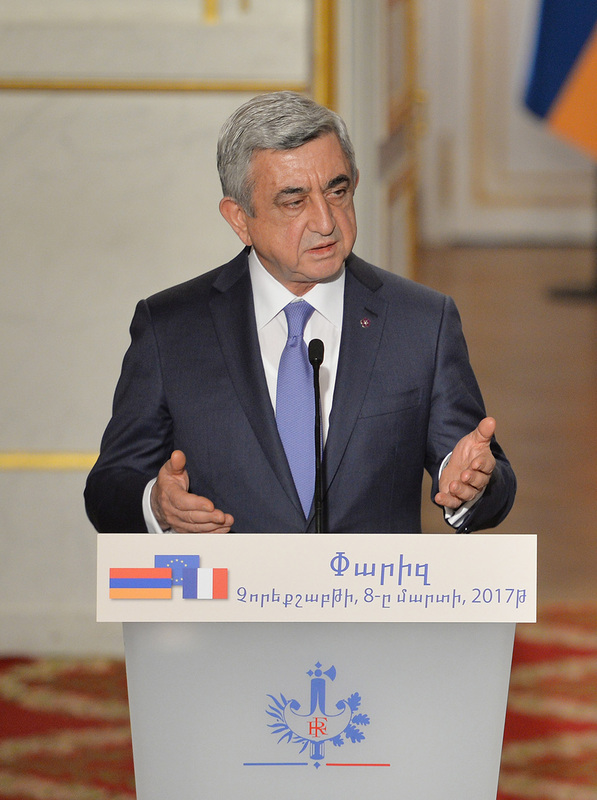 The President of Armenia made a welcoming statement in which he referred to the accomplishments made by the Republic of Armenia in 25 years after regaining independence, existing problems and challenges, a daily work aimed at Armenia’s and Artsakh’s security, the NK peace process, ongoing programs to assist Syrian Armenians, main directions of the current phase of the Armenia-Spyurk cooperation and urged to unite even more and channel efforts towards the implementation of the Pan-Armenian issues, including the creation of a freer, more fair, more secure and more advanced Armenia. “Today, the Armenia-Spyurk relations need to concentrate on the ideas and principles which unite the nation, endowing the cooperation with a new quality and substance. 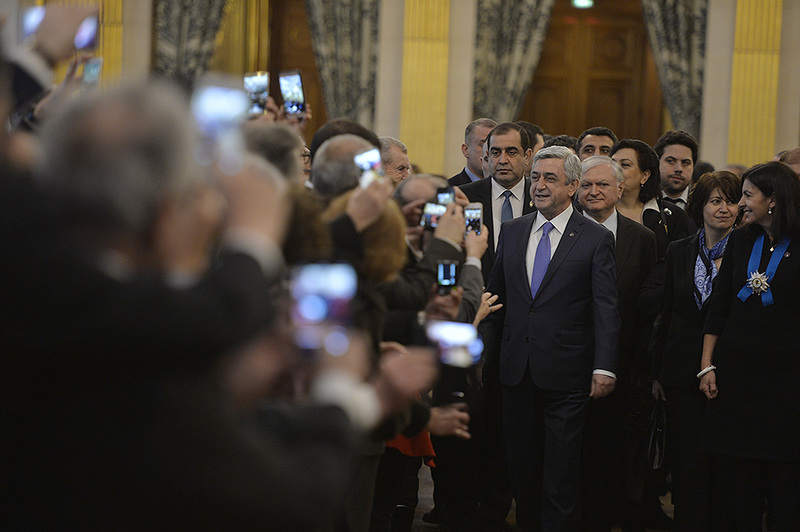 Our goal is clear: to build an efficient and prosperous Armenia. Only efficient and prosperous Armenia will be able to defend herself and to safeguard her brothers and sisters in Spyurk. We do not underestimate the huge works carried out until today and various programs called to life. Moreover, we address our sincere words of gratitude to our brothers and sisters who made them possible. We invite our compatriots to become immediate participants to the development of the policies for the advancement in different areas and works aimed at calling them to life. We propose to discuss new mechanisms of cooperation. Not a single serious initiative will remain unattended. Transparent work, elimination of artificial hurdles is a matter of principle; responsibility should be shared by all parties involved. We must try to utilize efficiently the expert potential of the Spyurk, including the capabilities of the young and professional circles, their skills, and innovative talent. Regardless of where they live, Armenians have always stood out for their diligence and talent. Our nation gave world-famous scientists, artists, physicians, inventors, and entrepreneurs. This is our greatest achievement – our immense human capital. You, our compatriots in Spyurk, made the Armenians recognizable all over the world. The time has come to make Armenia recognizable all over the world. It is necessary to work towards making Armenia a more reputable and respected country and state. Others may have oil, gas, and exit to the sea; you, dear compatriots, are our “sea” our “exit to the external world”. If used properly, this huge potential will allow to achieve desirable results. Empower our common Fatherland. The Spyurk is dependable and the most efficient bridge for Armenia’s integration into the world economy. Historic injustice made the world home to many Armenians but Armenia has been and remains the hearth and native sanctuary for the Armenians of Spyurk. The Syrian tragedy and the situation with the Syrian Armenians in particular, is our common pain. But today, unlike the catastrophe which befell one hundred years ago, we have solace in what is called the Armenian state. Let me assure you that the Fatherland is doing its best in assisting the Armenians of Syria. For us, they are not refugees but compatriots who have come back home. We make every effort so that they settle in Armenia and adjust to the existing conditions. Many of them have already given a new tint to our society and even to the business environment. Yes, it is difficult, and many of them are still waiting because the political uncertainty is still great. From now on, we all need to become a fist and direct our efforts towards creating a new Armenia. It must be a freer, more fair, more secure and more advanced country. Armenian entrepreneurs have made a considerable contribution and have a substantial weight in many branches of the global economy. At the same time, cooperation of the businessmen from Spyurk in Armenia and abroad remains insufficient. One of the key directions of the current phase of the Armenia-Spyurk cooperation is the expansion of Diaspora businessmen’s presence in the Republic of Armenia. Utilizing their connections, the Diaspora entrepreneurs can promote the implementation of the foreign investment projects in Armenia. Equally important is the use of modern skills in the creation of business culture. It can be done primarily by the Armenian businessmen working in the developed European environment; they can bring with them the most advanced culture of doing business. From now on investments from Spyurk should be targeted and oriented, aimed at Armenia’s industrial development and boosting other areas of the Armenian economy. Development in Armenia of the infrastructure for the knowledge-based economy is one of the critical prerequisites for the advanced economy. With this regard, the Spyurk should be the most important source of skills and knowledge which will allow to make Armenia the best place for investments and doing business in the region. We, dear friends, have always viewed civil society as a partner and not as an adversary. We attach importance to the process of shaping the all-Armenian civil society. With the existing telecommunication technologies it has become the inescapable reality. If we want to have a freer, more fair and more democratic Armenia, than instead of demanding from each other, we need to talk to each other, and not only talk but cooperate. Reforms going on in Armenia should be irreversible. Towards that end, we need to totally reconstruct our area of education. Important in this endeavor is also the engagement of the intellectual capabilities of the Spyurk, introduction of new knowledge and skills in the area of education ranging from consulting to teaching. Through the joint efforts, Armenia and Diaspora can gradually implement our structural goals, refraining at the same time from disappointment and disenchantment. It is necessary to find new solutions, to unite, to become one fist, complementing and helping each other to move forward in these challenging times. I am confident you are well-aware that soon Armenia will enter a new era, switching to the parliamentary system of state governance, which implies a new political culture, large-scale structural reforms. The decision to implement constitutional changes was necessitated by the desire and command to see our country tomorrow as a more democratic, security and prosperous country. It is amazing how the Armenia nation was able to unite in dramatic situations. Why can’t we do it in peaceful times, and what impedes us to move our country forward, to make it prosperous and powerful? I don’t see any insurmountable difficulties to achieve that. I am confident that today we have all prerequisites and preconditions to give a new impetus to our cooperation. This is our vision, this is our understanding, this is the unbreakable guarantee of our future success. In conclusion, I once again thank you all for being here. I am confident that we are able to defeat all current challenges, our own skepticism and through the joint efforts to fight for our bright future. Supporting each other, we can take up the task of state building and make our bright youth the immediate participant of that undertaking. We must be more courageous and goal-oriented, full of mutual respect. We have to care for our reconquered Fatherland. We have to become more powerful, to empower our cherished paradise, our Fatherland Armenia. Thank you,” said the President of Armenia. 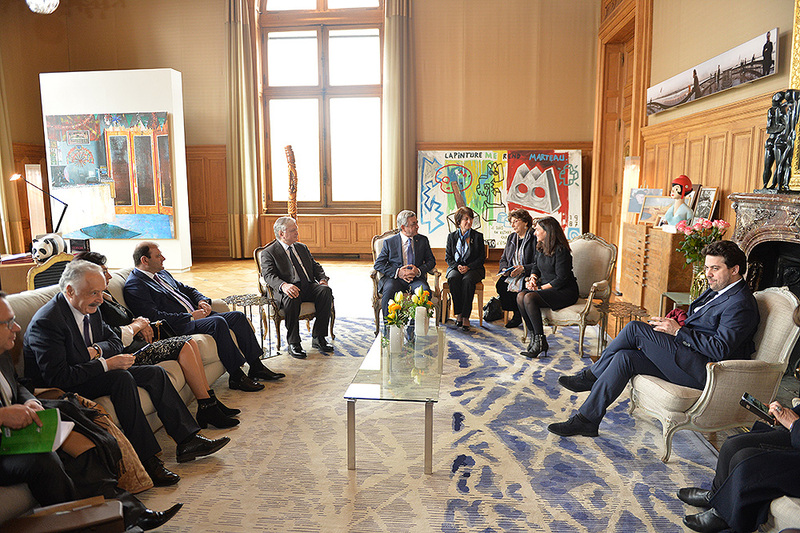 In the framework of his official visit to France, President Sargsyan in the evening met also with the Executive Director of a leading French company Veolia. 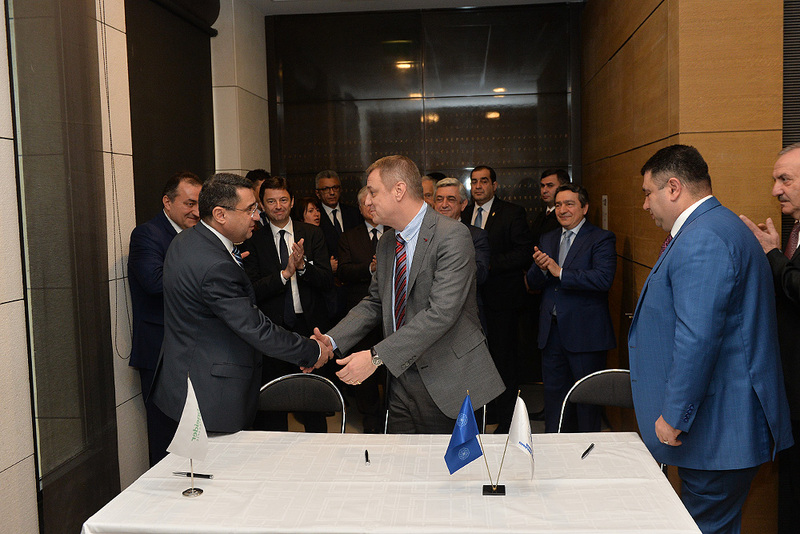 Veolia Jur - the Company headed by Antoine Frérot, in 2016 won the open international tender and assumed the works of water supply and sewage in 45 municipal communities of Armenia, including Yerevan, as well as in over 360 rural communities. The parties spoke about the works carried out by the Company in the water industry in the framework of the obligations assumed by the contract, as well as about the offered services and development programs. 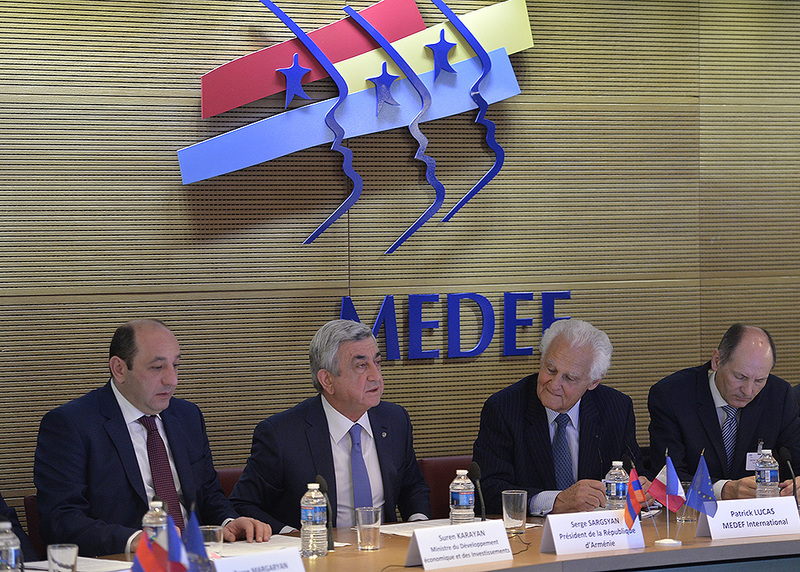 In the framework of his official visit to France, President Serzh Sargsyan met with the members of the largest employer federation in France Mouvement des entreprises de France (MEDEF). 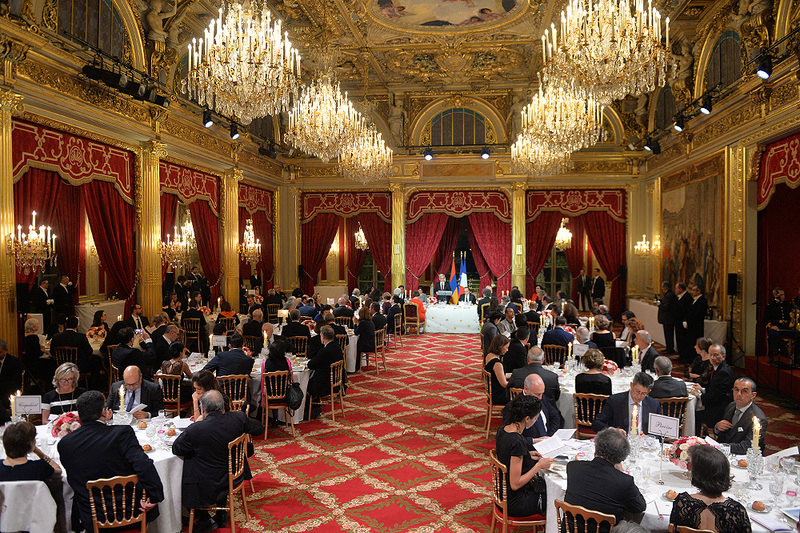 The Federation is a link between the French entrepreneurs, leaders of different countries and private sectors. 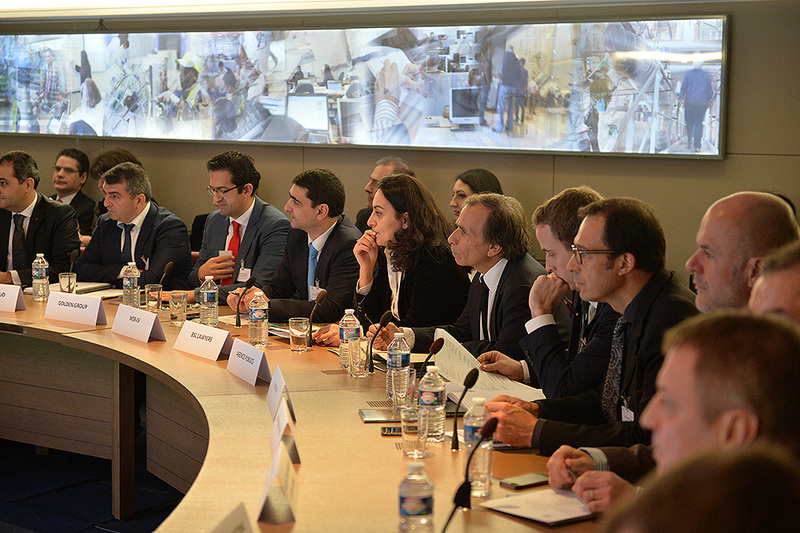 This structure, which is responsible for international cooperation, promotes and supports activities of French enterprises and through the meetings such as this one creates opportunities for the companies to familiarize with and create conditions for the implementation of their programs. 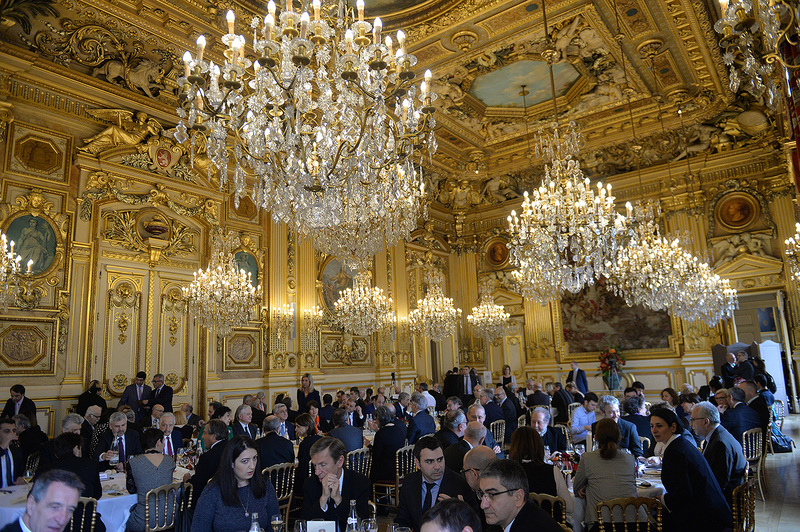 To the French companies working abroad it gives a chance to raise with the guests issues of interest and problems with the anticipation of finding solutions. 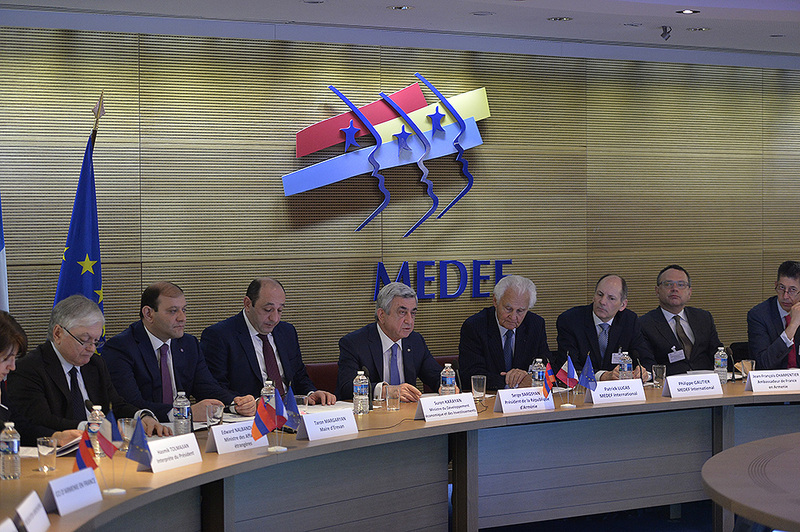 At the MEDEF President Serzh Sargsyan made a statement for the heads of French enterprises. 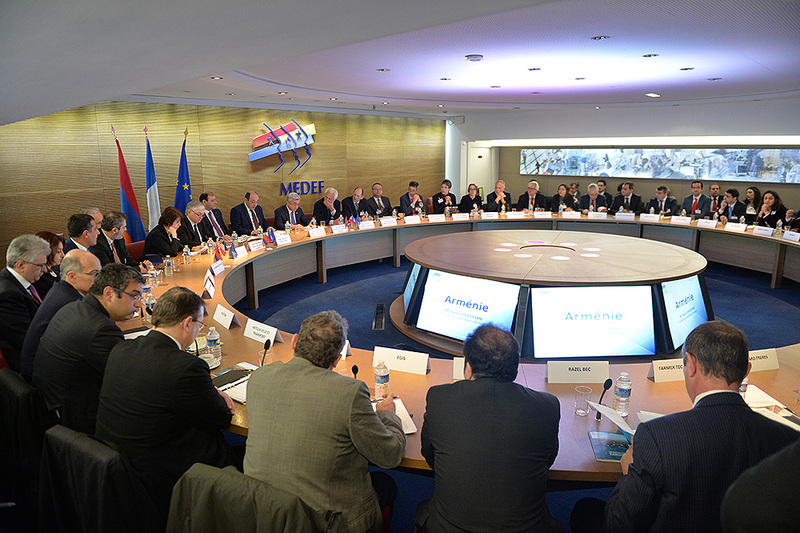 At the conclusion of the meeting, at the MEDEF office there took place the signing ceremony of the agreement on cooperation between the Tashir Group, Armenian Electrical Network Ltd. and Schneider Electric Company. I cordially salute the participants and organizers of this traditional event, aimed at the expansion of cooperation between our two countries. 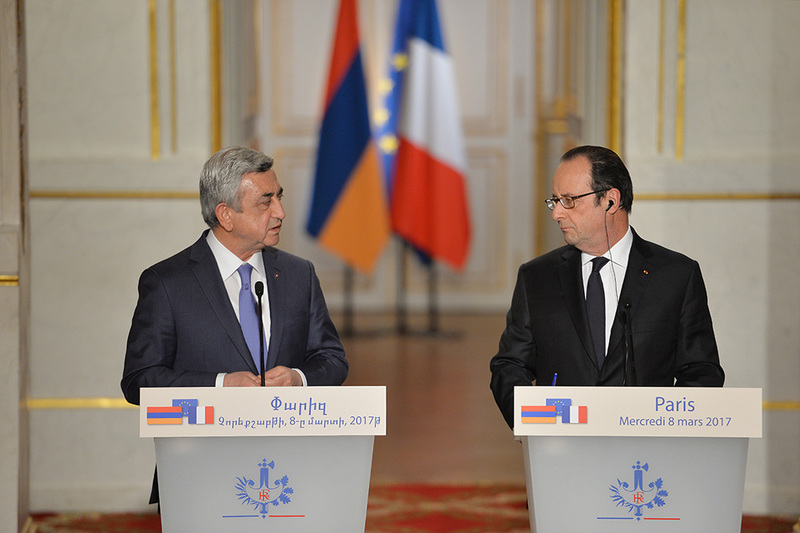 The historically formed Armenian-French friendly relations form the base not only for our political but also economic relations. This inspires us with confidence that the parties are able to provide for the implementation of pretty large and ambitious economic programs. In 25 years of her independence, Armenia has registered impressive results. Today we have a sustainably developing Armenia which withstands the often unpredictable changes of the global economy efficiently. Recent developments in the region, which were accompanied by the decline of economic indices and steep depreciation of national currencies, proved the vitality of Armenia’s tax, credit, and financial policies. These policies are constantly praised by our international partners and thanks to these policies our country is able to maintain a stable and predictable macro-environment. Success of the economic policy implemented in the country is proved by the reputable international indicators, and on this Armenia is registering a steady advancement each year. Thus, according to the World Bank’s Doing Business report, Armenia occupies the 38th place in the world in terms of simple terms for starting business, while according to the Heritage Foundation’s economic freedom indicator we are at 33th position which means this year alone we moved up by 21 points. Understandably, there are cases when unfavorable positions prompted by different indicators do not play a decisive role in making investments. For instance, it looks like in case of the neighboring Azerbaijan, which is rich with energy resources, the anticipation of getting super profits, is pushing into the background the indicators which reflect the true situation with the country’s economy. Macroeconomic stability alone is certainly not enough for sustainable economic growth. From the viewpoint of increasing our country’s competitiveness, the most important thing for us is the constant improvement of the business and investment climate in Armenia, development of human capital, and modernization of the relevant institutions. We were guided by the same philosophy when undertook constitutional changes in Armenia, which were adopted in December 2015. With the new Constitution we made pivotal changes to our state governance system, switching from the semi-presidential to a fully parliamentary system of governance. It is our deep conviction that these changes will also have their positive impact on the vivacity of the economic life in the country. The new Constitution underscores free economic competition, improvement of business environment, and has provision aimed at boosting up the entrepreneurship. Being a land-locked country with scarce energy resources, under blockade from two neighboring states, we have never bent to difficulties. On the contrary, these factors became a locomotive to move forward with the creative ideas and ingenuity of our people. Thanks to a highly skilled labor force and human capital, today Armenia has become an innovative country which offers high technology solutions. Efforts aimed at the development of information and telecommunication technologies today yield results. In recent years, Armenia has been registering a 20-25% growth in this area, while its share in the GDP is close to 4%. Even though the trade and economic indicators in our country are not gratifying at all, considering the entire of the Armenian-French agenda, potential existing in our bilateral economic relations should not be used to promote the commercial ties only. 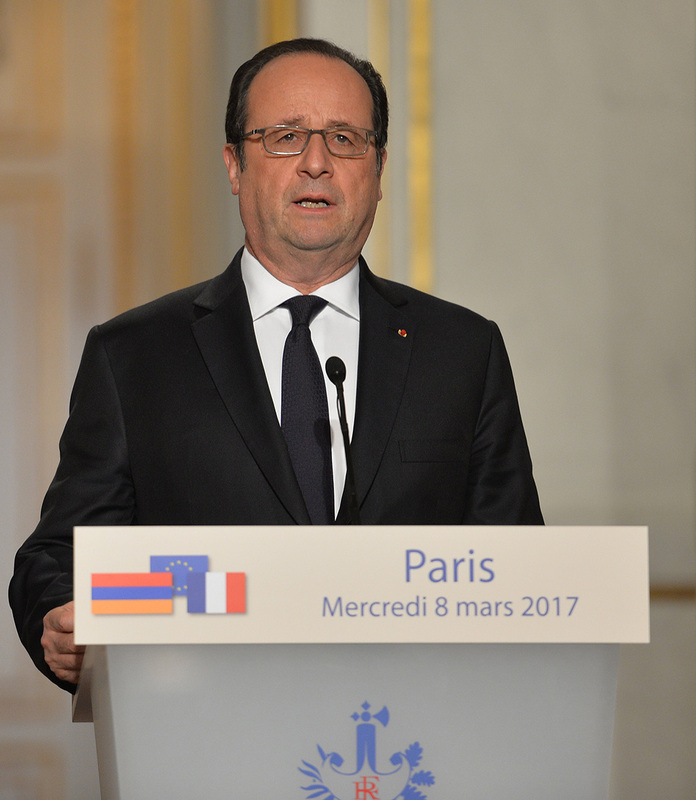 We want the French capital to increase its share in Armenia and are ready to provide favorable investment conditions for French businesses. With this regard, I would like to highlight the consistent works carried out towards the encouragement of investments and their increased protection. 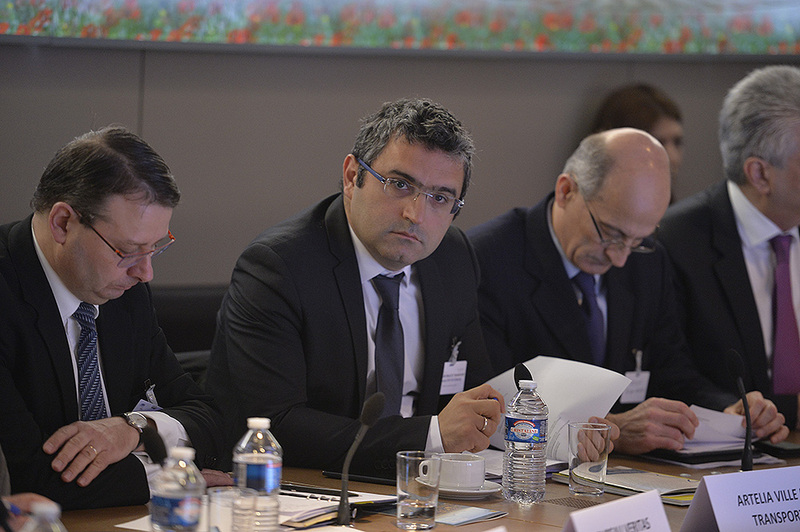 For instance, in the framework of the implemented reforms it is envisaged to secure by law national and most favorable regimes, to define more precisely the guarantees provided to foreign investors, to allow the entrepreneurs to use the existing and future privileges in Armenia and take advantage of the improved mechanisms for the resolution of investment related disputes. Conditions are being created for the expansion of the state-private sector cooperation. To help the businesses and improve the business climate, consistent steps are being taken to reduce paperwork and simplify procedures, including in the tax and customs areas. Serious steps are made to develop the export policy. Strategy developed by us stresses the importance of increasing exports because it could become the driving force behind the future sustainable growth. In recent years, considerable steps have been made also aimed at the increase of Armenia’s limited internal market. It’s been two years that Armenia is a member to the Eurasian Economic Union. The Eurasian integration project has widened the economic borders of its members up to almost 1/7 of the world. It has created a large, almost 170 million strong market with no tax borders. Days ago, in Brussels together with the President of the European Council Mr. Tusk we announced the conclusion of the negotiations on the new framework agreement with the European Union. The presence in the legal document of the economic component opens new opportunities for the economic activities not only for the Armenian but also European entrepreneurs. Moreover, if used properly and fully, opportunities provided by the agreement allow the economic potentials of the EU and EAEU to be used to mutual benefit. Our traditionally good-neighborly relations with Iran and economic ties create a good opportunity for the European entrepreneurs to enter via Armenia the 80 million strong Iranian market. The shortest route linking together the seaports of the Persian Gulf and Black Sea also runs through Armenia. The representative audience present at the conference inspires with confidence that it will be instrumental in opening new opportunities for our countries and for the creation of the best formula to utilize the existing formats of cooperation. 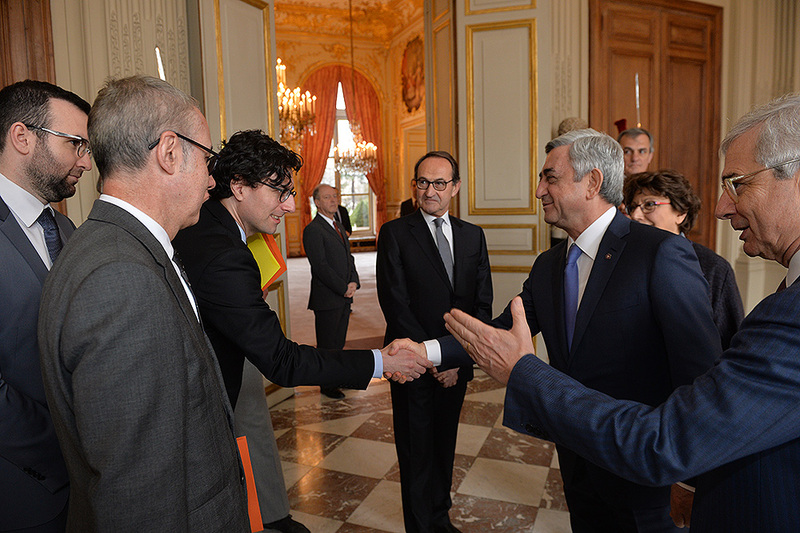 I invite French companies to make investments in Armenia. I assure you that we are ready to show an individual approach to each investment project, certainly taking into consideration the needs of the investor. Our Minister of Economic Development and Investments will make a more detailed presentation with regard to the possible areas and directions of cooperation. He will also present concrete programs. I wish you productive work. 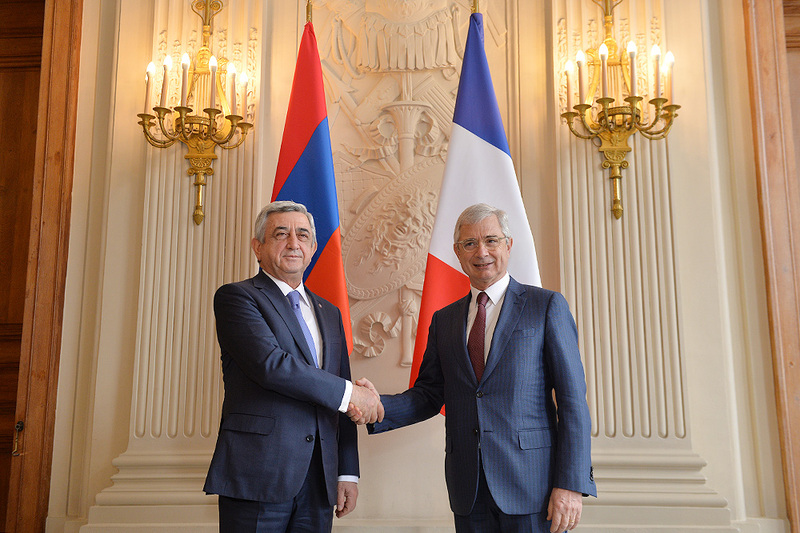 President Serzh Sargsyan met with the President of the National Assembly of France Claude Bartolone. 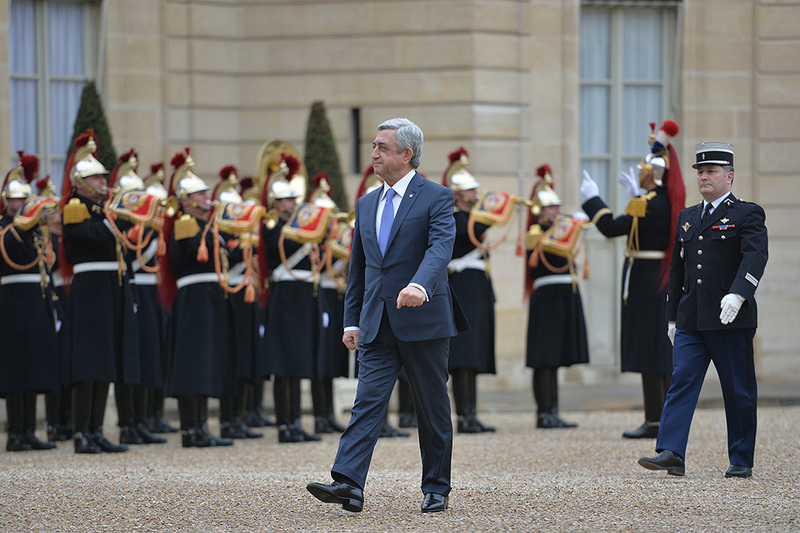 Noting that his official visit to the friendly France is taking place in the year when Armenia and France celebrate the 25th anniversary of the establishment of diplomatic relations, President Sargsyan viewed it as a good opportunity and occasion to recap with the highest leadership of France numerous achievements registered in over two decades and discuss forthcoming steps. 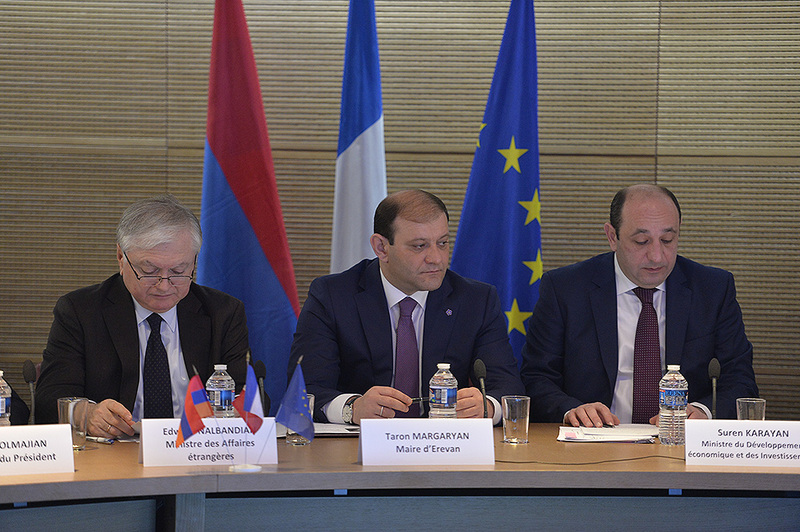 The interlocutors stressed the importance of parliamentary diplomacy in the strengthening of the interstate relations, in the expansion of the cooperation agenda, deepening friendship of the Armenian and French peoples and spoke with satisfaction about the activities of France-Armenia friendship group. 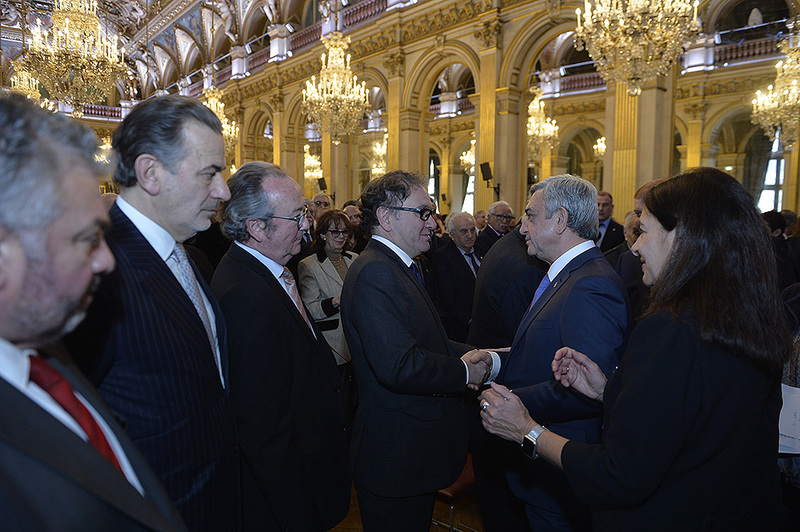 The President of Armenia and President of the National Assembly of France underlined the close cooperation of the parliamentarians of the two countries at the parliamentary assemblies of international structures. 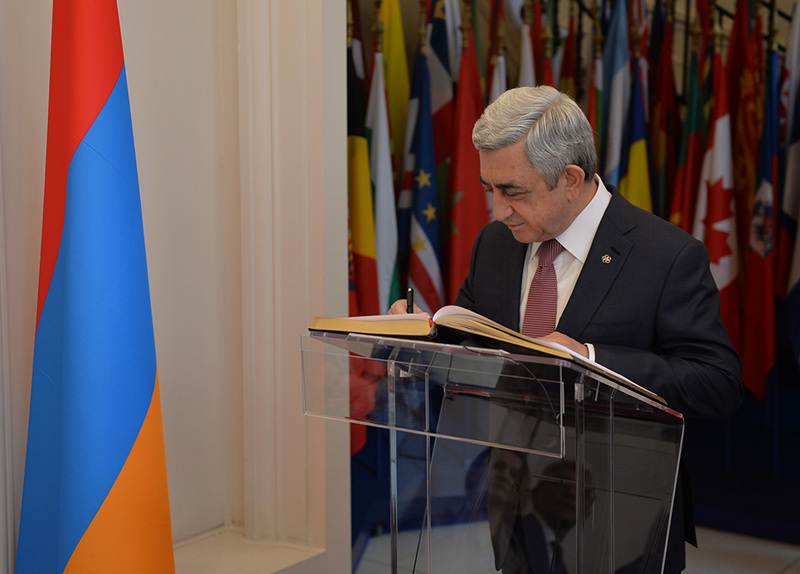 Serzh Sargsyan hailed the position of the National Assembly and personally of President Bartolone in the international recognition, condemnation and criminalization of the Armenian Genocide. President Sargsyan highly praised the efforts of the OSCE Minsk Group including the efforts of France as a Co-Chair of the MG aimed at the peaceful resolution of the issue and upholding security and stability in the South Caucasus region. 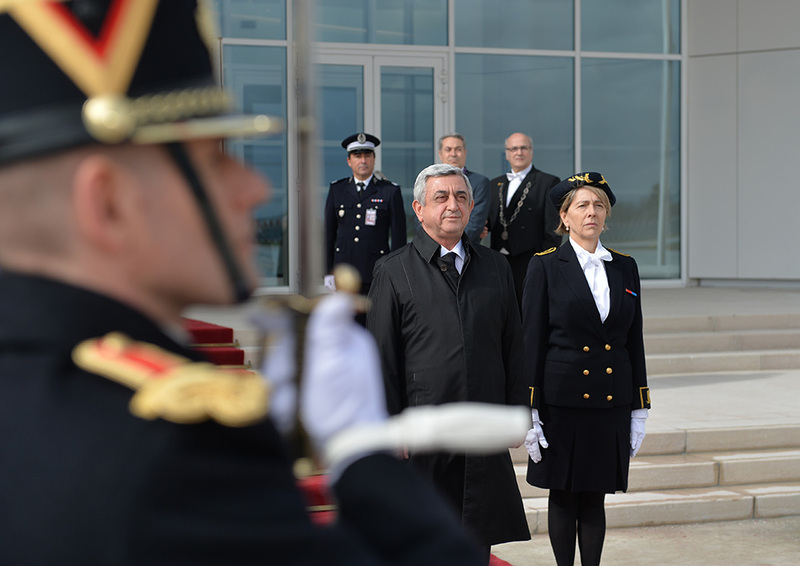 He also underscored that visits of the members of the French Parliament to Artsakh allow the international community to form a full picture and understand the essence of the fair struggle of the people of Artsakh for freedom, human rights, and self-determination which is an inalienable right of any nation. 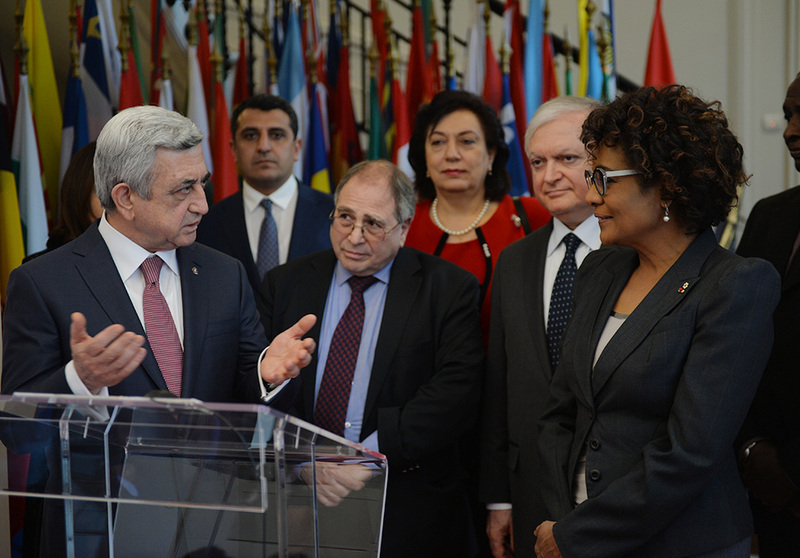 In this context stressed was the importance of the Friendship Circle with Artsakh which, according to President Sargsyan, brings its indispensable contribution to a just resolution of the Artsakh issue. 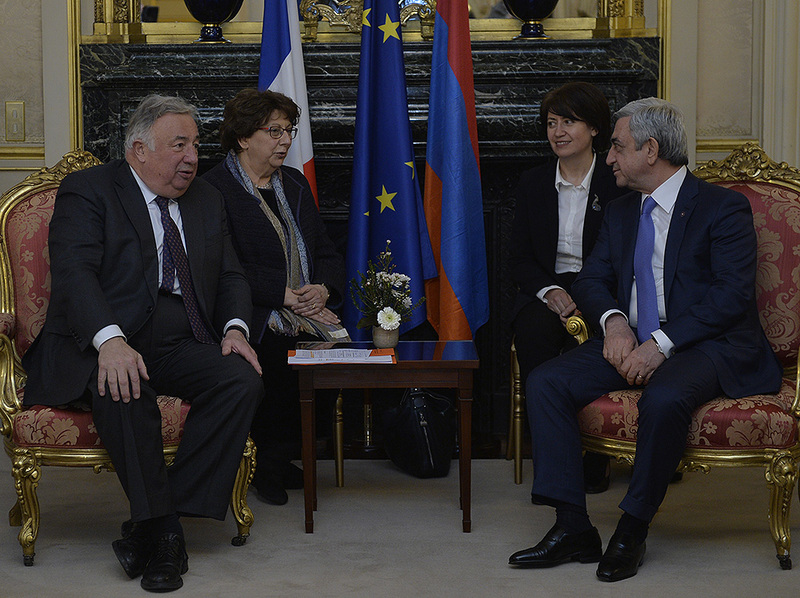 In addition to the bilateral Armenian-French relations, the President of Armenia and President of the National Assembly of France discussed also Armenia’s relations with the European Union and their prospects. 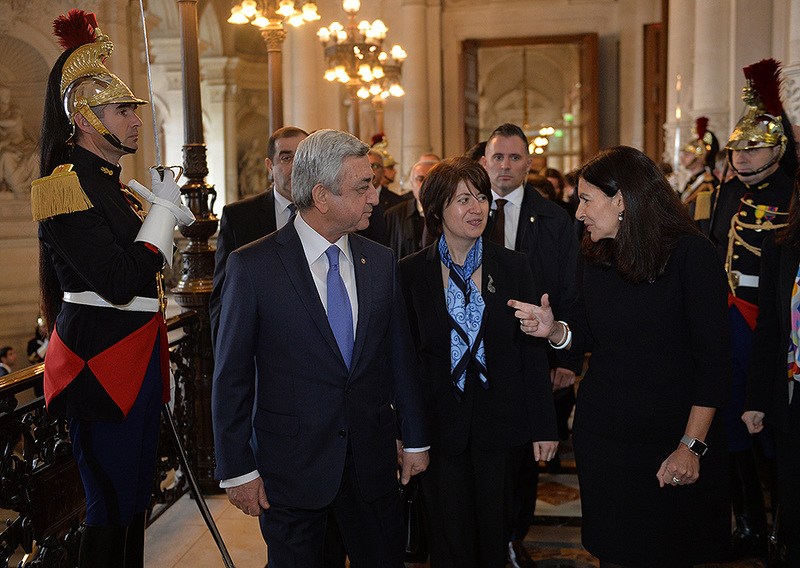 President Serzh Sargsyan met with the Mayor of Paris Anne Hidalgo. 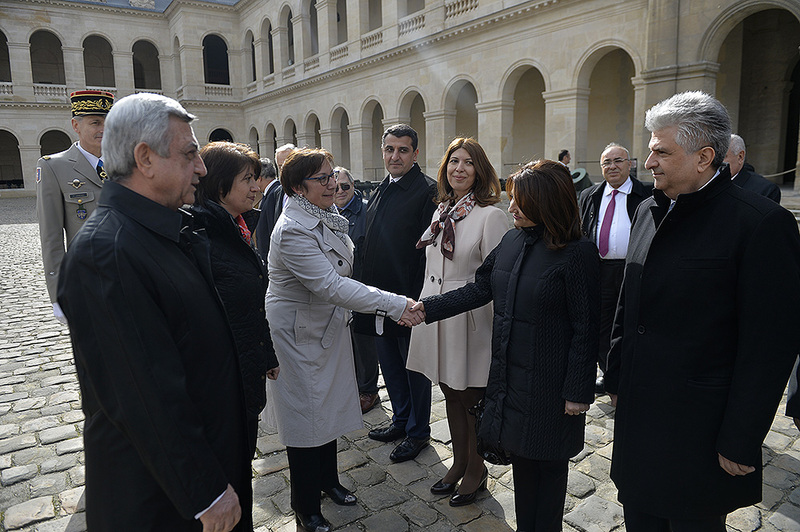 At the beginning of the meeting, the President of Armenia congratulated and conveyed best wishes to Mrs. Hidalgo on the Women’s Day and noted that in the morning he sent a congratulatory message to all women of Armenia, and it is very pleasing that the meeting gives a chance to congratulate also Mrs. Hidalgo on the occasion of this beautiful holiday. 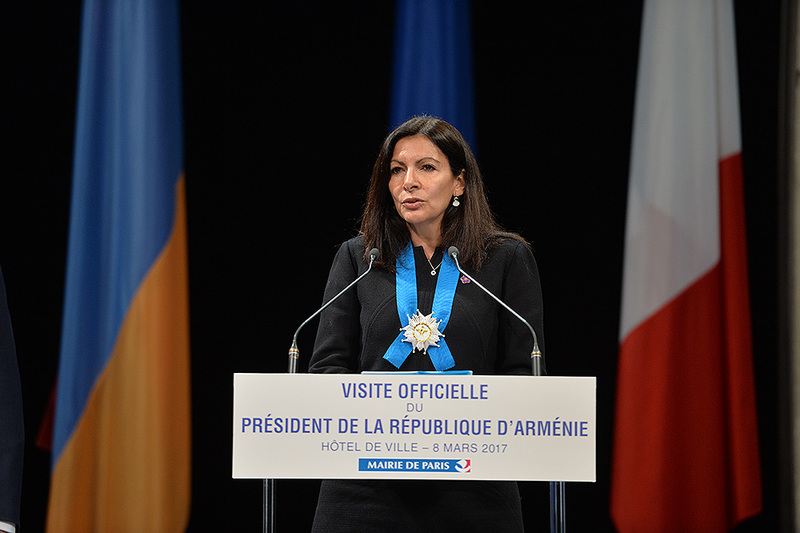 Mayor Anne Hidalgo noted that she recalled warmly and gladly her visits to Yerevan and believes that Yerevan is the capital of the art of hospitality. The parties underlined with satisfaction the developing and strengthening by year cooperation between partner cities Yerevan and Paris. 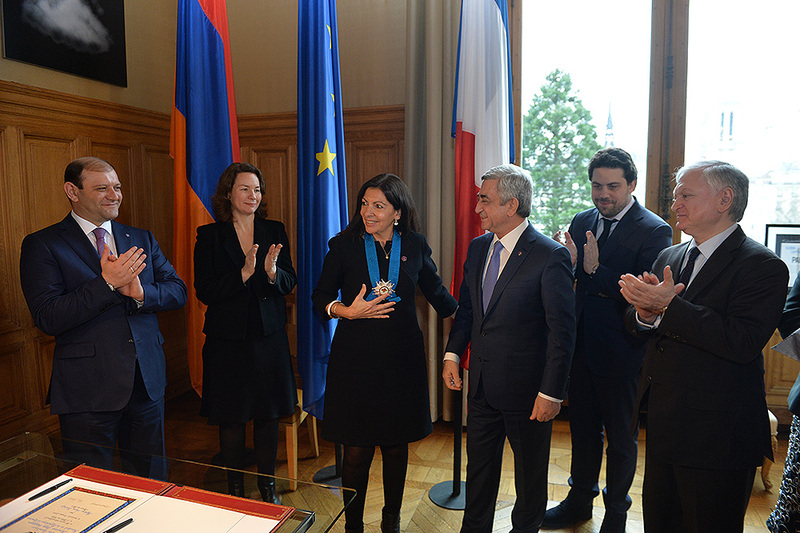 At the conclusion of the meeting, President Serzh Sargsyan awarded the Mayor of Paris with the Order of Honor for her considerable contribution to the strengthening and development of the Armenian-French friendship. 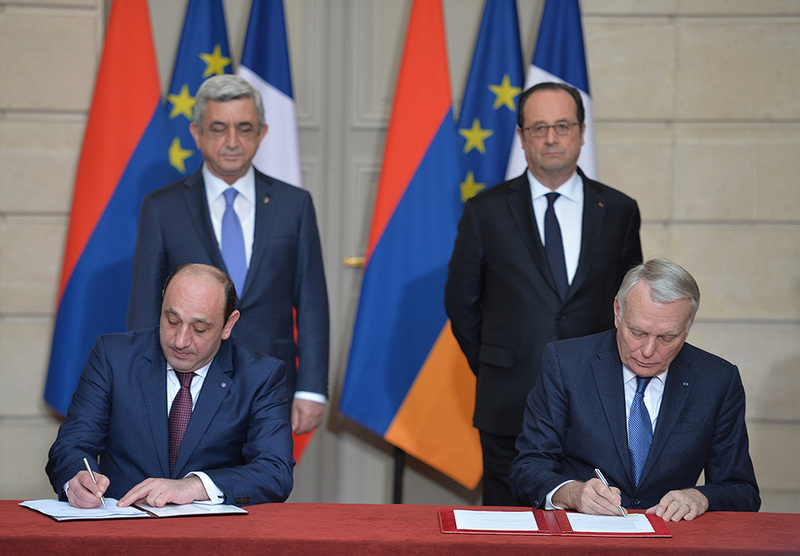 The President of Armenia and Mayor of Paris signed the poster dedicated to the visit of the Armenian President to France. 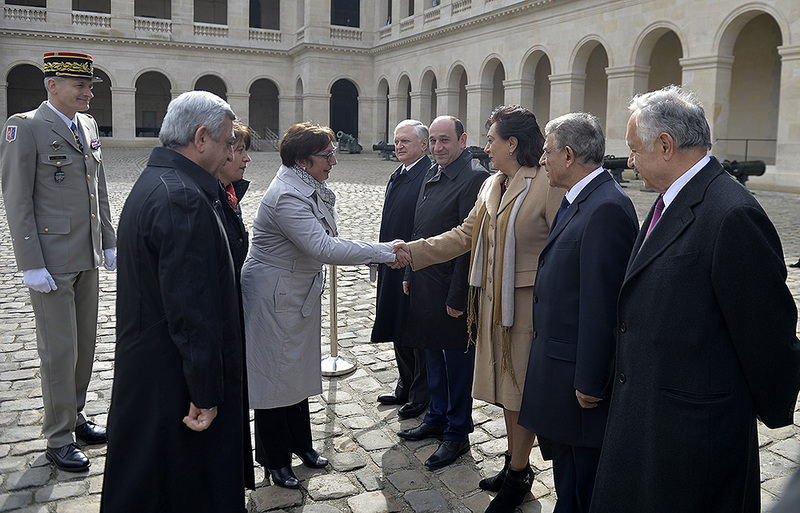 Later, at the Paris City Hall in honor of the President of Armenia there took place an official reception. 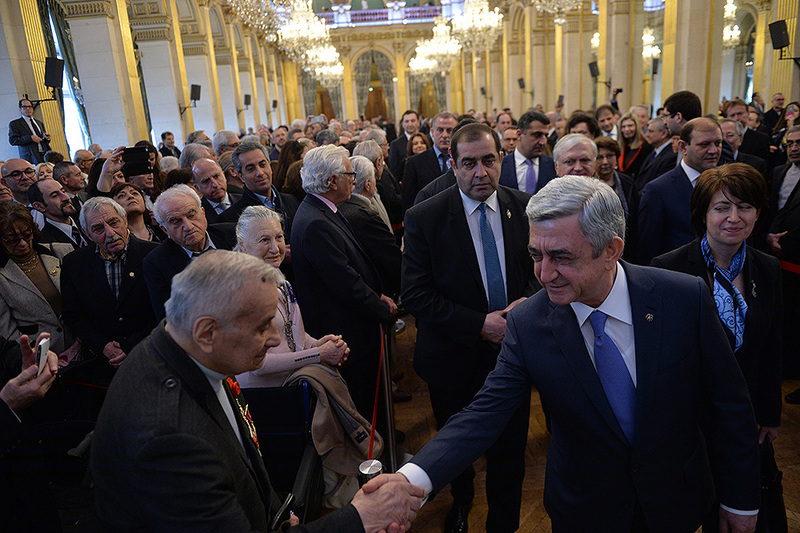 At the event, President Sargsyan and Mayor Hidalgo made statements. I am glad to be in Paris once again, the city which through the history was “tossed by the waves but does not sink” and continued to flourish and develop remaining forever a unique civilization hub. As justly observed, just a stroll in Paris gives one lessons of history, beauty, and the meaning of life. It is pleasing that through the centuries the Armenian people have had the opportunity to share these lessons, enriching selves and enriching others. 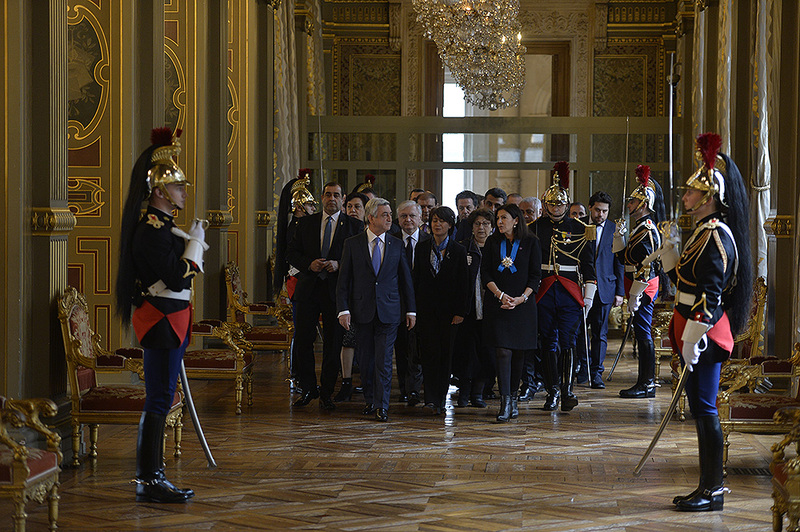 I thank the authorities of Paris, in person of Madam Hidalgo, for this opportunity. 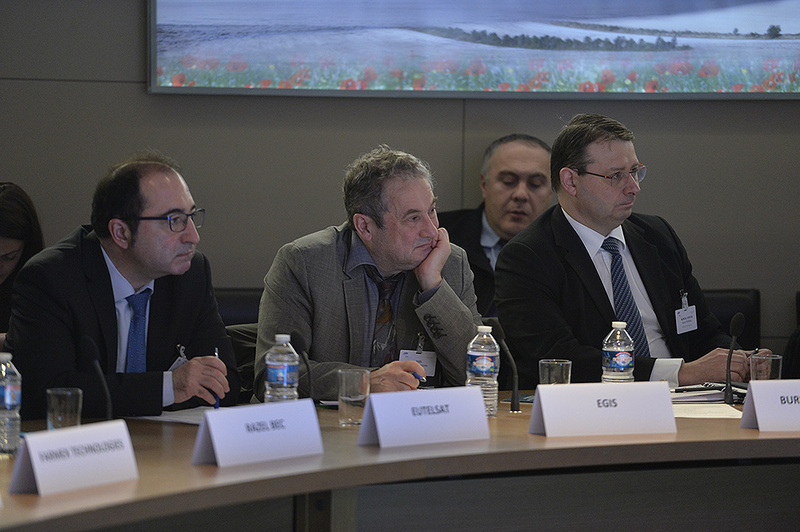 It is also thanks to you that decentralized cooperation has found its sizable place in the agenda of the Armenian-French cooperation and with Paris in particular, of course. I highly value the fact that you stand by us at the most important moments: I mean your visits to Yerevan to participate to the events dedicated to the 100th anniversary of the Armenian Genocide and in the framework of the celebrations of Yerevan’s 2798th anniversary. And, Madam Mayor, we will certainly be happy if you visit Yerevan next year when we are to celebrate Yerevan’s - the capital of all Armenians’ - 2800th anniversary. In the streets of Paris one cannot fail to see indexed trees, thousands of monuments and museums, tourists, which come back again and again, and finally the cordial and hospitable atmosphere of this city. There is no doubt that your boundless dedication and care have also played their role in all this. 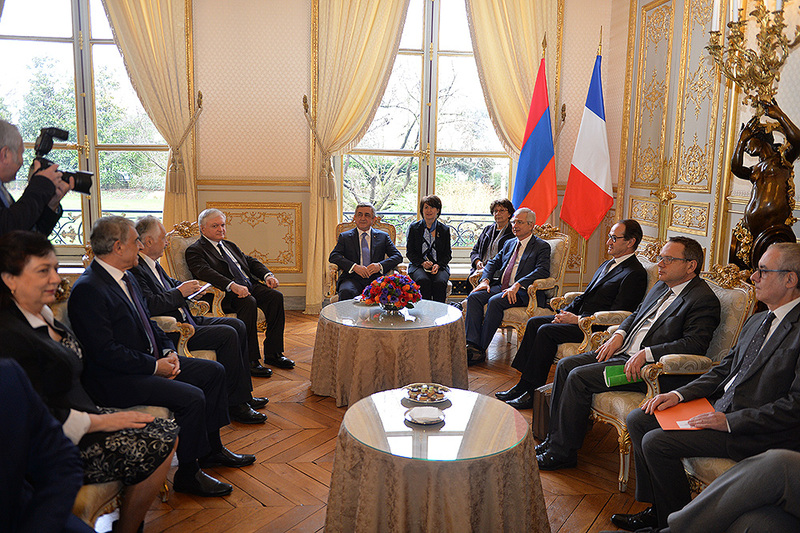 I am very happy that Yerevan and Paris are sister-cities and that the efficient cooperation between them is strengthening and expanding annually: every year a number of programs is being implemented in the bilateral, as well as multilateral formats, ranging from cultural programs to experience exchange in the areas of municipal economy and urban development. 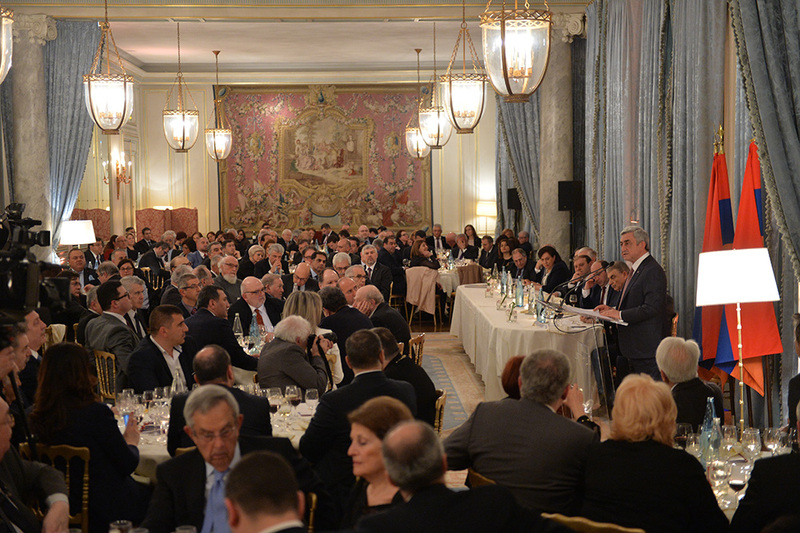 I would like to highlight our cooperation in the framework of the Association of the Mayors of Francophone cities. As a result of this cooperation, a number of schools in our capital have received opportunities to organize the enhance studies of French language; renovated and improved have been musical and art establishments, and libraries. The city, which has the largest number of libraries in the world, sets the example for us. This cooperation made French ambiance in our city more perceptible. 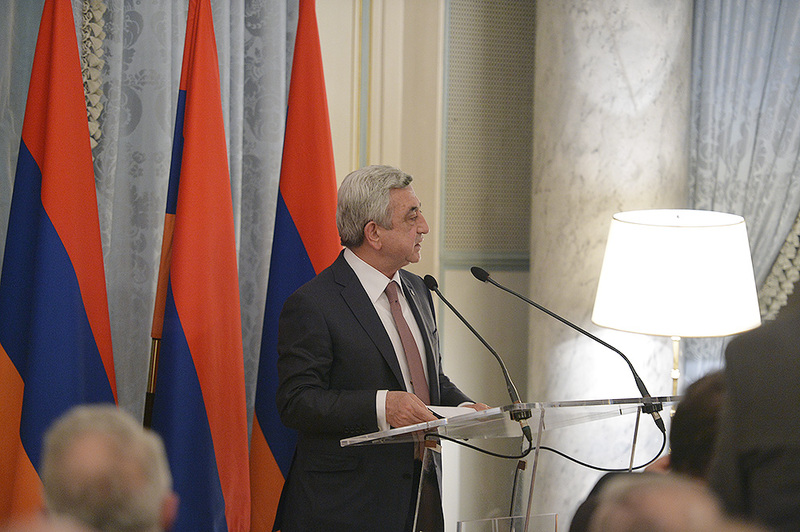 I hope that the program, which are currently underway, will be concluded successfully: the Armenia Home will open in Paris and we will have the France Home in Yerevan which will allow the Armenians and French feel at home in each other’s capital. In Paris one understands why after the Armenian Genocide tens of thousands Armenians opted for France and all that is French. Here, even trade is art, and art is a mode of life. Those people had come and because of your hospitality became the law-abiding citizens of France, respected and wanted professionals. 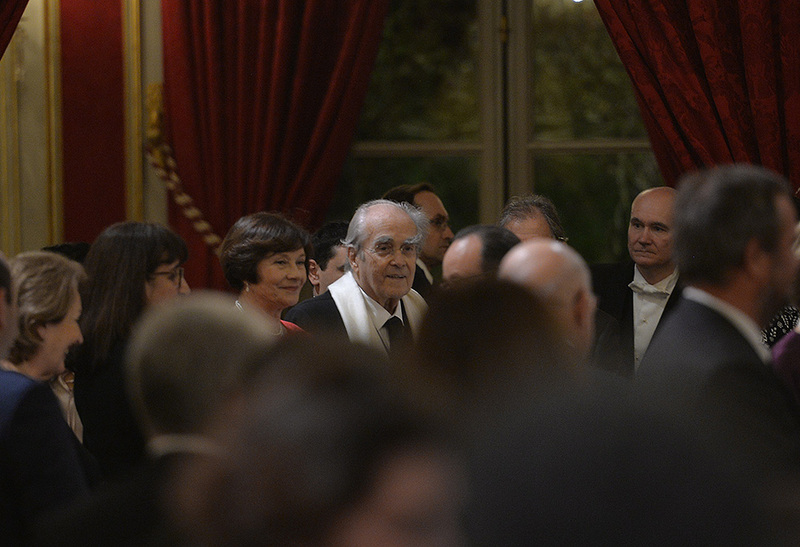 They also came so that today the world can listen to the songs of Charles Aznavour in sweet French, enjoy the beautiful music of Michel Legrand, movies by Anri Vernoy and Alain Terzian. Allow me address my compatriots present in this hall. 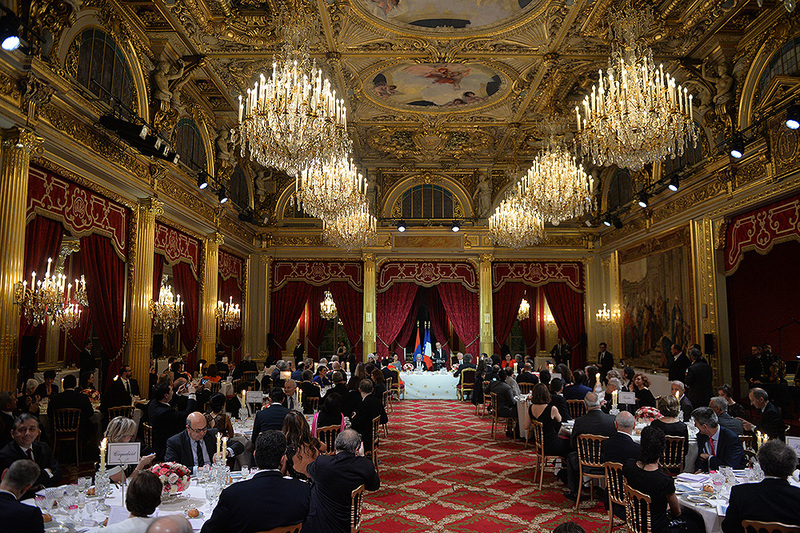 One can state confidently that you have brought your contribution to the development of the French culture and economy. Taking the best of all that is French, you have enriched it with a special Armenian flavor. Nowadays, when because of a crisis thousands of Syrian Armenians have settled in Armenia, we have come to feel and appreciate that flavor even more. With the Western Armenian of Siamanto and Varuzhan, flavorful Eastern dishes they have brought a new color and a new culture, making Armenia a little different, a little better. There is no doubt that with you we are stronger, more recognizable and more audible. Be assured that you are always welcome in Armenia as relatives, as partners, as tourists, as indivisible part of the Armenian nation. We are waiting for you to share our success and to stand by you in time of trouble. In conclusion, I would like to thank you once again, Madam Mayor, for your personal engagement in strengthening of the Yerevan-Paris ties. It was by your decision that on April 24, 2015 the lights of the Eifel Tower were turned off as a token of respect to the memory of the victims of the Armenian Genocide. 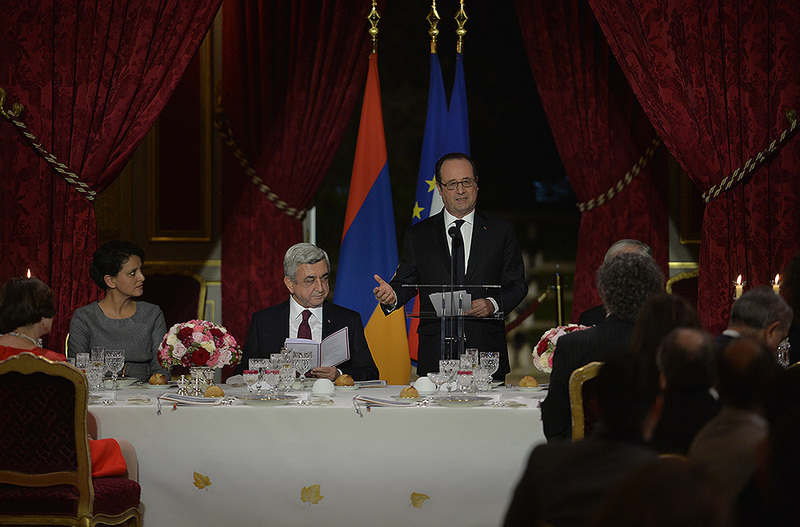 Let the lights be always bright as a symbol of the everlasting Armenian-French friendship. 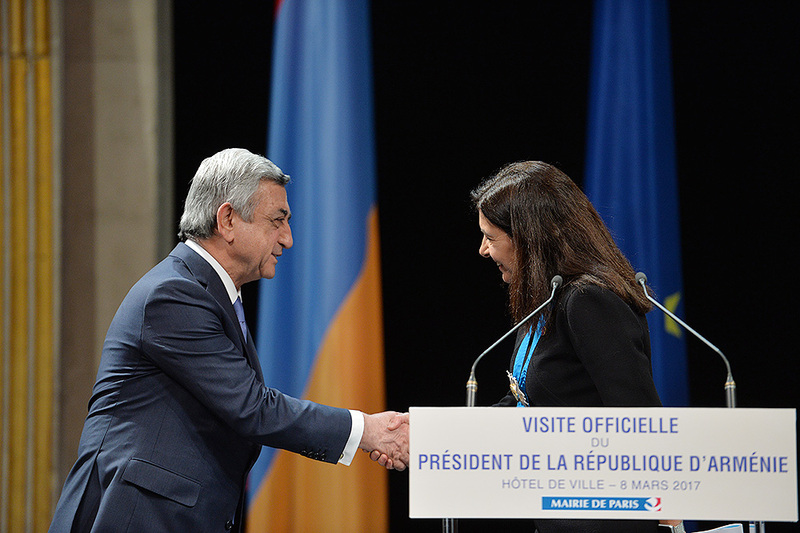 After receiving an exceptional welcome in Yerevan only several months ago, I am happy to host you in Paris today. Even though my presentation is taking place in the framework of the President Serzh Sargsyan’s official visit, my happiness today is not just inspired by protocol. It’s a joy which friends live when meet each other, communicate and get enriched with each other’s differences. It’s a great honor for me to receive this Order from you. 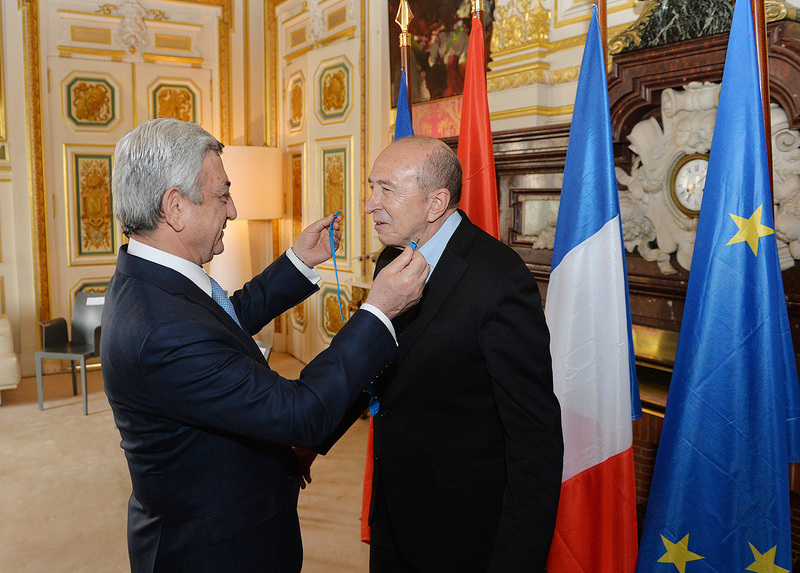 For me, it truly symbolizes a unique friendship which unites us, which unites Paris with Armenia. I say welcome to Paris and City Hall which is home to all Parisians. 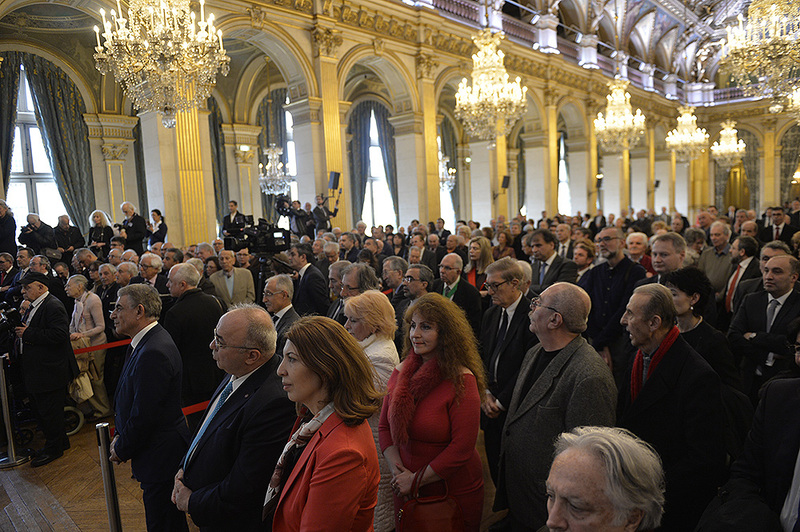 The Armenians living in Paris were able to create through their unwavering humanity a friendship; they are martyrs of the modern history and at the same time the guardians. Today I think of all those who were able to put the same energy in studying France and remembering Armenia, in becoming French and remaining Armenian, in living by French traditions and at the same time preserving the traditions of their ancestors. 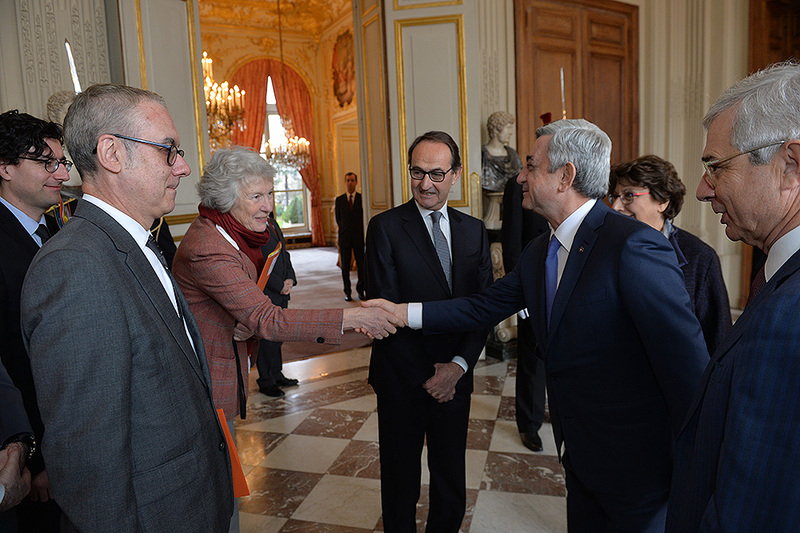 I would like to recognize the incredible job which these men and women are doing, with whom I have the pleasure to meet and cooperate; that work now is being carried out by the members of the council coordinating the activities of the Armenian-French organizations. Thus, allow me to salute in particular Ara Toranian and Murad Papazian present here for their work. I am confident that integration and success of your community is the result of your work, your persistency which never fails to be generous, as well as your unique ability to combine the understanding of the past with the vision for the future. 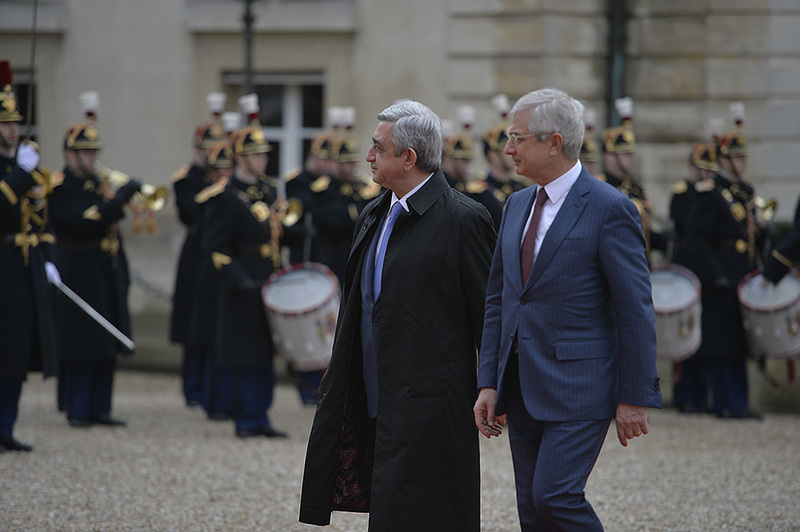 I believe there is a very precious point between the understanding of the past and the vision for the future; Paris and Armenia meet at that point. First because the understanding of the past makes us responsible for the history we are heirs of, but at the same time, we responsible for the present which we share with you today. Today, I want to publicly and solemnly state the words I said in October when you received me. I want to state loudly Armenia’s right to live in peace and security. With the same solemnity I would like to stress the necessity for the international community to recognize the Genocide of 1915 and importance of the criminalization of its denial. 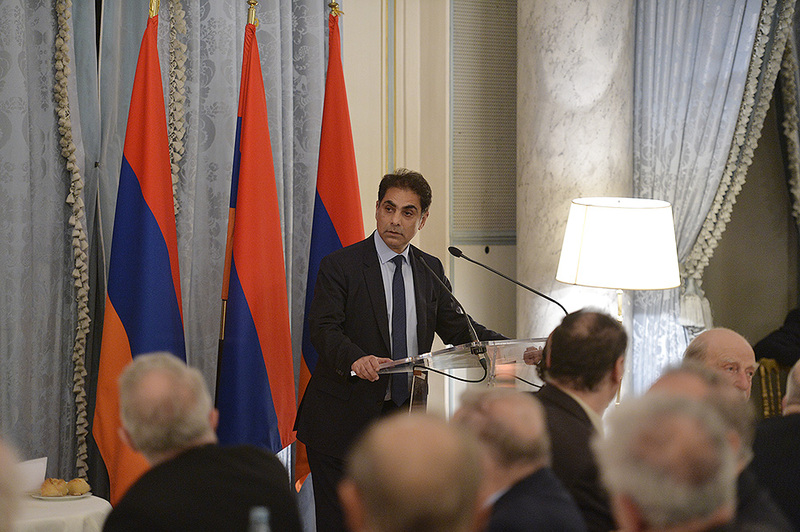 Paris has always been and will stand by the Armenian nation to defend the memories of its past and security of its present because the two are indivisible. Towards that end, together with the Yerevan City Hall and the Armenian Genocide Institute-Museum we organized here an exposition and for that purpose we every year hold a commemoration event at the Paris City Hall and at the same time commemorate the survivors and Father Komitas. Continuation of the works aimed at the preservation of the memory is also in our initiative to create a venue in the center of Paris which will immortalize the memories of Genocide and at the same time will signify the rebirth which will imply the destiny of the Armenian nation. I have defended the idea of creating such center from day one and I am hopeful that the idea will be called to life by the state and the region really fast, the city of Paris will be standing by them. I would like to greet the representatives of all municipal units who accompanied me during my visit to Yerevan. From that visit I received an inspiriting and fresh message: first, I saw the pivotal role, which the Armenian society attaches to culture, regardless of the difficulties it faces. I would like to quote with pleasure what one French official said: for the Armenians, to find creative expressions is like to nourish human life. In the streets of Yerevan, culture appeared to us as a phenomenon endowed by the society with gentle humanity, that is, not as something which remained when all the rest is forgotten but as a phenomenon which we refuse to forget. In that charming energy of the capital of Armenia I saw the reflection of the wealth which had been preserved and passed on by Komitas. After visiting your country, I believe I started to better understand the immense value of Komitas’s work: on the eve of the horrendous trial, which the Armenian people had to face, through the preservation of the Armenian national culture to save a unique, universal and living part of the Armenian nation. Familiar with the genius of Komitas, I saw culture in Yerevan not as something rare, which belongs to the cultural elite only but something which is accessible to all and is nourished by all. We were impressed in particular by the TUMO center. Hundreds of young people, some gifted, some may not so, are studying informatics, open the world of innovative technologies, and will certainly create start-ups. There is no doubt that the Center is an innovative hub but at the same time it’s a territory for the creation of the brains for the future; in France, we don’t have yet such a center. Now, we are working actively to introduce the same great idea in our city. As you see, Paris and Yerevan, France and Armenia can give each other as much as receive from each other, and that is something peculiar of a great friendship. I would also like to take advantage of the presence of the Armenian clergy serving the Armenians of France and yours, Madam Minister of Diaspora, to declare that Paris shows full solidarity with the Christians of the East, and with all victims of the conflicts in Syria and Iraq. That solidarity is very well defined; it is manifested in accepting multiple refugees, creation of the bridges, which are often fragile, sometime successful, but I know that any small bridge is more precious than arrogant walls of the world. The Armenian clergy walked down that very bridges. Paris owes them tis cultural, intellectual, and spiritual wealth, and the Parisian Armenians are thankful to Paris for the chance to survive and to rebirth in the future. In honor of these bridges, we have decided to rename one the streets of Paris after Zabel Esayan who was at the pick of the sufferings of the Armenian nation and symbolizes these sufferings. 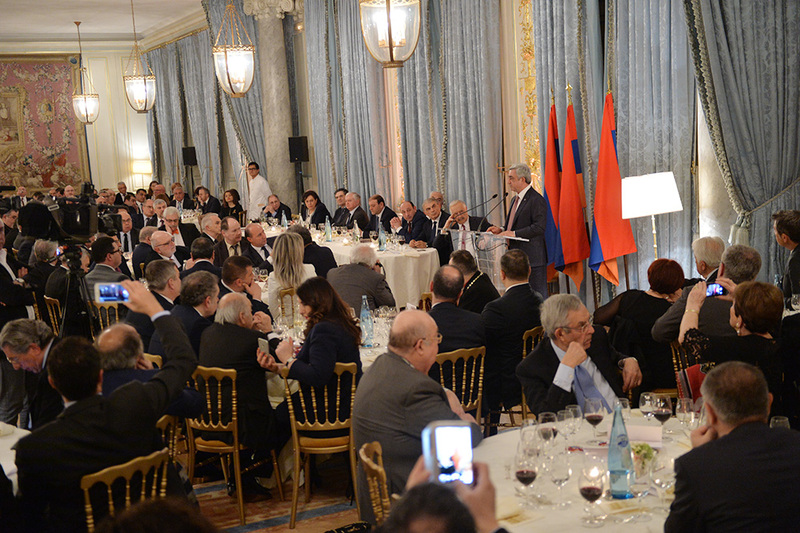 In Paris, we keep the memory of the torments, which the Armenian nation had gone through, of the resistance and fight but at the same time we open new roads so that they, just like in Yerevan, express hope, inventions, and initiatives. I wish that the Paris-Armenia dialogue continues remembering the dire days and in the name of a better days, a dialogue with the promise of a great and wonderful future. 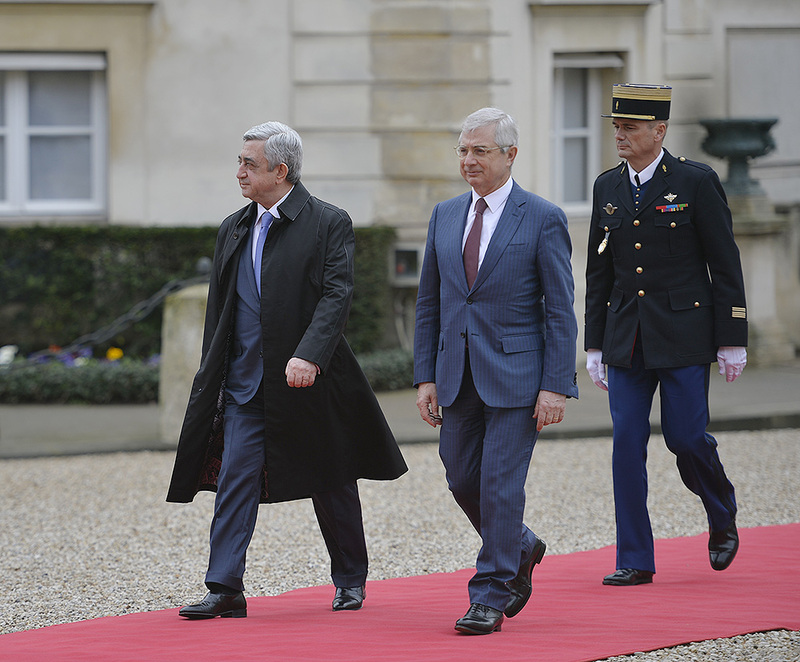 At the Élysée Palace there took place a meeting between the President of Armenia Serzh Sargsyan, who is in France of official visit, and the President of France François Hollande. 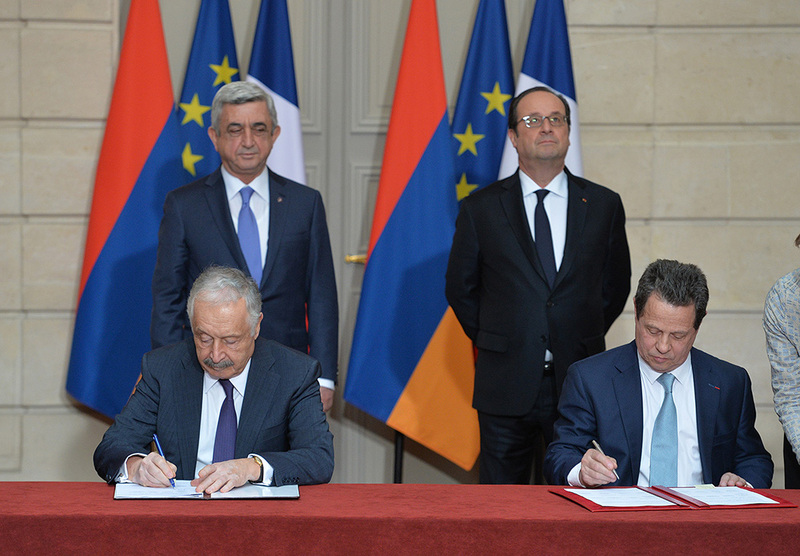 At the conclusion of the meeting, signed were documents aimed at the development and deepening of the Armenian-French relations in a number of areas. 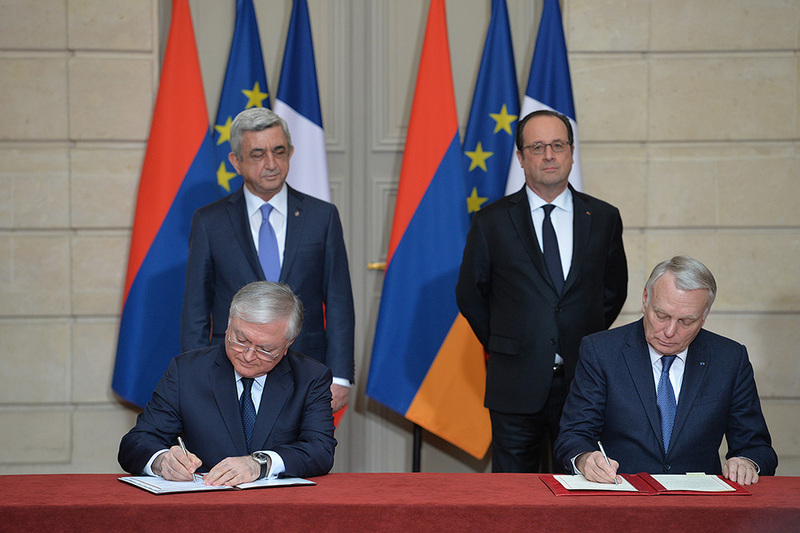 In particular, the agreement betweent the Government of the Republic of Armenia and Government of the French Republic on the French University in Armenia, Memorandum of Intentions betweent the Ministry of Foreing Affairs and International Development of France and the RA Ministry of Economic Development and Investments on the cooperation in the area of tourism, a framework cooperation agreement between the RA National Academy and French University of Armenia, l'Université Fédérale Toulouse midi-Pyrénées, National Center for Scientific Research, National Polytechnic Institute of Toulouse, Toulouse III Paul Sabatier University, Toulouse 1 Capitole University, and the University of Toulouse-Jean Jaurès. 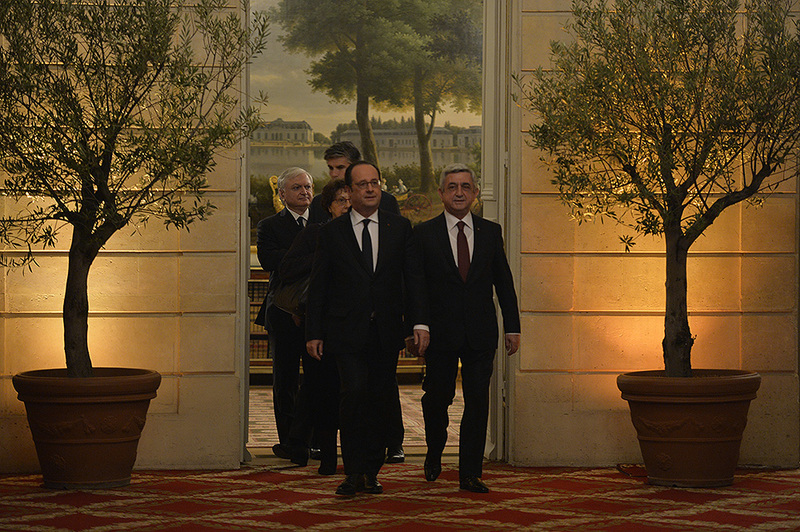 The Presidents of Armenia and France recapped the results of the negotiations with the joint statements for the mass media. 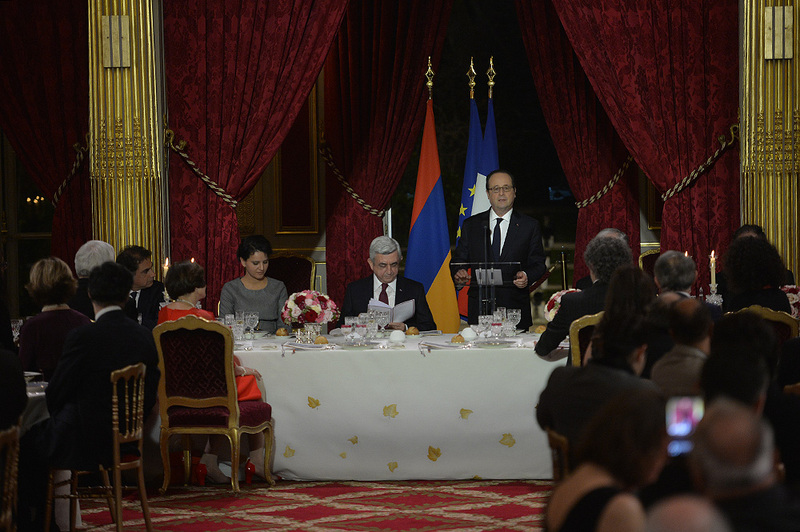 I thank President Hollande for the invitation to visit France in this momentous, the 25th year of the Armenian-French interstate relations and warm welcome which I enjoy always on this land which became so dear. This is the best moment to recap together our achievements of twenty-five years and to discuss future steps. An interesting fact: throught the last 25 years, at the presidential level alone there have taken place 25 visits. 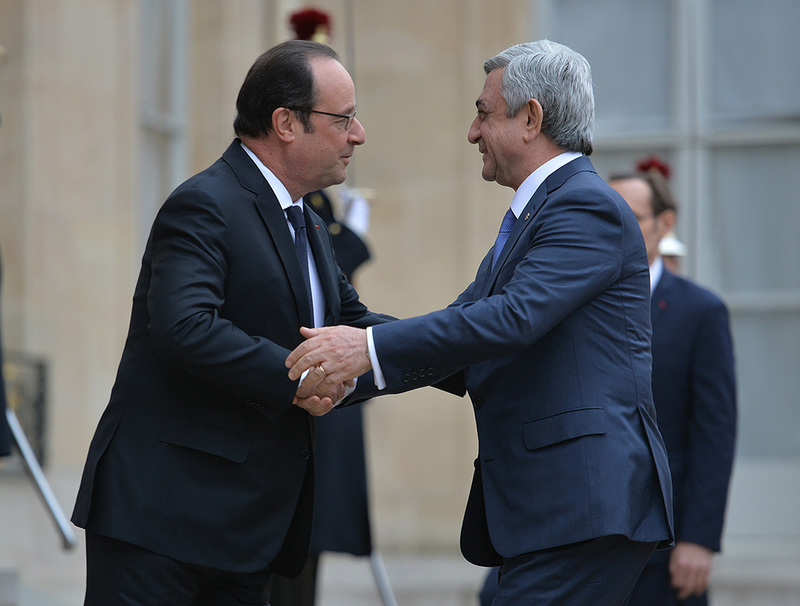 This proves that the Armenian-French relations constantly remain in the center of attention and consideration. Moments ago, we have concluded our negotiations; we discussed numerous issues of mutual interest. I would like to state with satisfaction that on all issues our approaches are very close: it relates to our bilateral ties as well as to the pressing regional issues and events. 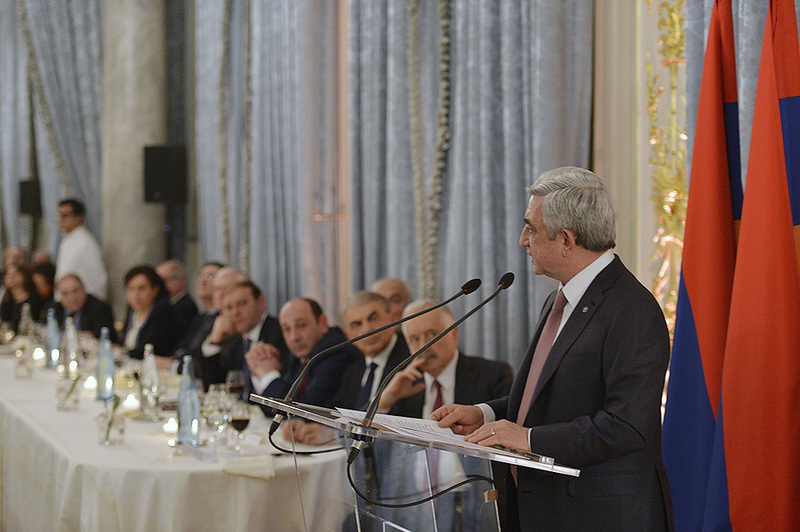 There is no doubt that the centuries-long Armenian-French relations and historical and cultural ties, as well as the non-existence of political problems constitute a solid base which allows our relations to expand further in the atmosphere of mutual respect and trust. 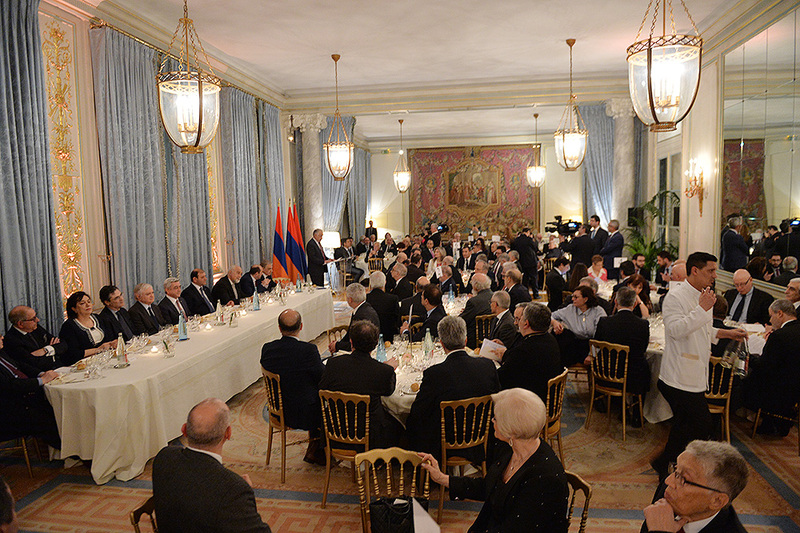 We stated with satisfactoin our achievements: a steadfast political dialogue, active interparliamentary, economic, scientific, educational and cultural ties, deepening decentralized cooperation, mutually beneficial cooperation in the internatonal settings, assistance programs implemented by France in Armenia, mutual support on significant international issues, as well as the creation of a comprehensive legal field. 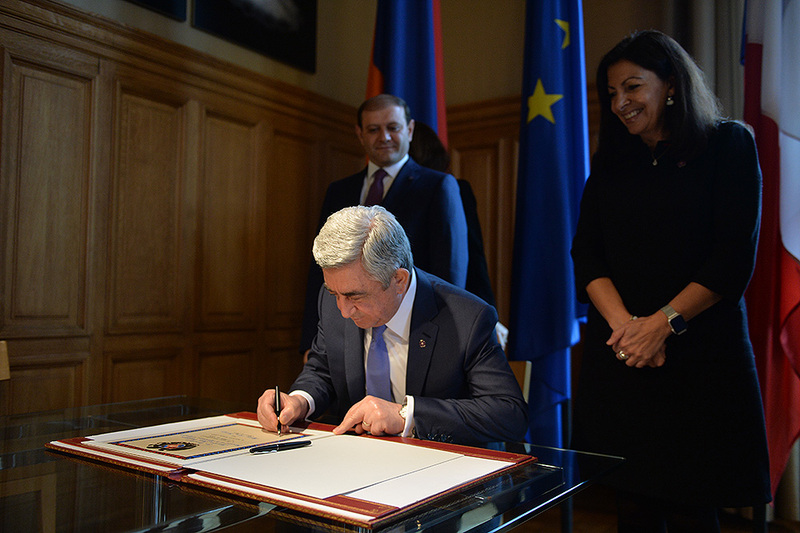 Today, we have made yet another step towards deepening our relaitons, signing significant documents for the estblishement in Armenia of the branch of the French Development Agency and PROPARKO, cooperation in the areas of tourism, inter-university ties, science and education as well as in the area of diplomatic service. There is no doubt that the high level political dialogue constitutes a base for the efficient economic cooperation. Even thought our economic relations have not reached the level of our political ties, we are taking resolute steps in that direction. 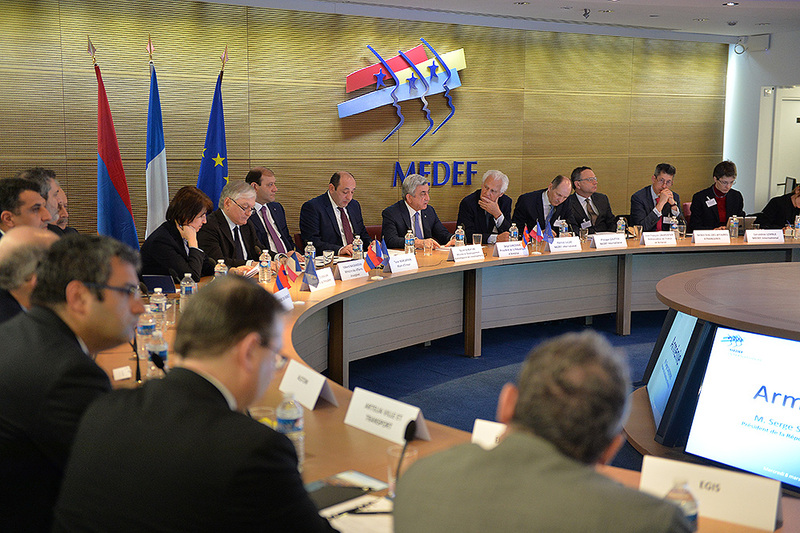 In this context, the MEDEF business forum organized in the framework of the visit is very important; it, I am confident, will become a serious platform for the invigoration of the contacts between the business circles of our two countries, the increase of the volumes of the bilataral trade and expansion of its framework. 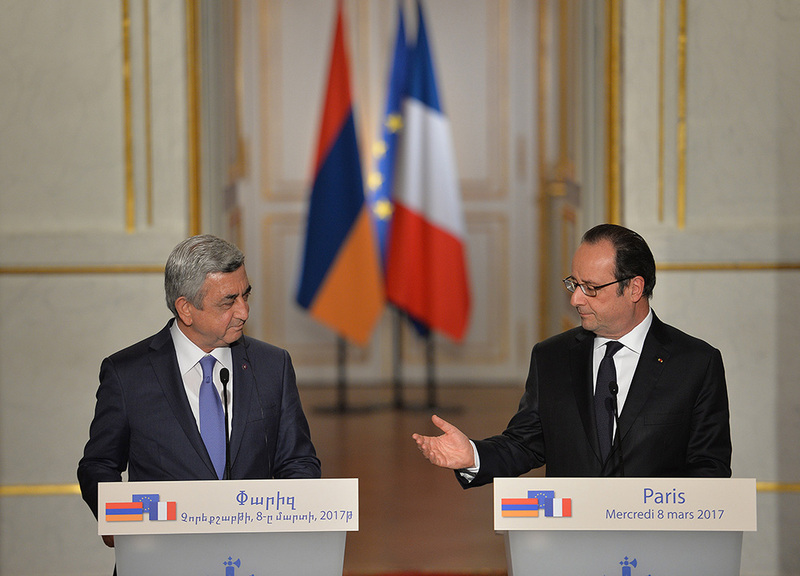 Certainly, another important area of the Armenian-French cooperation is the European format. We cooperate efficiently and cordially in all European structures and will continue to do so at all levels. One week ago, in Brussels with President Tusk we announced the conclusion of the negotiatios on the Armenia-EU comprehensive and extended new agreement which means that very soon the relations between Armenia and the European Union will acquire a totally new quality and scope. 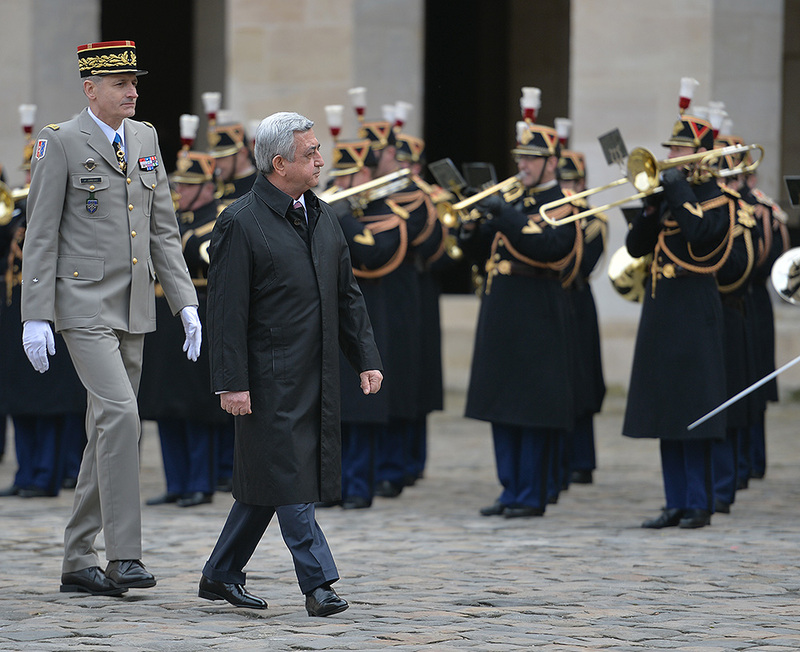 France, just on other vital and significant for Armenia issues, on this too was by our side, enhancing the advancement at every stage of cooperation. 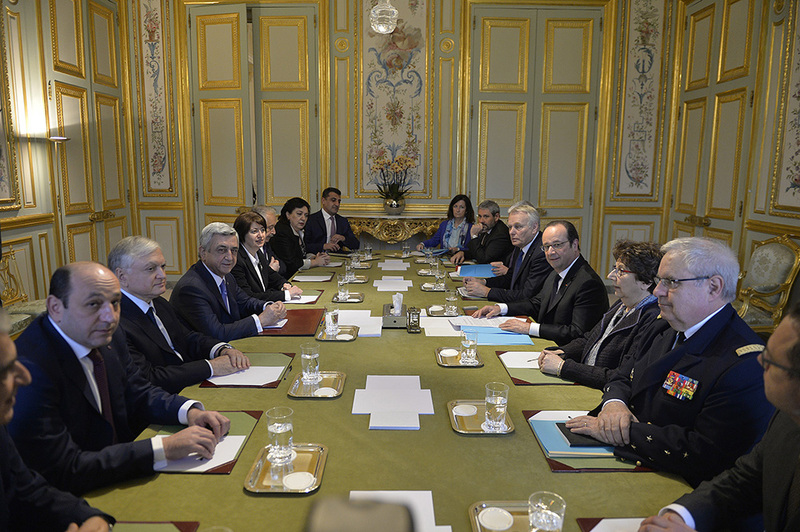 With President Hollande we discussed also issues related to the Summit of Francophonie to be held in Armenia in 2018. I reiterated our pledge to conduct it at the highest possible level, and I will hold the event in the center of my immediate attention. We have also spoken about the forthcoming parliamentary elections in Armenia which, in my opinion, will become a step forward on the road leading towards making Armenia a democratic country, with the rule of law. We see no alternative route for development. Armenia has set the bar very high and with the assistance of her Western partners will move steadfastly to reach that bar. Certainly, with the President of France we have also discussed regional issues and the NK peace process which occupies a pivotal role in the political dialogue of our countries. I thanked President Hollande for the efforts aimed at the peaceful resolution of the issue on the personal level as well as in his capacity as a Co-Chair of the OSCE Minsk Group. 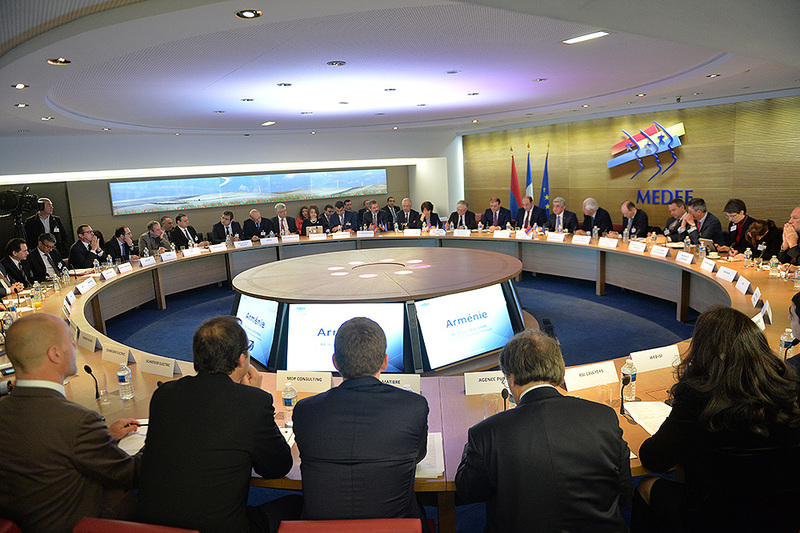 Armenia is committed to the peace process conducted in the framework of the MG Co-Chairs and believes that it is necessary to unconditionally implement agreements reached at the Summits in Vienna and Saint Petersburg and first of all to observe the trilateral ceasefire agreement of 1994-95, create mechanisms for the investigation of the incidendes, expand the capabilities of the Personal Representative of the OSCE Chairman-in-Office. In making decisions it is necessary to be guided by a reasonable approach that a war would cast a irreparable blow for the entire South Caucasus region, if not a larger region and the security at large. The essence of the NK issue is the struggle of the people of Artsakh for self-determination. People are in the core of the right for self-determination with their lives and the unalienable right for freedom which means that all other issues must be subordinate to it. 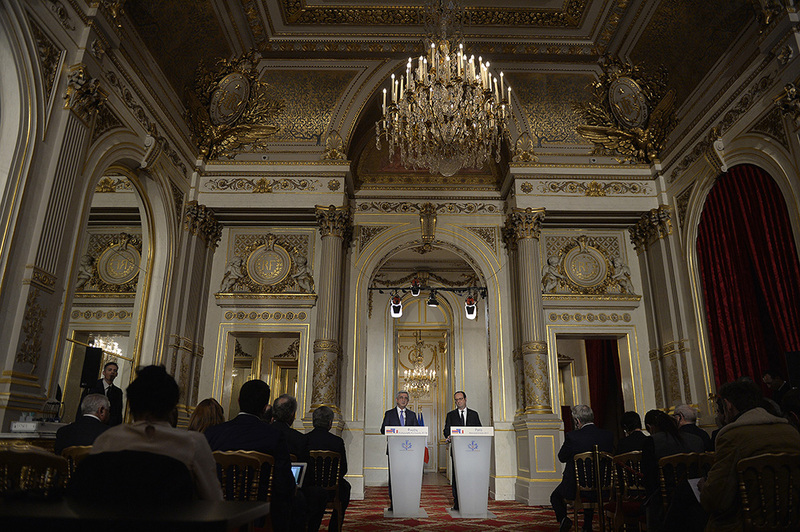 In conclusion, I would like to express confidence that the friendly relations between Armenia and France and our close partnership will continue to deepen and strengthen. 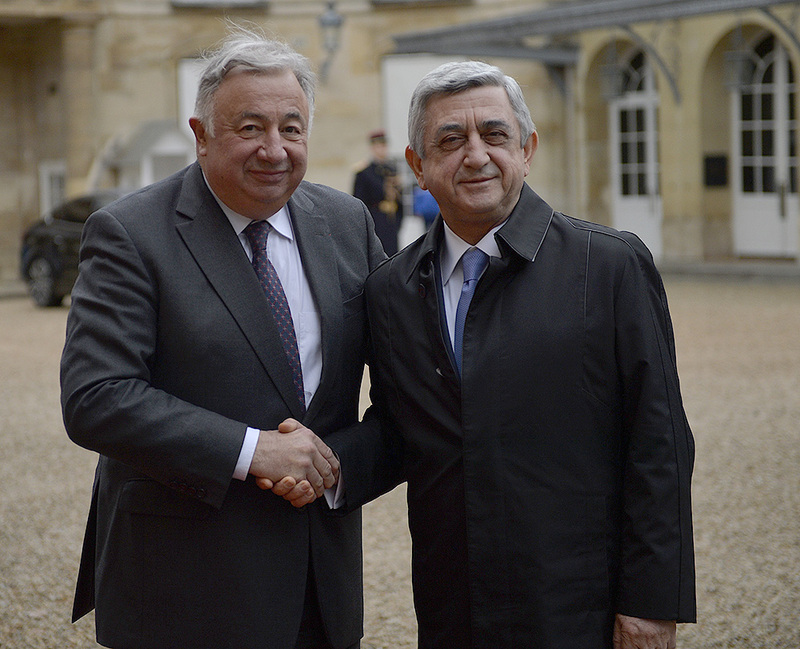 I am very pleased to host the President of Armenia Serzh Sargsyan. 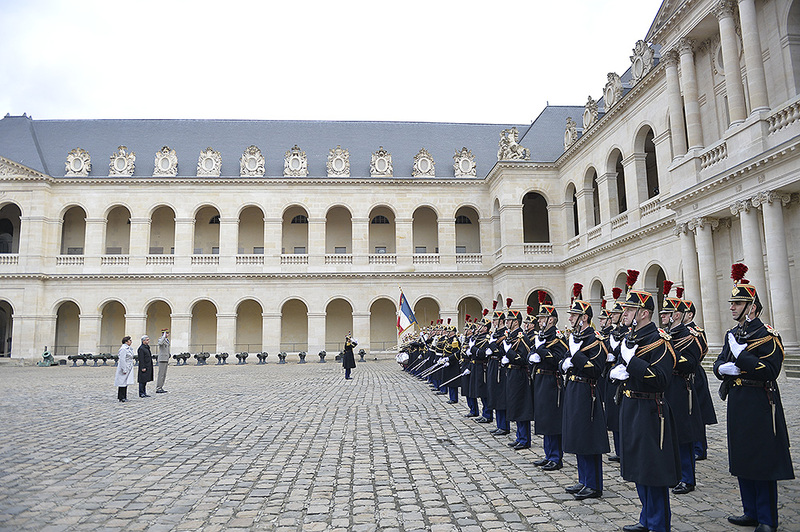 He has been here at the Élysée Palace for many times but today’s visit is special because Armenia and France celebrate the 25th anniversary of the establishment of diplomatic relations. Besides, today is the International Women’s Day, and I know that in Armenia it’s a holiday. It shows the importance Armenia attaches to the protection of women’s rights. 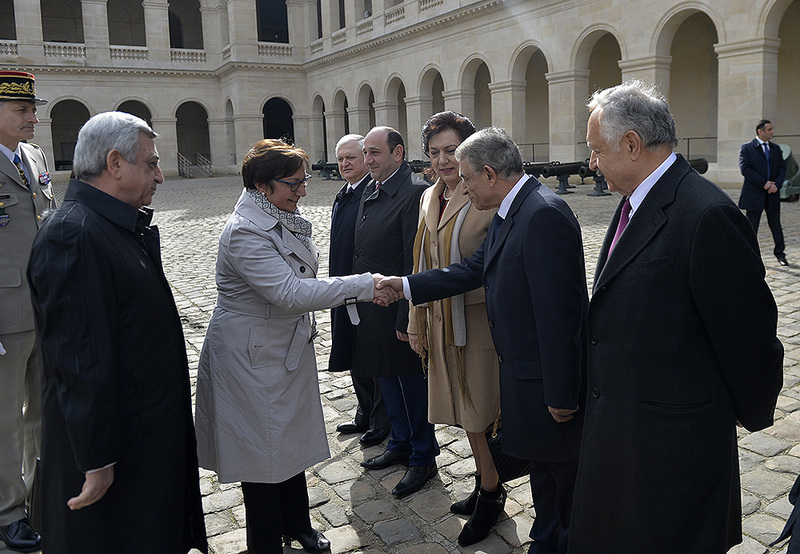 This visit is an occasion to remind of the mutual strength of the Armenian-French friendship. 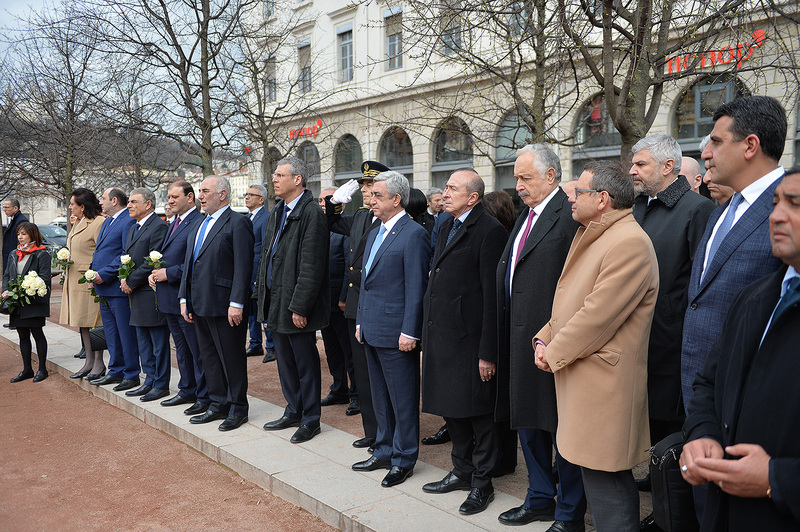 This is a friendship, which on one hand is reinforced by the presence in France of our compatriots of the Armenian descent but at the same time it is mutual because it’s been a long time since we recognized the Armenian Genocide. On our behalf it’s a manifestation of the fact that the international community will never accept the annihilation of a nation which became a revenge target of the state or another nation. We view the recognition of the Armenian Genocide as a means for establishing peace: peace of mind and peace between the countries. We have always wanted to include the recognition of the Armenian Genocide in a more global process, where we pay attention to all crimes which are regrettably possible to commit against humanity and war crimes. That’s why we wanted to have a resolution which would be adopted and would be able to punish those who deny the Genocide or existence of crimes against humanity. 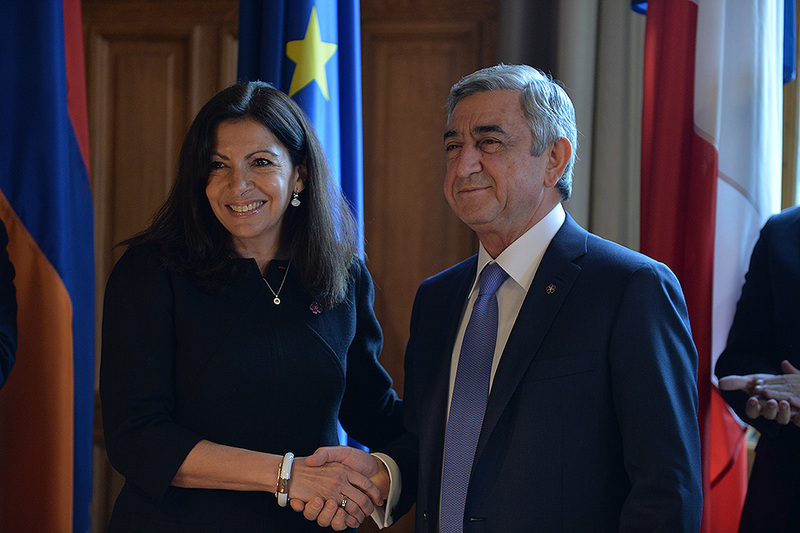 Our friendship is mutual also because there exist relations which after Armenia’s independence went through important developments, particularly in the economic area: multiple French companies have made investments in Armenia, in different areas such as industry, tourism, telecommunications, services, etc. 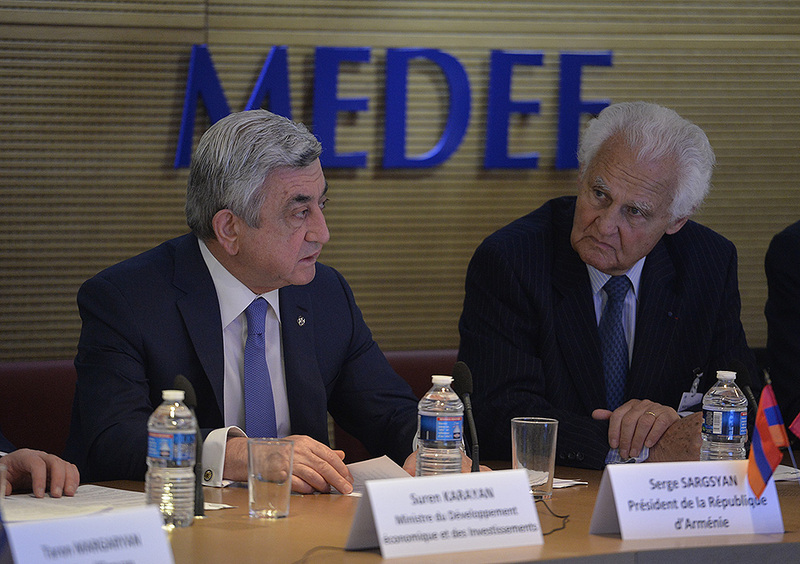 However, we believe that we can do more and for that very reason President Sargsyan met with the MEDEF and also tonight, during the state dinner new contacts will be established to encourage future investments. At the same time, Armenia maintains important relations with Russia and Iran. Especially with Russia, as Armenia is a member to the Eurasian Economic Union thus can have close trade relations with other members of that Union. 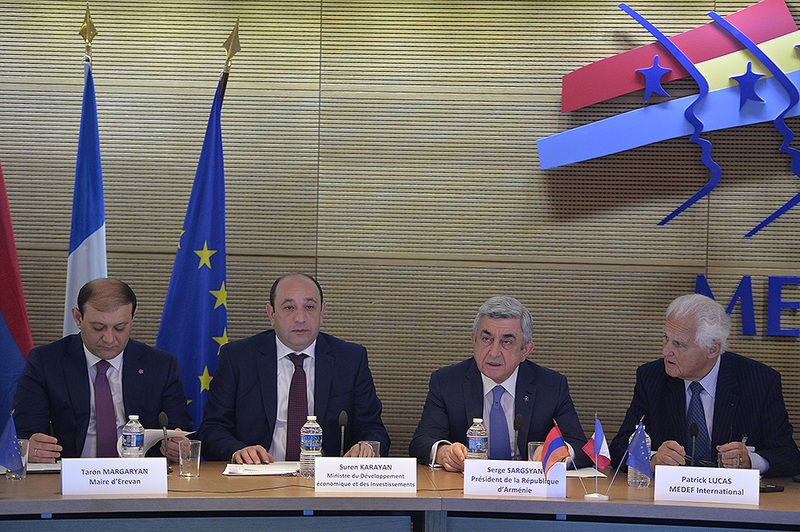 At the same time, Armenia is linked to Europe and today conducts negotiations over a framework agreement. We have also referred to the inter-university and cultural ties; important agreements have been signed. As you know, the French University is functioning in Armenia which has agreements with the prestigious French scientific and university establishments, and today a new one has been added. These agreements will allow Armenia to utilize our talent; we are also eager to receive more and more Armenian students. There are also linguistic ties: Armenia is a member to the International Organization of Francophonie and in 2018 will be hosting the Summit of the Organization. I believe this is a compelling responsibility which has been assumed by Armenia this time. 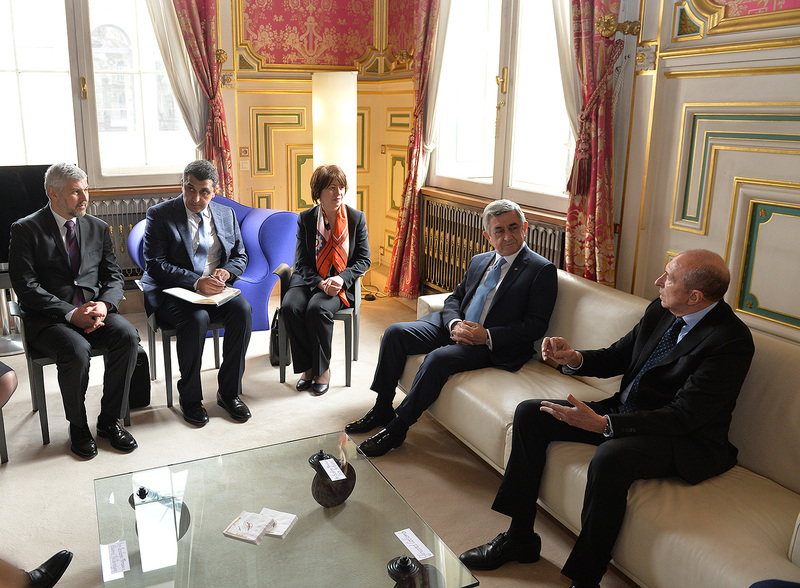 We have also spoken of our political relations, particularly about how France can help. It was mentioned that France is involved in the NK peace process. France, together with the US and Russia, is a OSCE Minsk Group Co-Chair, and we are willing to work towards the resolution of the issue. First, it is necessary to refrain from the recurrence of the incidents of recent weeks and months, to have the mechanism for the investigation of the incidents, which would allow to prevent such incidents and punish for the actions which threaten peace. 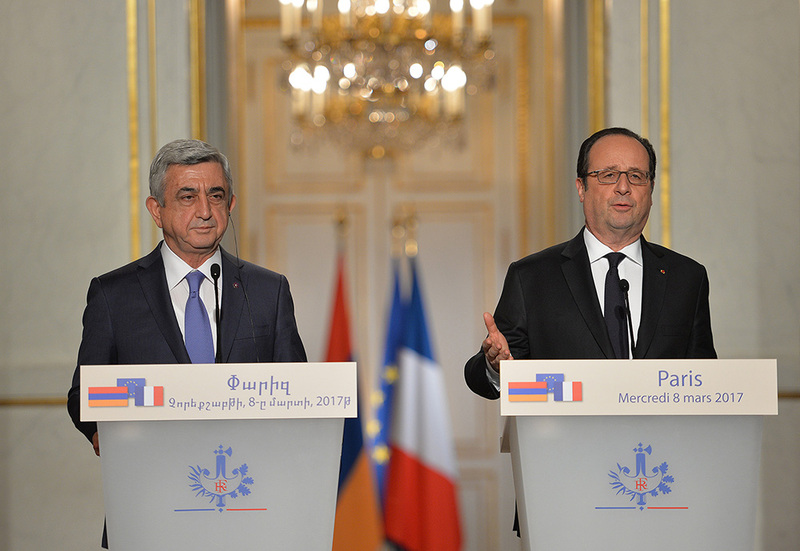 Also, we want to find a political solution, and France has reiterated her commitment to Armenia and Azerbaijan - certainly together with other Co-Chairs of the Minsk Group – to finding a lasting solution. I would like to note that the visit of President Sargsyan is a very much waited for visit; he will be exceptionally hosted not only in Paris but also in Lyon. 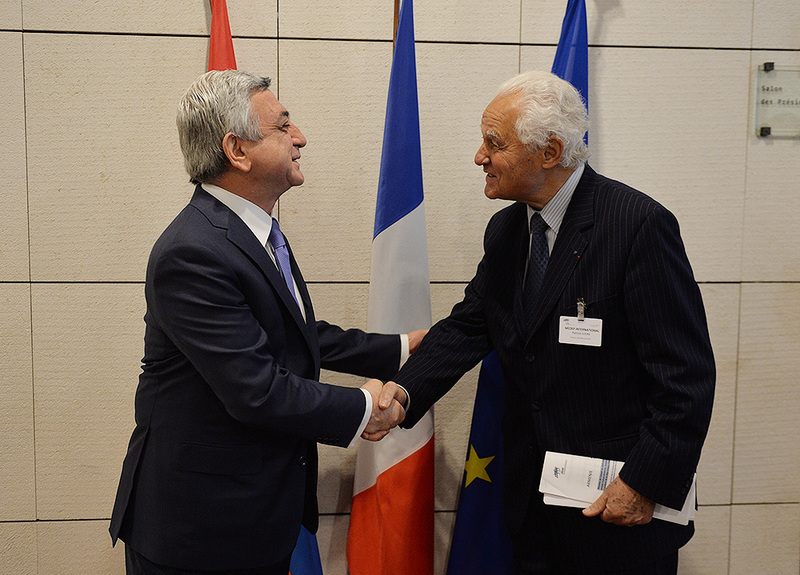 Lyon and Armenia have extensive ties. It should be underscored that all regions of France carry out close decentralized cooperation with their Armenian partners. In conclusion, I would like to refer to the event which is very important and emotional for me. I am speaking of the Armenian Genocide, the events dedicated to the 100th anniversary of that horrendous tragedy. 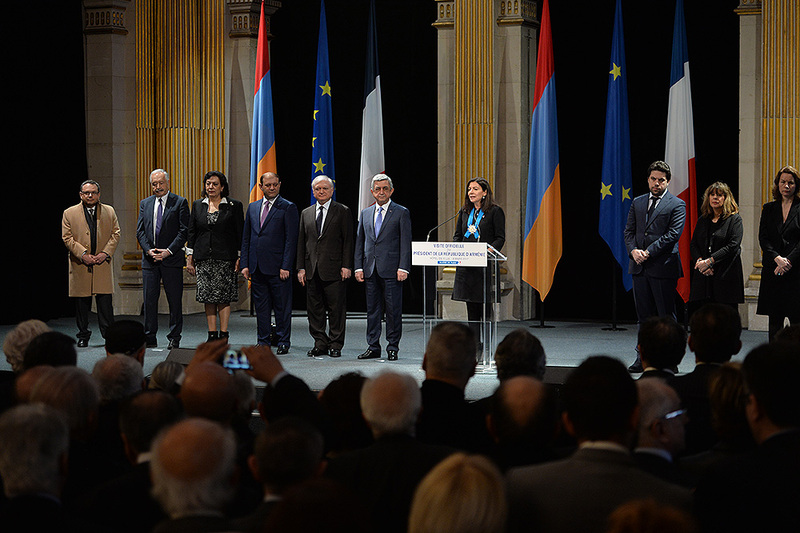 I was in Yerevan at that time and my presence there proved once again that France will continue to fight for the recognition of the Armenian Genocide. 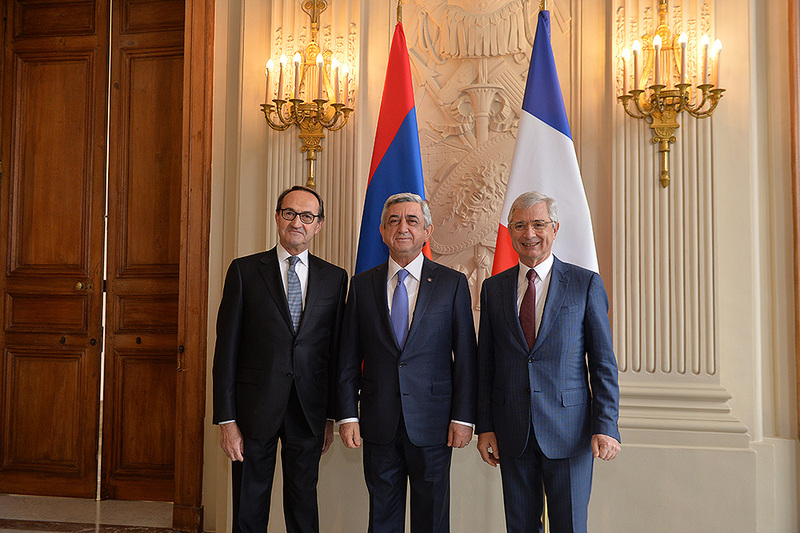 President Serzh Sargsyan met with the President of French Senate Gérard Larcher. 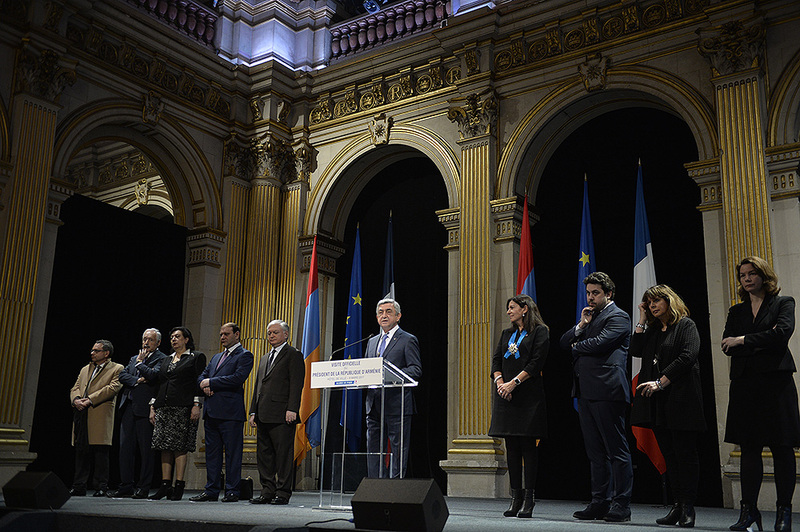 The parties concurred that the Armenian-French interparliamentary dialogue will continue to play a special role in the strengthening of the relations between the two friendly states. 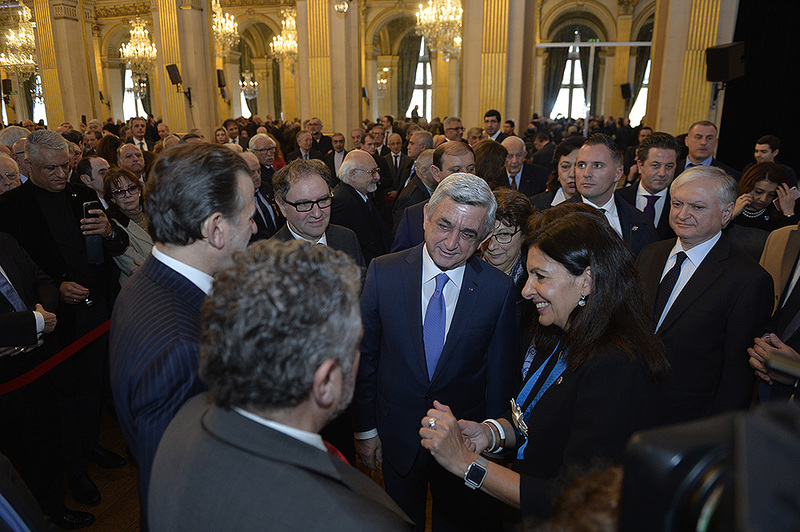 Serzh Sargsyan noted with satisfaction that the National Assembly of Armenia has formed a good tradition of maintaining friendly relations with many of the European parliaments, including the Senate of France, and it is necessary to preserve and develop that tradition. 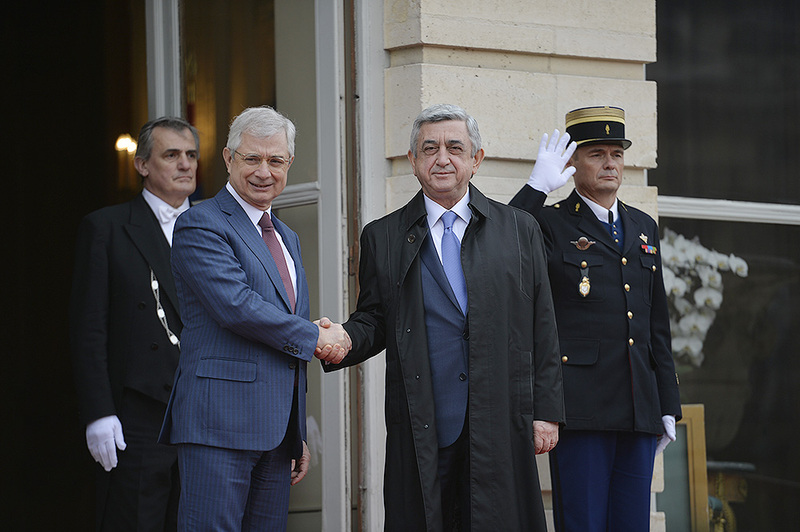 According to President Sargsyan, true to the spirit of the Armenian-French relations, parliamentary cooperation is manifested also in the multilateral platforms such as Parliamentary Assemblies of the Council of Europe, OSCE, and NATO. 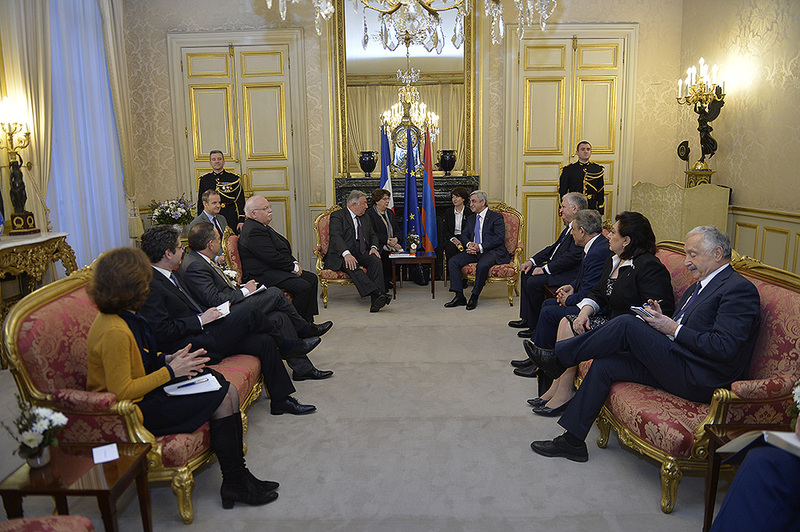 The President hailed the readiness of the French delegation at the European Parliament to constantly hold in the focus of their attention issues which are important for Armenia. 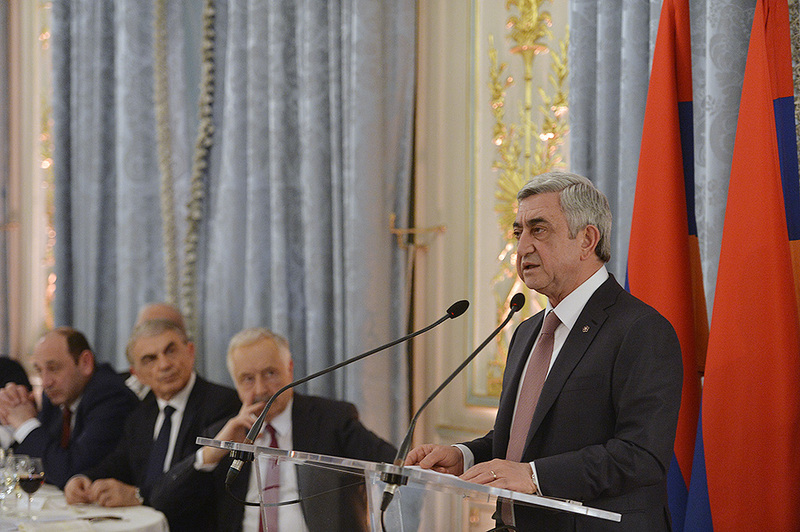 Serzh Sargsyan also praised the efficient cooperation of Armenia and France in the framework of Francophonie. At the meeting, the parties discussed also issues pertinent to the Armenia-EU relations, the NK peace process, regional issues and challenges. 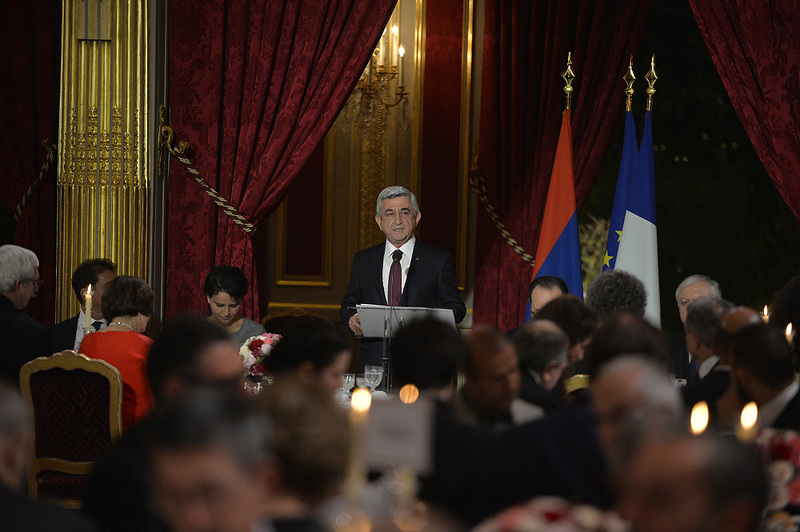 The President of Armenia spoke also about the indispensable role of France in the international recognition and condemnation of the Armenian Genocide and expressed gratitude to the parliamentarians for their persistent fight against intolerance and hatred. 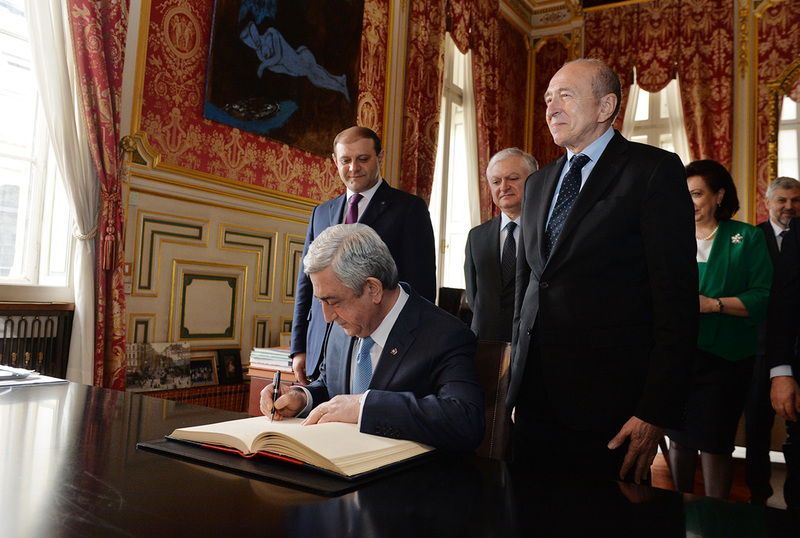 At the conclusion of the meeting, President Serzh Sargsyan made an inscription at the Livre d’Or of the Senate of the French Republic. 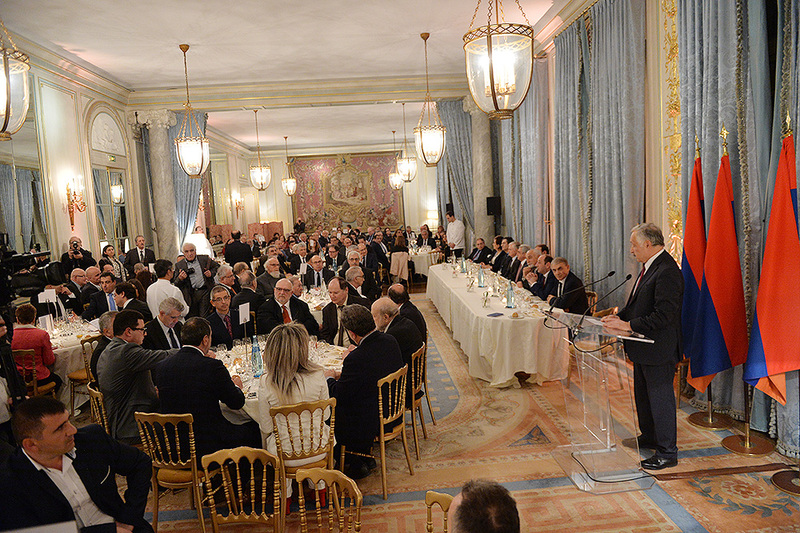 “It is a special pleasure to be hosted here – the Senate of the friendly France, a place full of history. Recapitulating the rich and exclusive French culture, it has truly become a venue of the perfect cohabitation of the new and old. I live the feeling of pride and exhilaration finding myself in the place where 17 years ago the resolution on the recognition of the Armenian Genocide was adopted. 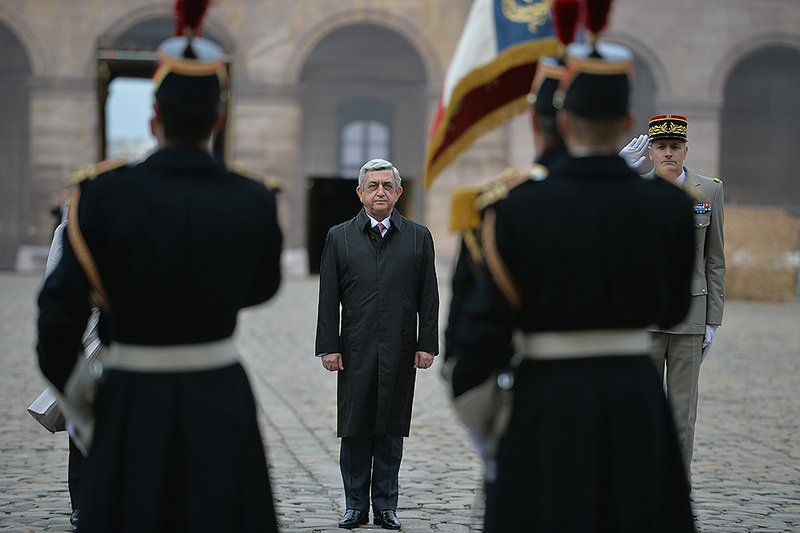 It reiterated once again the leading role of France in the protection of universal human rights and, of course, unconditional solidarity with the Armenian people,” wrote the President of Armenia. 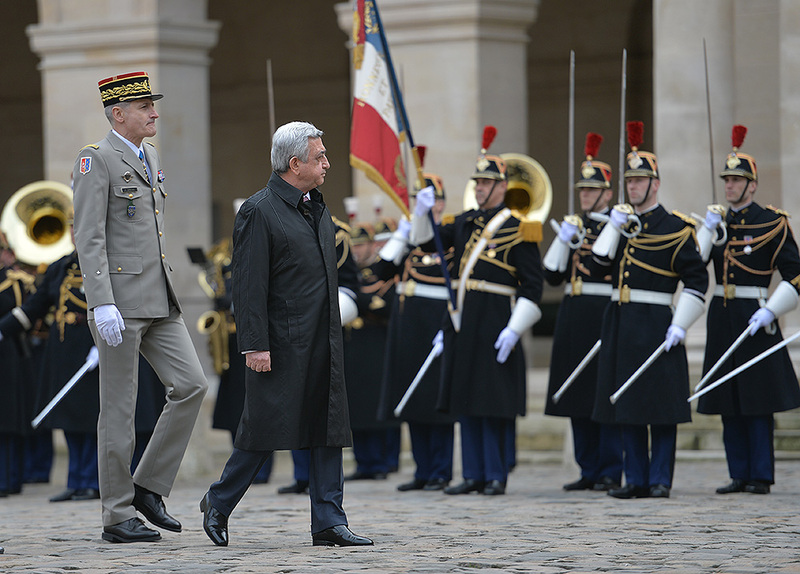 In honor of President Serzh Sargsyan, who is in France on official visit, in the evening of March 8 President François Hollande at the Élysée Palace gave an official reception. 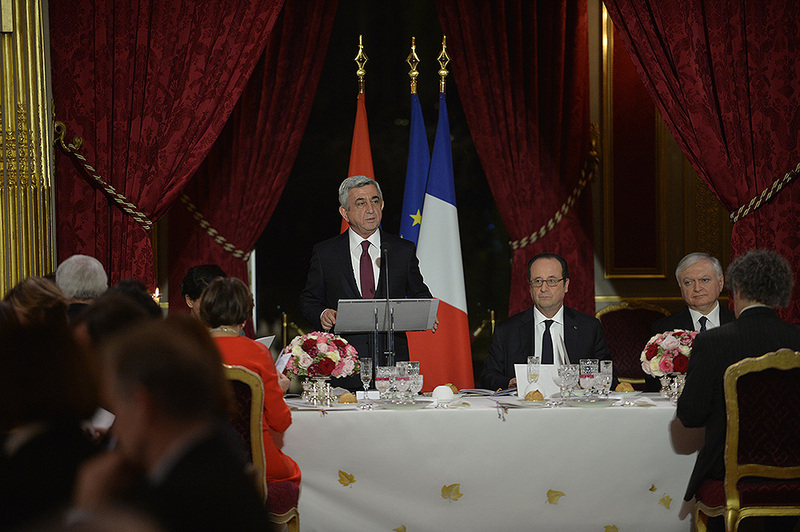 Presidents Sargsyan and Hollande made reciprocal toasts in which they spoke about the Armenian-French centuries-long friendship, strong interstate relations formed in 25 years after the establishment of diplomatic relations and prospects of their development, issues of the bilateral agenda, which includes various areas, as well as about the important role of the Armenian-French community in the strengthening of the relations between the two countries and two nations. 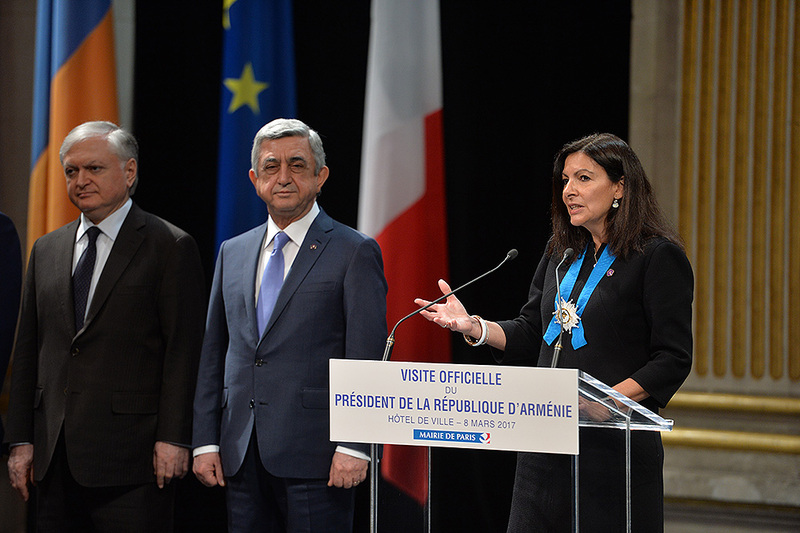 As the saying goes “a friend in need, is a friend indeed.” But it’s also said that “a true friend is one who’s happy for your success.” The glorious Armenian-French friendship proves that when we put together these two, friendship becomes exceptional. 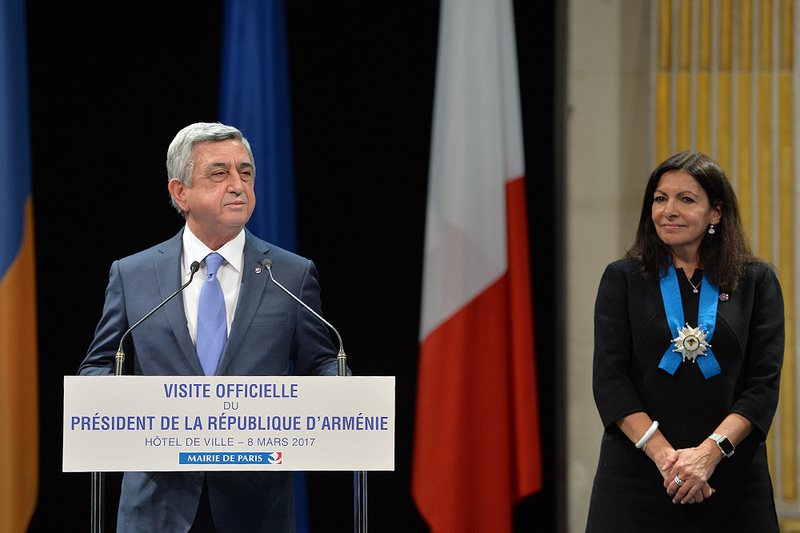 The Armenian-French friendship didn’t start with Armenia’s independence: our peoples knew each other and had the chance to cooperate closely since early Middle Ages. Back in the times of the Kingdom of Cilicia, Armenian kings were allies and kin of the French monarchs. It is proved by the fact that the last King of Cilicia Levon VI was put to rest at the burial site of French royalty Saint Denis Abbey. Because of these historic ties, after the collapse of the Soviet Union the Armenian people were quite familiar to the French people and from day one of our independence the interstate relations between Armenia and France soared. It’s been my great honor and pleasure to work with you for the benefit of this friendship which has been constantly guiding and empowering the Armenian-French interstate relations. As a result, we have an exceptionally comprehensive agenda, programs ranging from political to economic, from humanitarian to long term development projects. I am confident that this is not the limit: through our joint efforts, we will augment numerous manifestations of our friendship with new ones. As you once said, our philosophy is not shaped by the time or the position we hold. 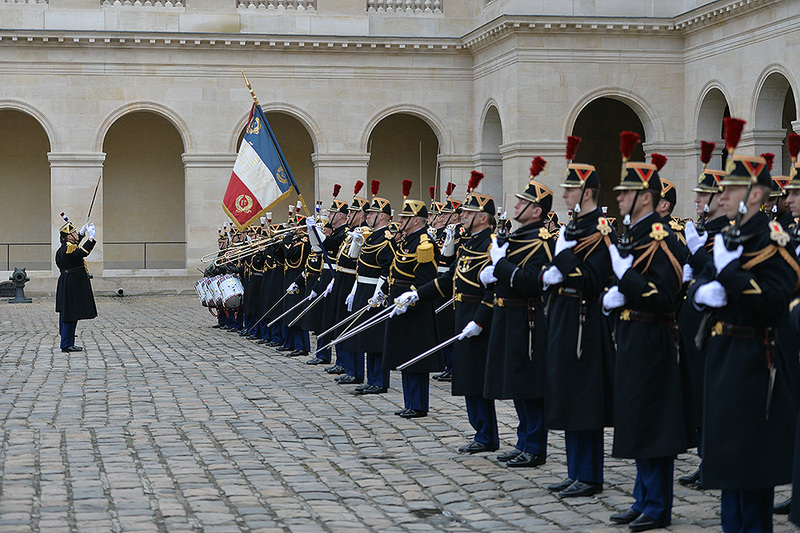 I thank you and all high-level French officials for this warm welcome, for the atmosphere of mutual respect and trust and the readiness to further promote our relations. Since my visit coincides with a very beautiful holiday – March 8, I would like to congratulate you, dear ladies and in your person all Armenian and French women, and wish you boundless happiness. Your role in bringing harmony and charm to our lives and policies is indispensible. Working together for a quarter of a century, at the bilateral as well as multilateral levels, we have travelled a road full of events, have multiplied and deepened the relations which we inherited historically and made them more practical, more substantial, aimed at the future. 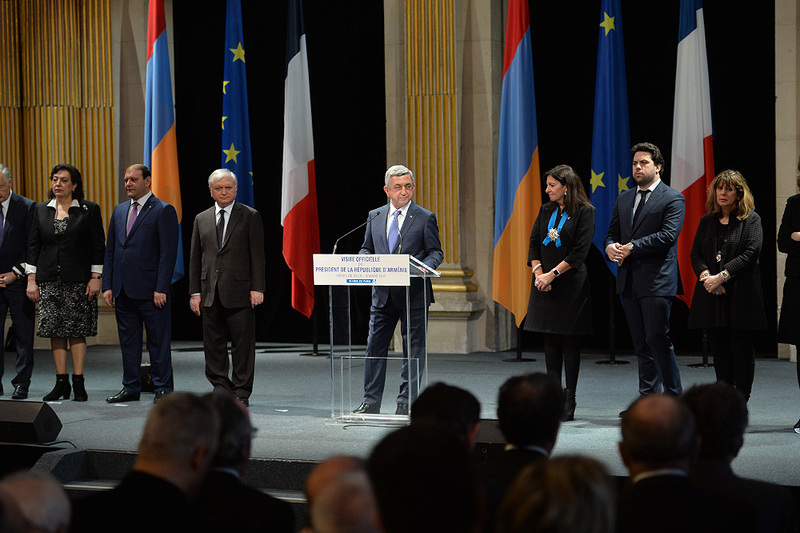 Immediately after Armenia regained independence, France stood by our young state and from that day on has been unequivocally supporting the advancement of our statebuilding processes, also as a reliable partner in the European and international settings. Only a country, which is strong with the principles that withstood the test of time, can offer such friendship, with the readiness to share its own exemplary experience and own accomplishments. 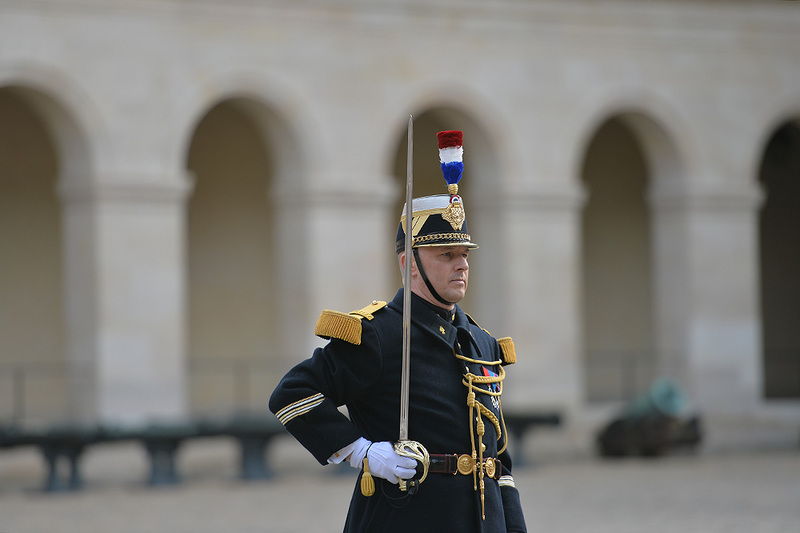 This is what makes the French spirit unique for us. As much as France stands by Armenia, Armenia cares the same way about France. 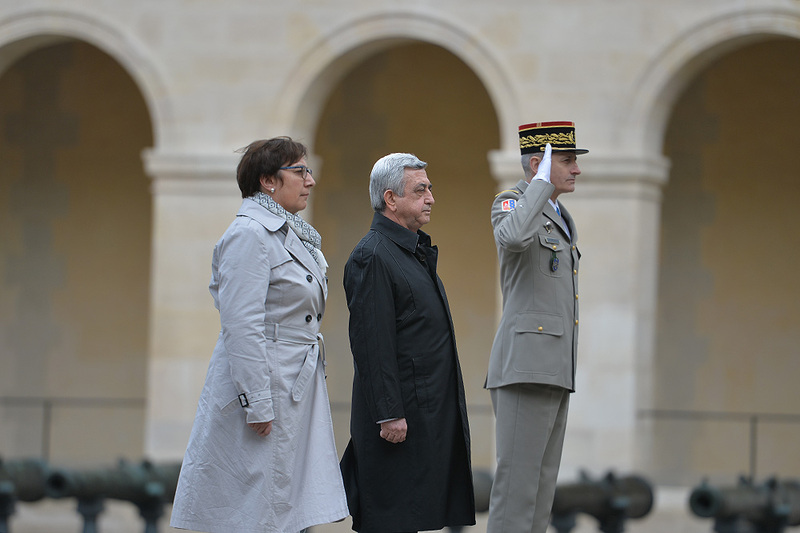 We felt enormous pain in Armenia when the bloodcurdling terrorist attacks happened in Paris, Nice and other places in France, killing innocent people and derailing the normal life of the French nation. We cannot change the past, but the tenacity of the French people and authorities in facing that horrendous challenge is exemplary. Commendable also France’s and personally yours, Mister President, approach towards the explicit condemnation of the greatest tragedy of the Armenian people. Really, one never knows where one will find consolation and hope. When the Armenians, who had survived the Genocide, arrived to this distant land, thanks to the great French nation they found solace and hope. They built their homes again and started to create again. 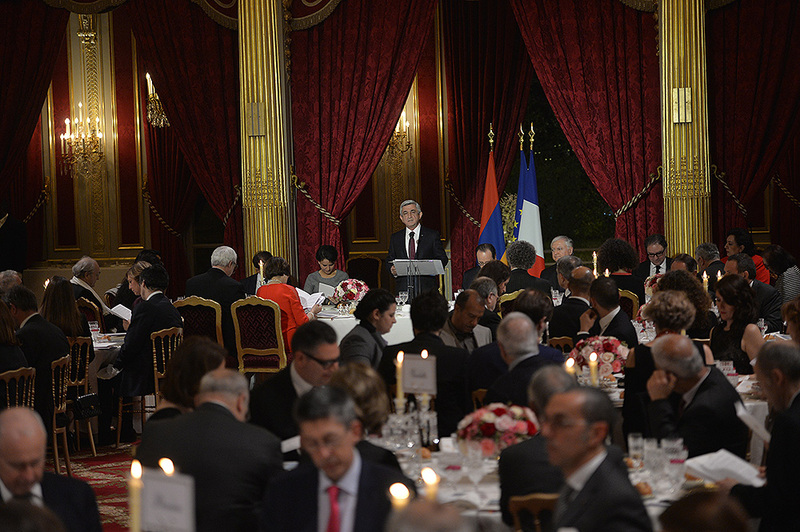 It is no accident that the Armenian community of France is known to the world for its high level of integration and at the same time for remaining true to the rich national culture and traditions. This phenomenon has been very well defined by our great performer Charles Aznavour who said, “I am 100 percent French and 100 percent Armenian.” This is a source of pride for us and also a very emotional issue. Without overloading you with the details of the NK issue, I would only like to say that our goal is peace. Nobody has ever achieved anything good with arms, and peace is established where there is the understanding of the necessity to listen to the other party and make reasonable concessions. It is obvious that peace is not the absence of disagreements but the ability to solve them peacefully. Trust is the first and foremost condition for friendship. 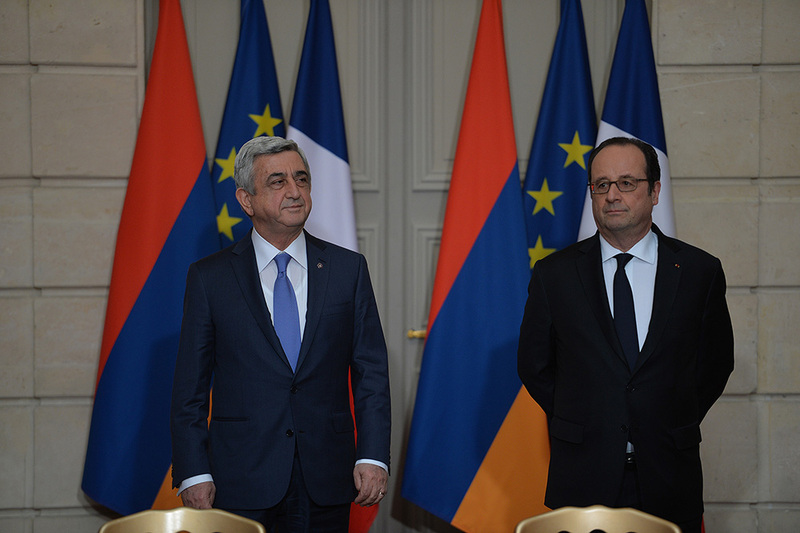 Let the Armenian-French friendship never lacks trust. 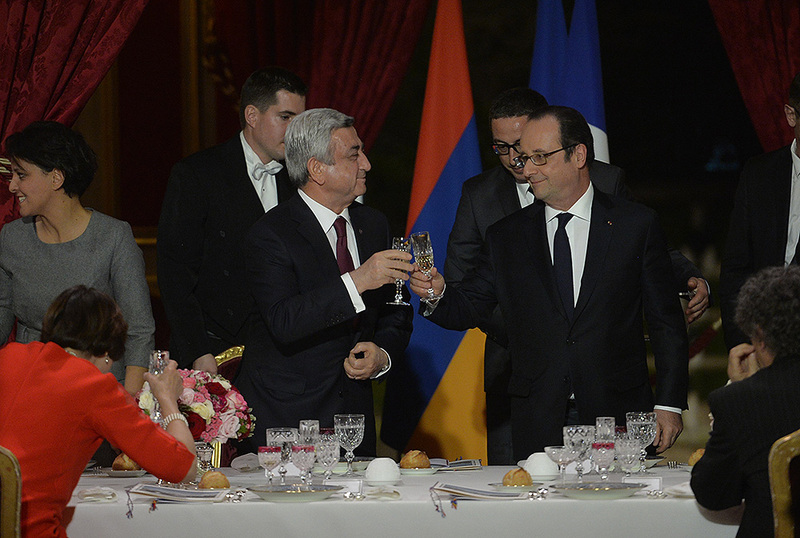 Let’s raise our glasses for the distinguished Mister President, for France, for its talented and hardworking people, for the glory of the everlasting Armenian-French friendship. It is a great pleasure to welcome you in France again. Today is March 8, the International Women’s Day which is a holiday in Armenia. 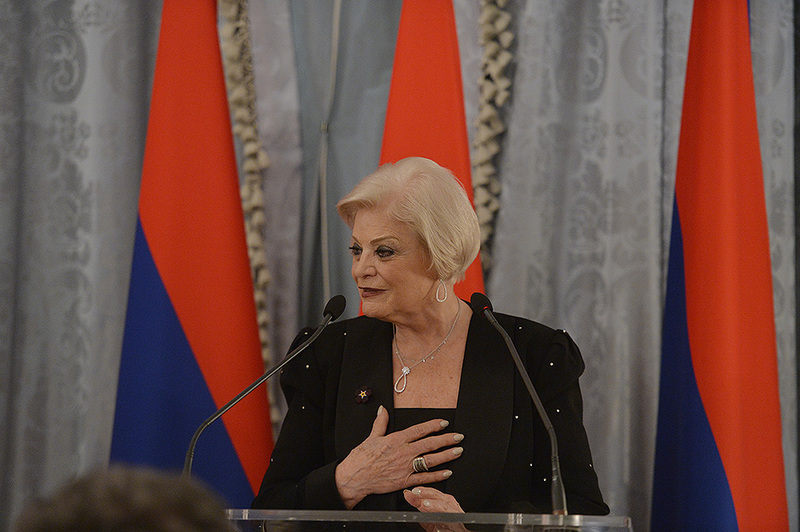 For that occasion, invited to the reception are the women, who are not only famous for the development of the Armenian-French relations, but also for the protection of the values which our two countries share. We are celebrating the 25th anniversary of the establishment of diplomatic relations between our two countries, but our common history is not limited to 25 years. 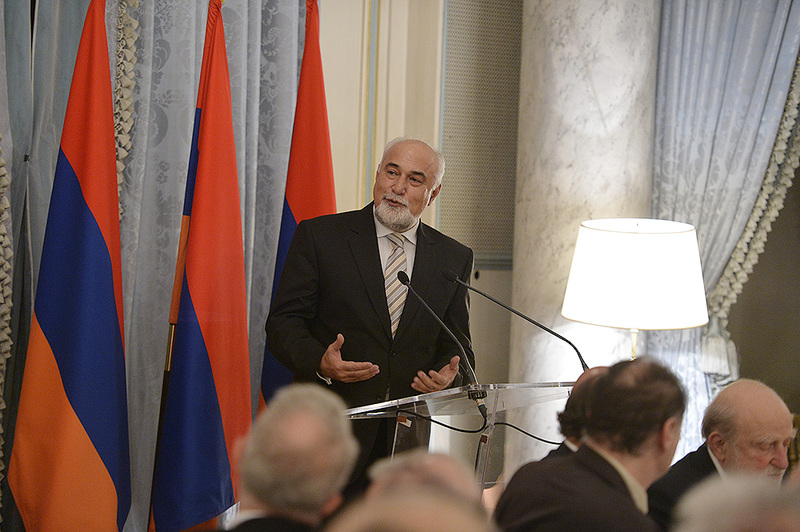 The Armenian-French community is one of the most powerful communities in the world. 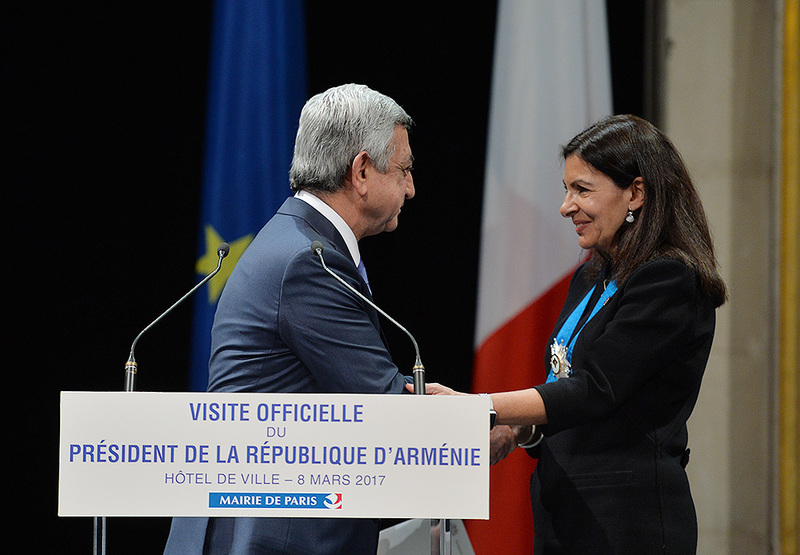 France knows what she owes to the Armenians who fought for our freedom. They fought on our land for the values which we share today. After the victory, they participated in the reconstruction, just as they had done after World War I. Today they work for the glory of France in all areas of arts, science, movies, culture, song performance, literature, and economy. For me, it was a great honor and duty to be in Yerevan on April 24, 2015 during the Centennial of the Armenian Genocide. 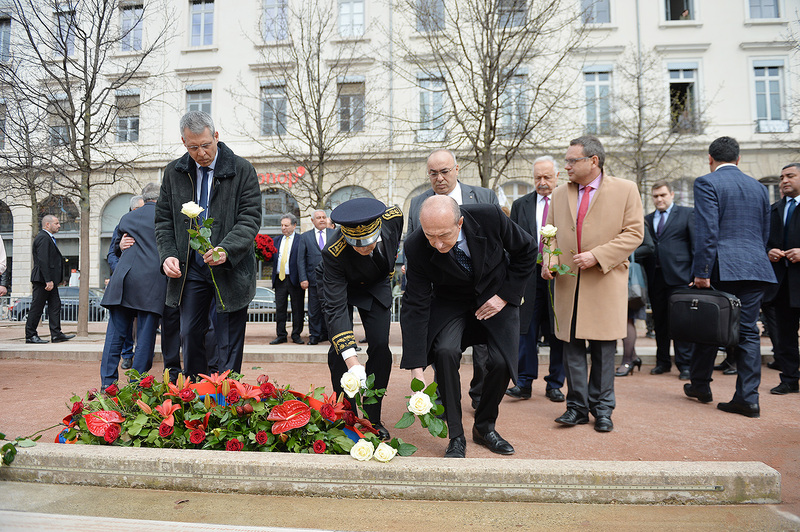 Laying just one carnation by the flame, I wanted to give my pledge to the struggle which France has been carrying on so that that tragedy, which resulted in the extermination of a part of the Armenian people, while the other part was scattered all over the world, is not forgotten. We always have to fight against oblivion, against denial because the first as well as the second have only one consequence – make today’s massacres possible. You are aware of my commitment on this issue and on the legislation for the criminalization of the words and writings on the denial of the Armenian Genocide. I will not speak of the things that were done after January 29, 2001 when the law was adopted which stated clearly that France publicly recognized the Armenian Genocide of 2015. As you know, the Constitutional Court, whose decisions are mandatory for all, ruled that such a law damages disproportionately the freedom of speech. 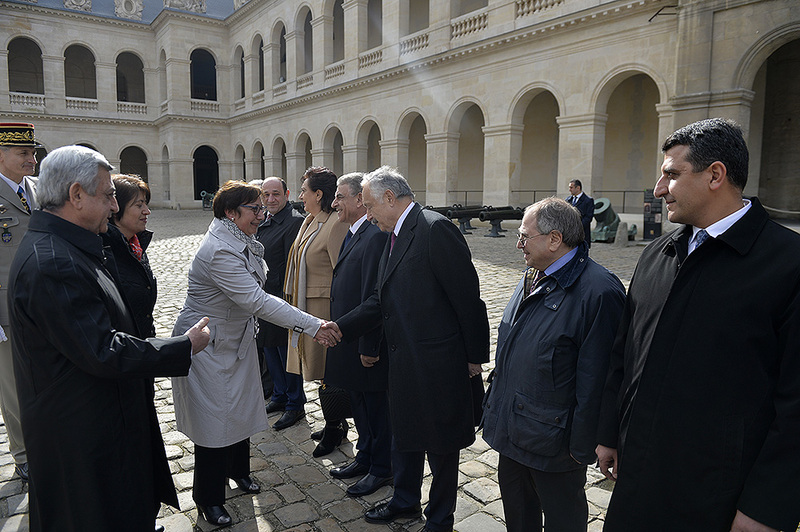 For that very reason, France will continue to promote the awareness related to the Armenian Genocide and dissemination of the scientific results so that the truth is accepted. We are working also towards the future. We want to stand by you, respecting your decisions. More than three years ago, you decided to join the Eurasian Economic Union. I personally pledged that that membership would not challenge the ties which you want to have with Europe and so that you were able to sign a new framework document with the European Union. It is always possible to build future. 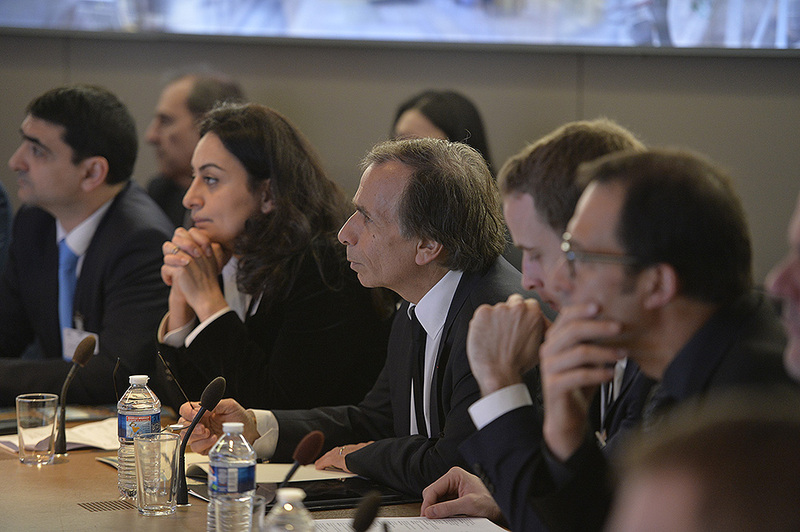 France strives to remain among the leading Western investors. I am well-aware of your efforts to make your country economically more attractive. Our entrepreneurs have grasped it, and currently France is present in the areas of agricultural produce processing, telecommunication, transportation and other areas. The French Development Agency is financing housing programs, development of rural infrastructure and especially, the irrigation system. It is also aimed at promoting the decentralized cooperation, which we support, and I am glad that many of the parliamentarians, who represent different regions of France, share this approach. In the area of education, for over 15 years the French University in Armenia has been teaching thousands of young people who speak French perfectly. I take this occasion to congratulate you, Mr. President, for accepting the responsibility of holding the next Summit of the International Organization of Francophonie in Yerevan. 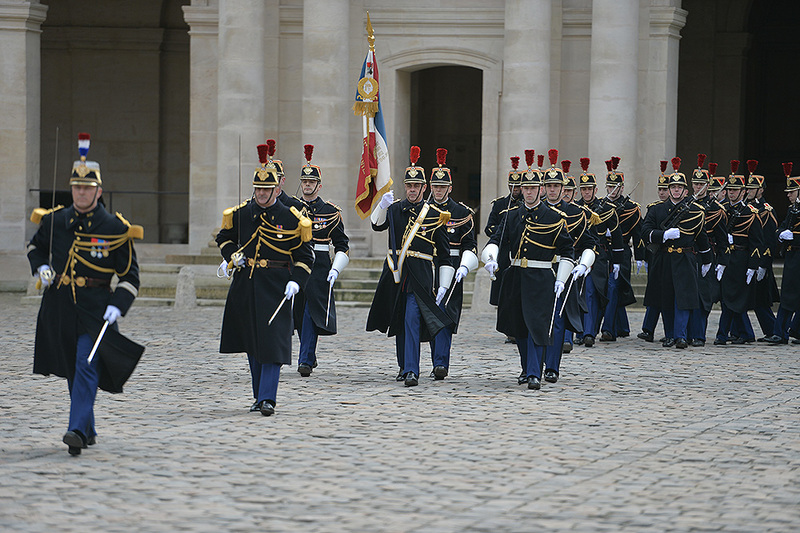 France stands ready to assist you in organizing this momentous event. To build a peaceful and safe future, we have to continue our efforts aimed at the resolution of the NK problem. You know the readiness of France, as a Co-Chair of the OSCE Minsk Group, to find a solution for this conflict. Clashes, which took place in April 2016, and recent events are tragic reminders of that. Nothing could be worse than the status quo. The parties have been negotiating for 23 years without a noticeable outcome. Many times, the solution seemed to be close. 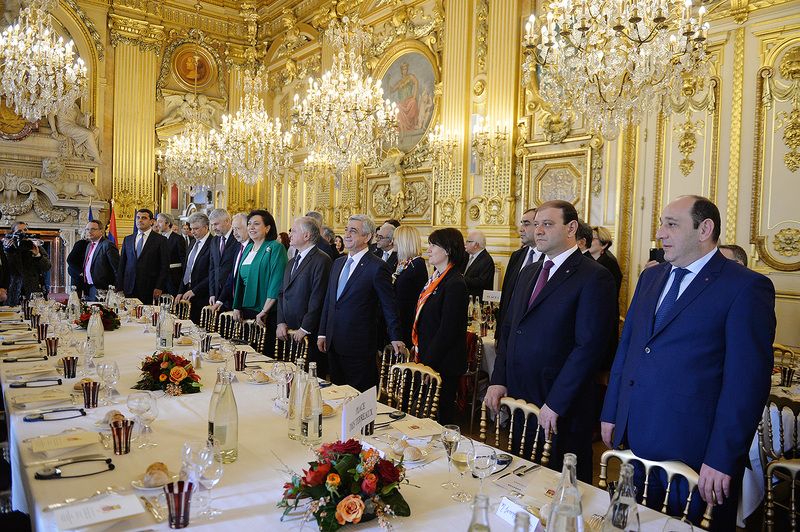 In October 2014, I took the initiative to invite you and your Azerbaijani colleague to meet in Paris. We registered progress on the painful issue of the individuals lost in the course of the conflict but were not able to move further. But negotiations have no alternative if we all agree that the conflict cannot have a military solution. 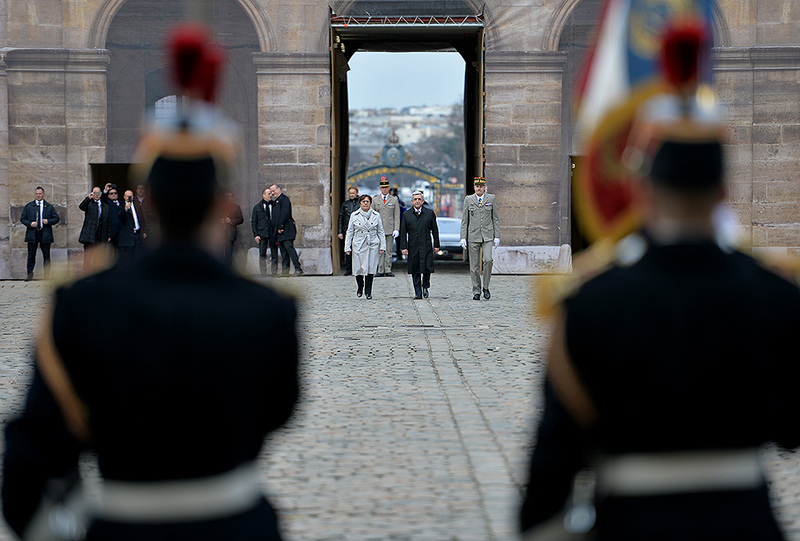 Together with the United States and Russia, France carries on with her mediation efforts. The conditions for the solution are known – Madrid Principles, whose main principles are non-use of force, territorial integrity, and right of people for self-determination. France is ready to support any initiative on this direction. Your presence here is a new sign of the deep and true relations which bind together our two countries. This is an honorable and compelling history for us; it sets the foundation for the friendship which is unshakable. For the friendship, which you have come to celebrate, I raise my glass for this unshakable friendship. 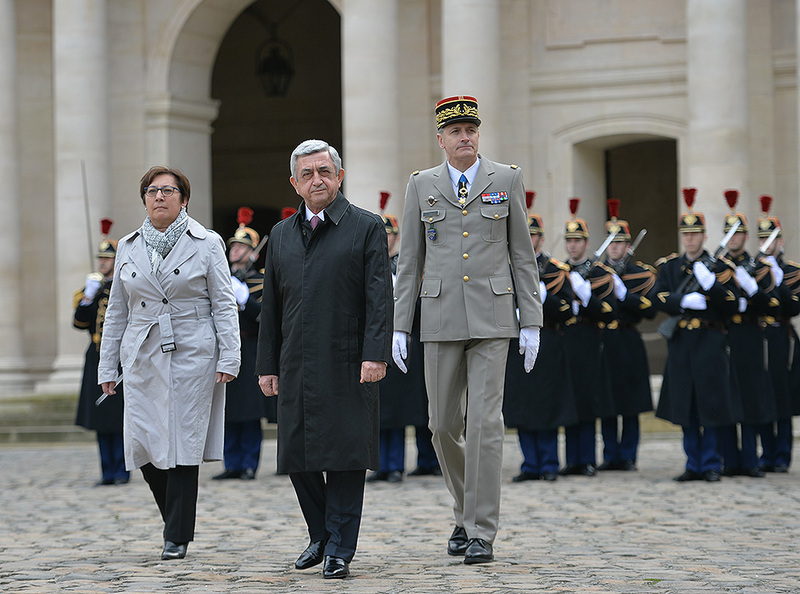 Long live the French-Armenian friendship! 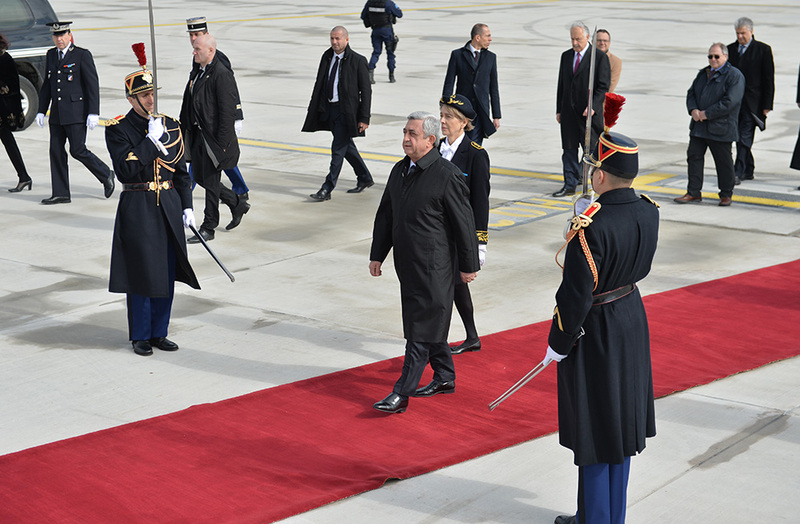 President Serzh Sargsyan, who is in France on official visit, left Paris for Lyon, which has a sizable Armenian population. 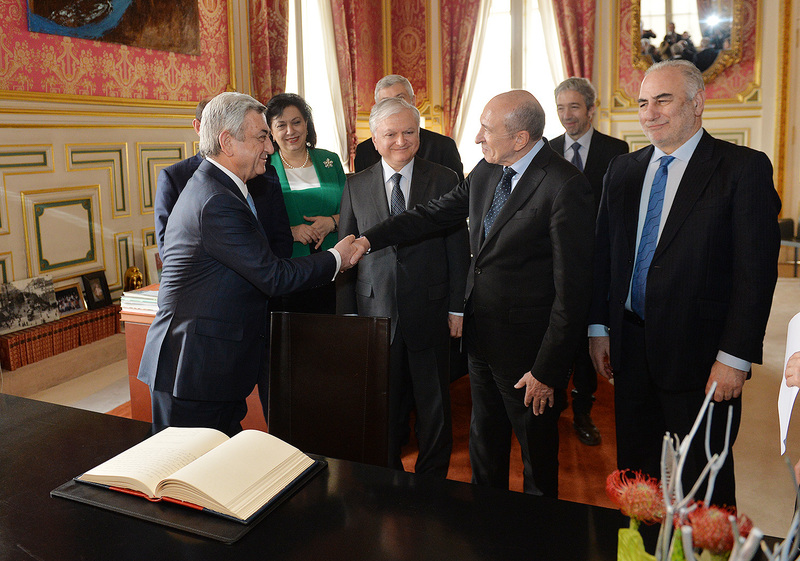 In Lyon, he met with the Mayor of Lyon Gérard Collomb. 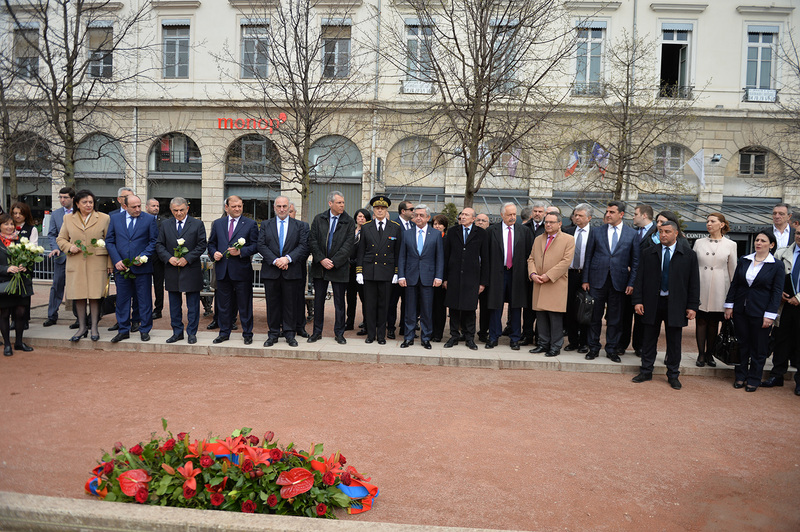 Before that, the delegation of the President of Armenia visited La Place Bellecour and laid a wreath at the memorial dedicated to the victims of the Armenian Genocide and paid tribute to their memory. 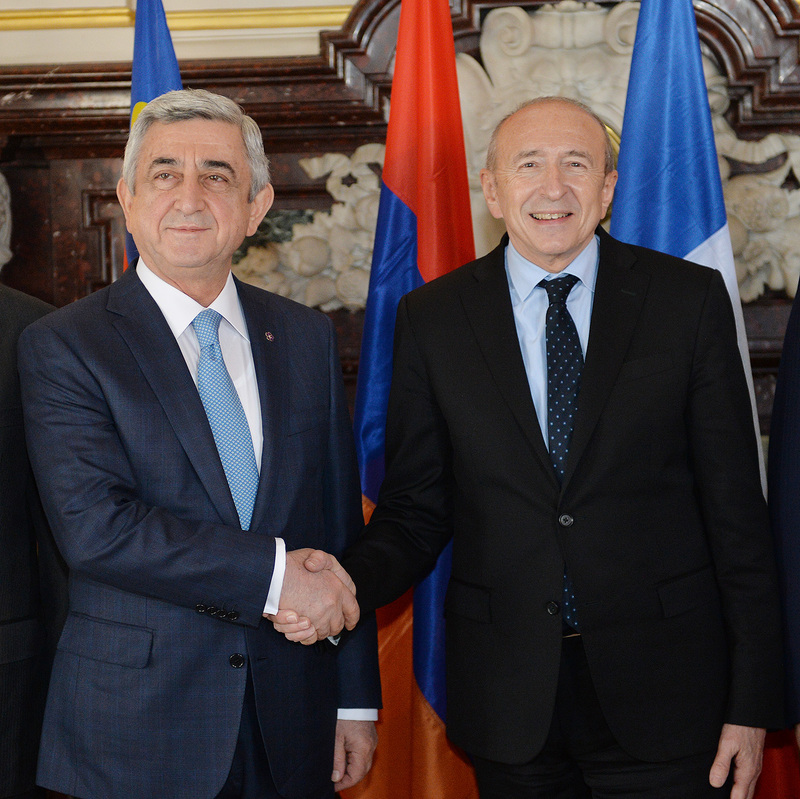 At the meeting, which took place at the City Hall, President Sargsyan thanked Mayor Collomb for the warm welcome and noted that their meetings are becoming a good tradition which should be used for the expansion and strengthening of the bilateral relations. 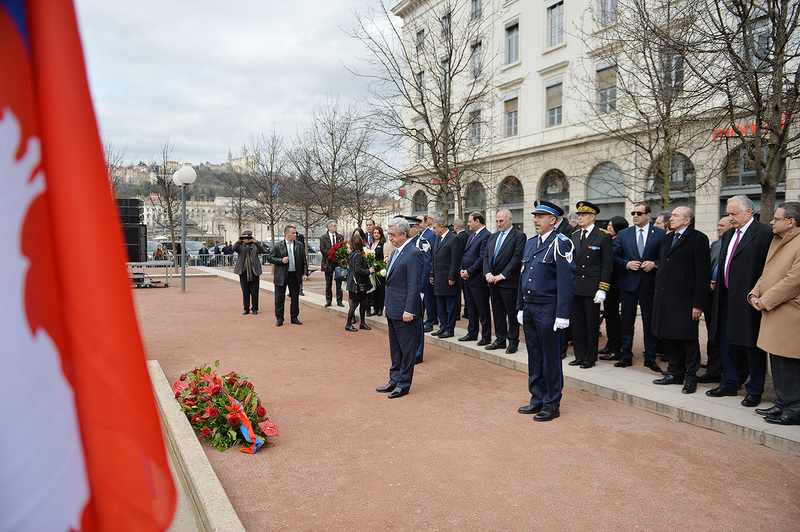 The President of Armenia expressed confidence that Lyon - one of the best cities in France - is developing by year, which is also a personal achievement of the mayor since he has dedicated a large part of his life and work to this city. 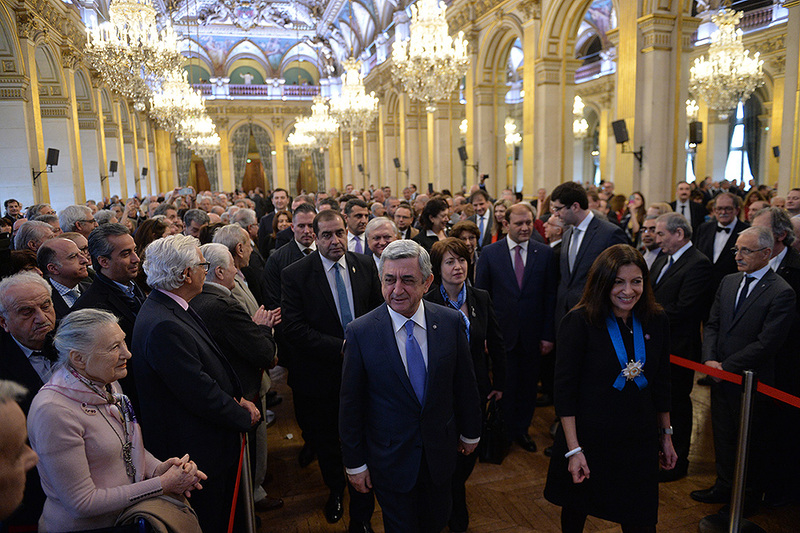 Serzh Sargsyan said that he was aware that Mayor Collomb is very considerate towards the issues which concern the Armenians and expressed gratitude on the occasion. 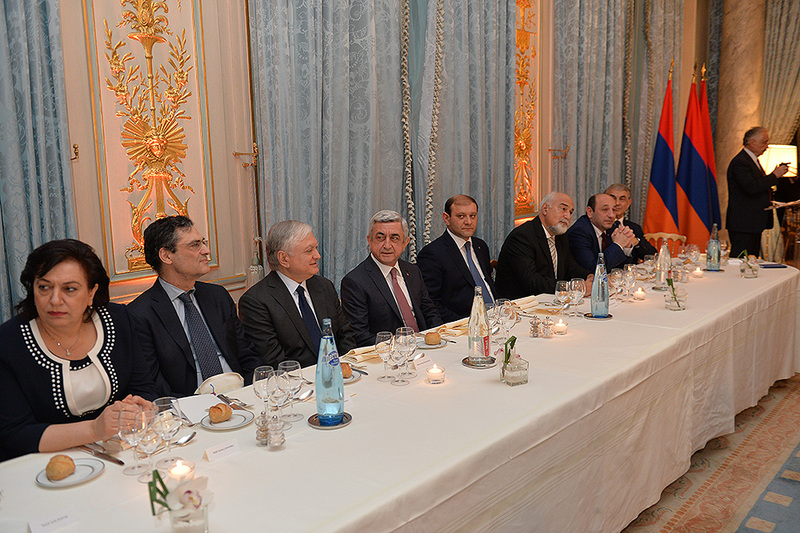 President Sargsyan expressed hope that Gérard Collomb will continue to use his valuable experience and knowledge to promote cooperation between Lyon and Yerevan. 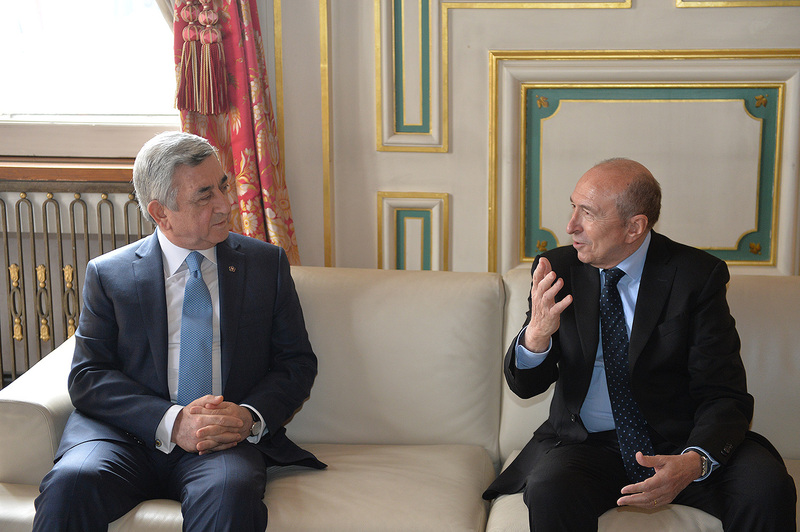 The President of Armenia assured that the efforts of Mayor Collomb aimed at the strengthening of the friendship of the two peoples, as well as his years-long principled position on the Armenian Genocide do not go unnoticed. At the meeting, the parties discussed decentralized cooperation, issues related to the deepening of cooperation in the areas of science, education, economy and other areas. 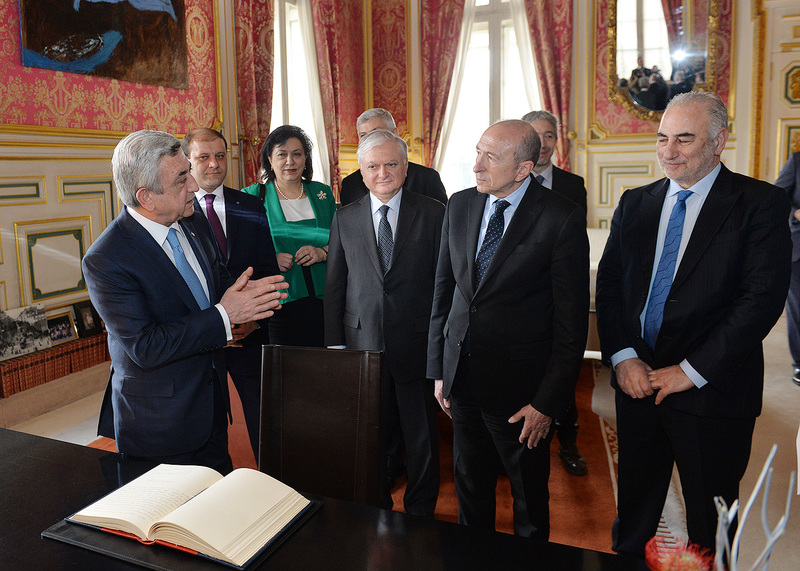 In the Lyon City Hall, the President of Armenia also made an inscription in the Livre d’Or, “ I return each time with a great affection to Lyon which has become so dear to me, which enchants with its beauty, harmony, boundless vitality, and a creative atmosphere. These are features which are inherent to the Armenian nature and identity. 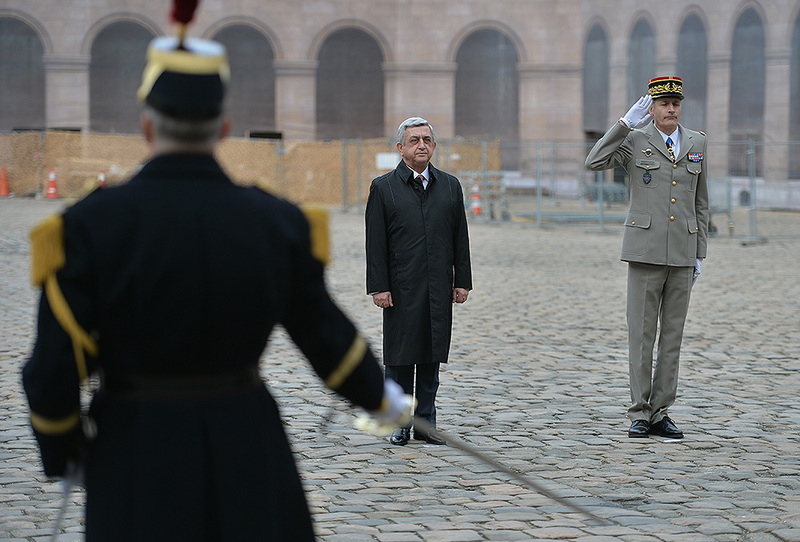 I am thankful to the authorities of Lyon for the hospitality extended to the Armenian delegation, for accepting our compatriots with open hearts at the difficult moment. 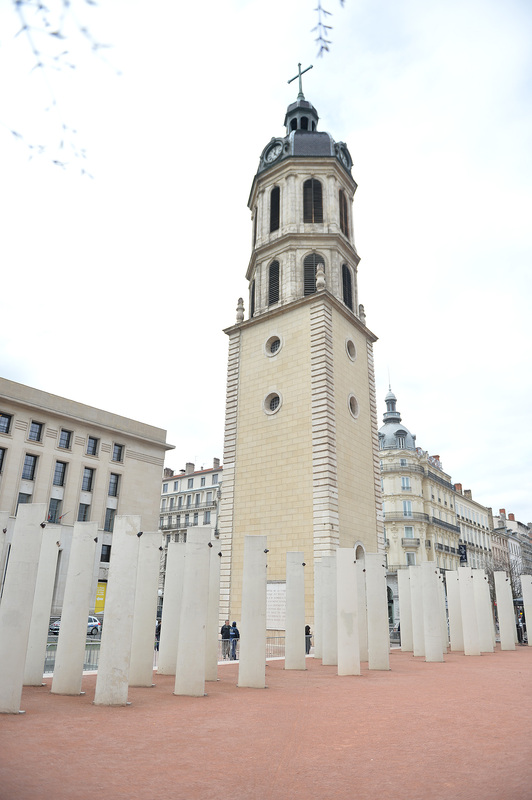 I am proud that as much as this city has been hospitable towards the Armenians, the Armenians, who have re-found their homeland here, in return love and enrich Lyon. 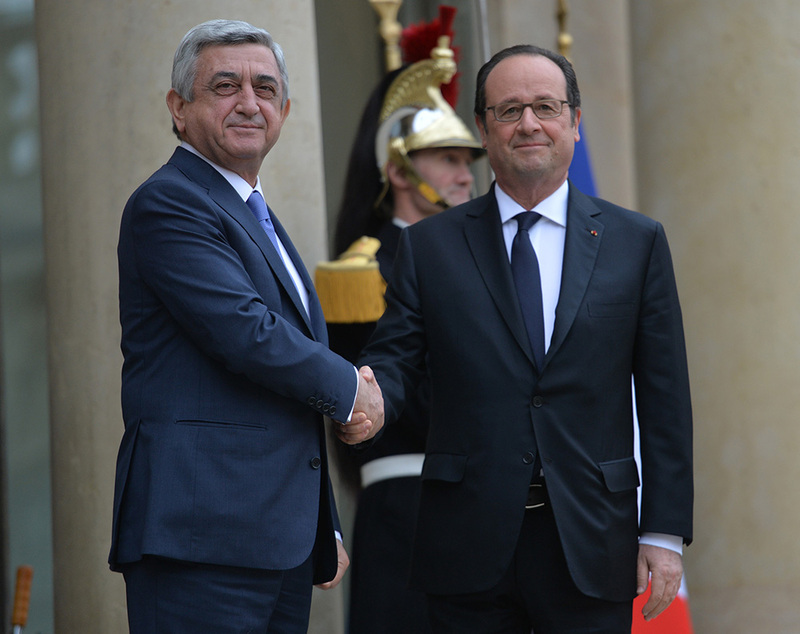 Let the Armenian-French friendship always be mutually enriching,” wrote the President of Armenia. 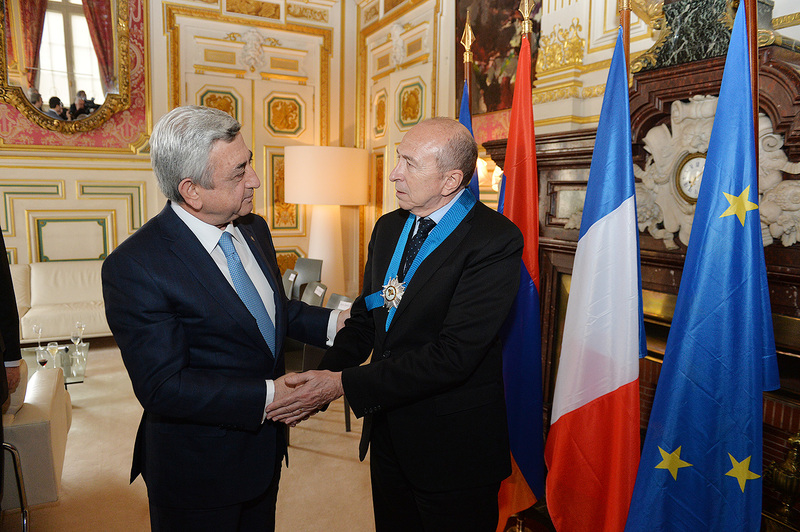 At the conclusion of the meeting, President Sargsyan awarded Mayor Collomb with the Order of Honor for his considerable contribution to the strengthening and development of the Armenian-French friendly relations. 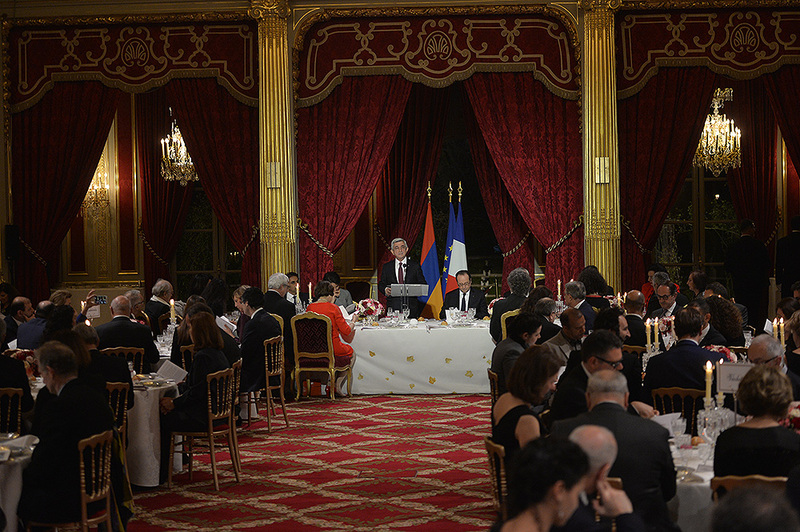 In honor of the President of the Republic of Armenia, Mayor of Lyon Gérard Collomb gave an official dinner.